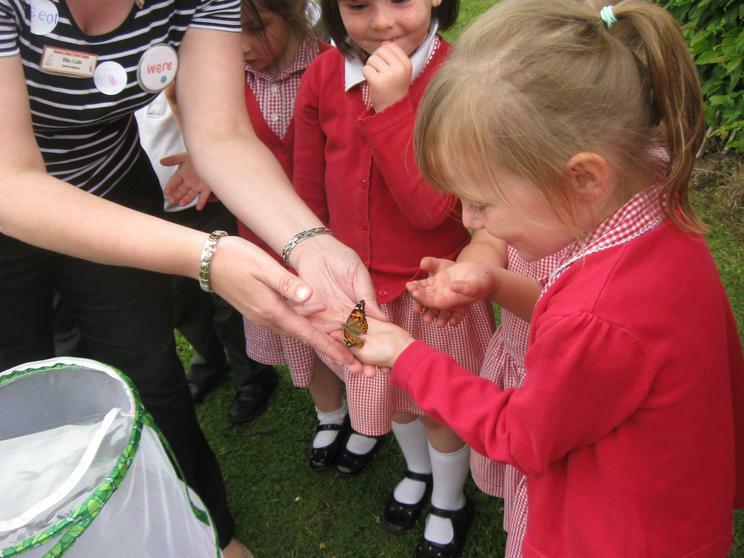 Butterfly and frog release day! 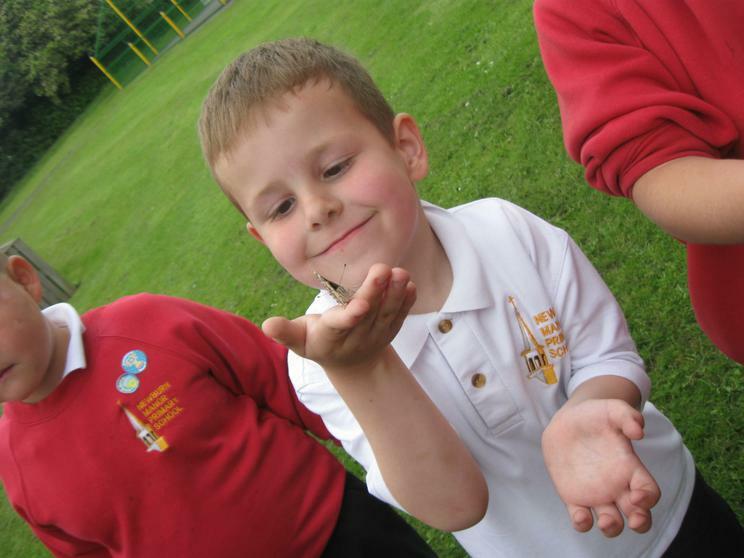 It was a warm sunny day today so we decided it was a good opportunity to release our creatures back into the wild, where they belong. 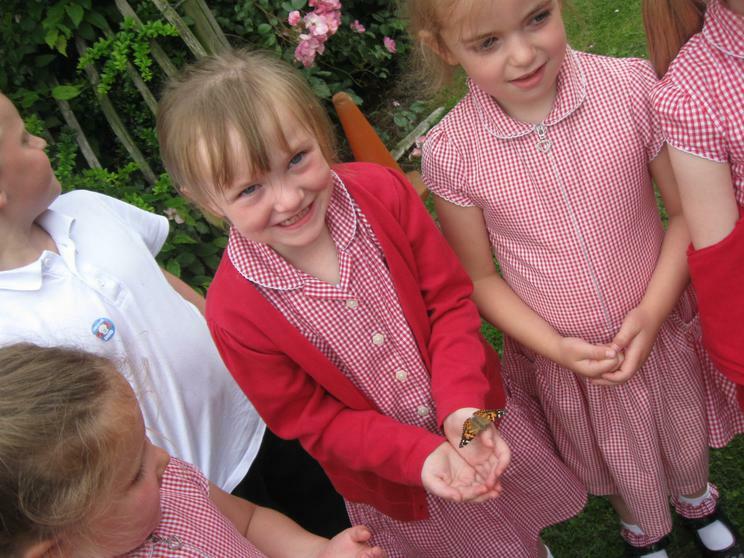 We have enjoyed watching our caterpillars and tadpoles grow and change, we will miss watching their development but realise they want to be free so we returned them to their natural habitat. 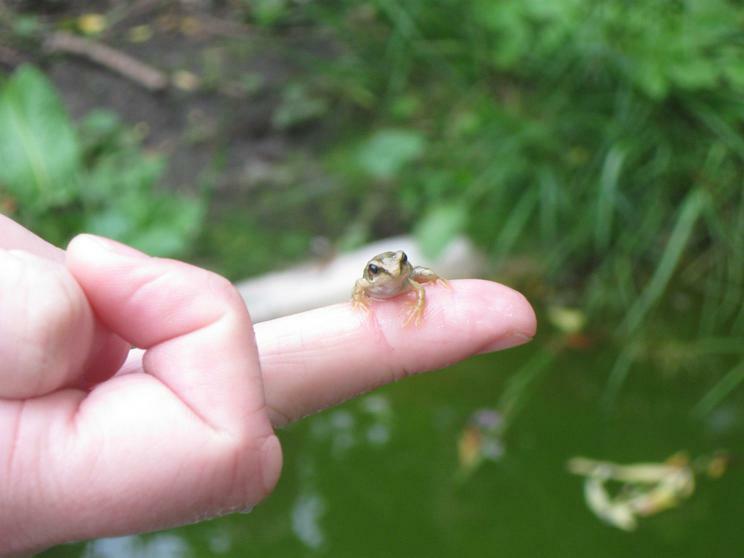 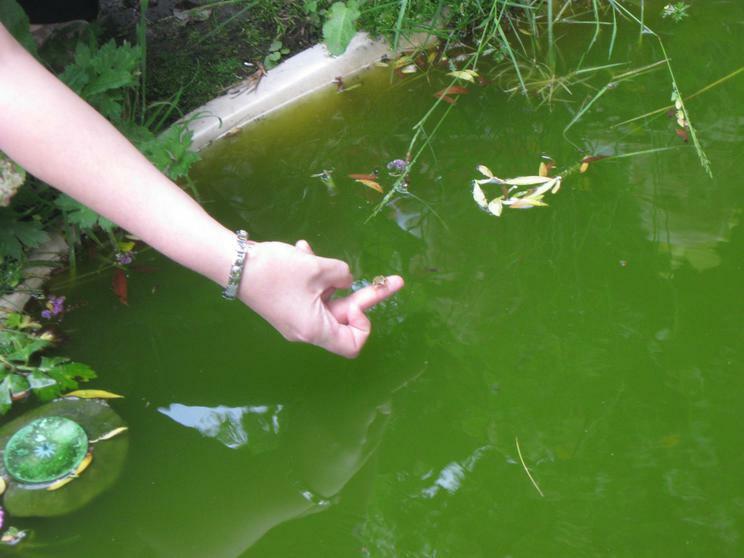 The froglets were first to go this morning, the tiny froglet sat on Miss Luke's finger before it hopped into the pond - we could still see it as it swam among the water weeds. 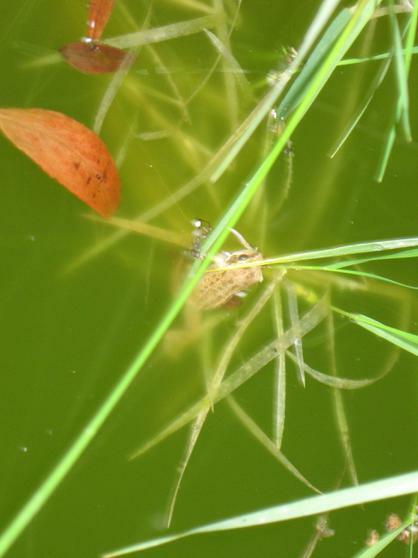 The other froglets swam out of the bucket, into their new home in the pond. 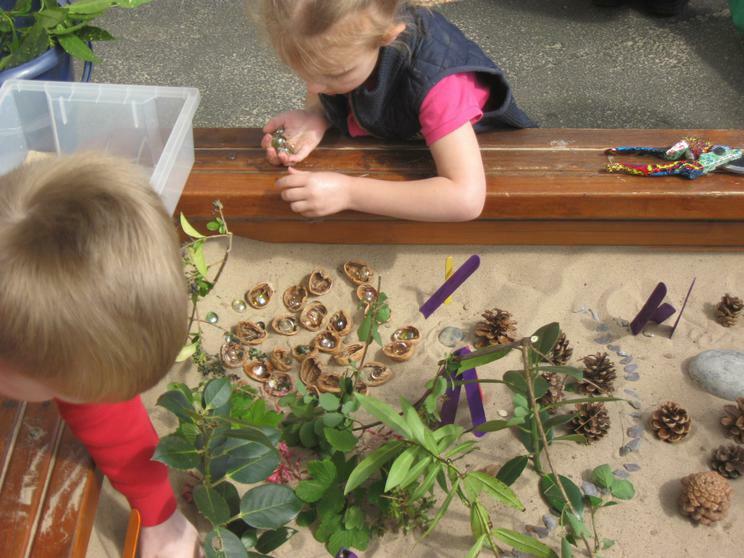 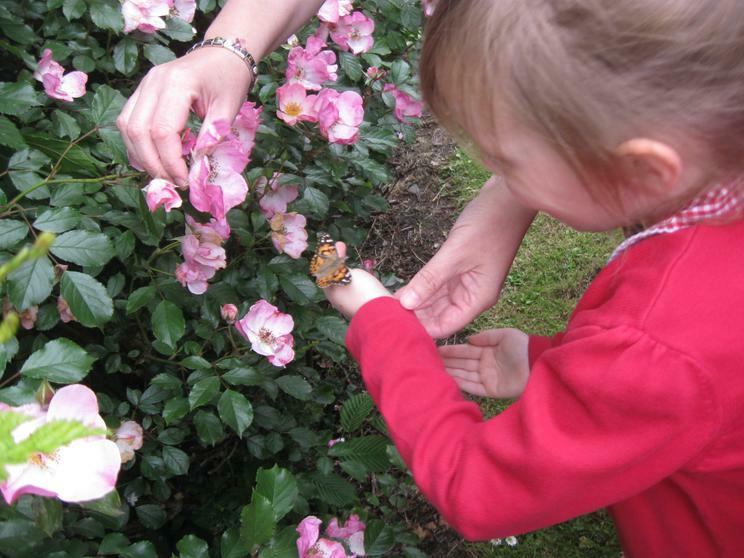 In the afternoon sunshine we opened up the butterfly garden, the butterflies were more reluctant to fly away. 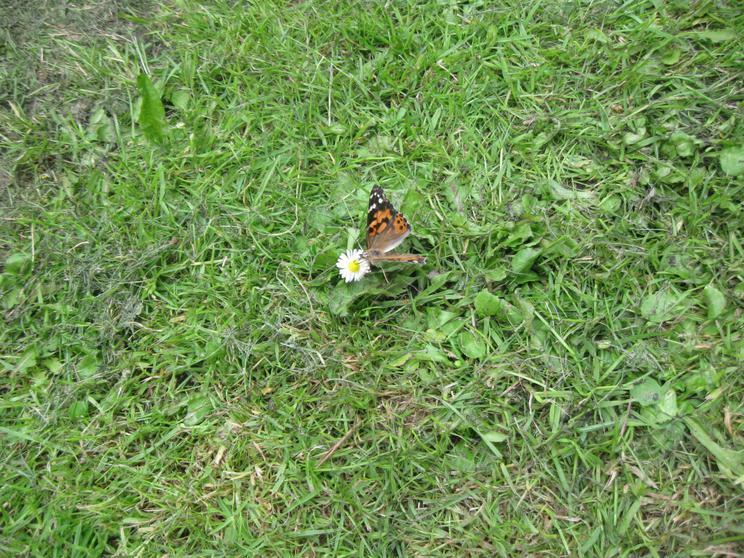 The first butterfly flew straight onto a daisy to feed on some nectar. 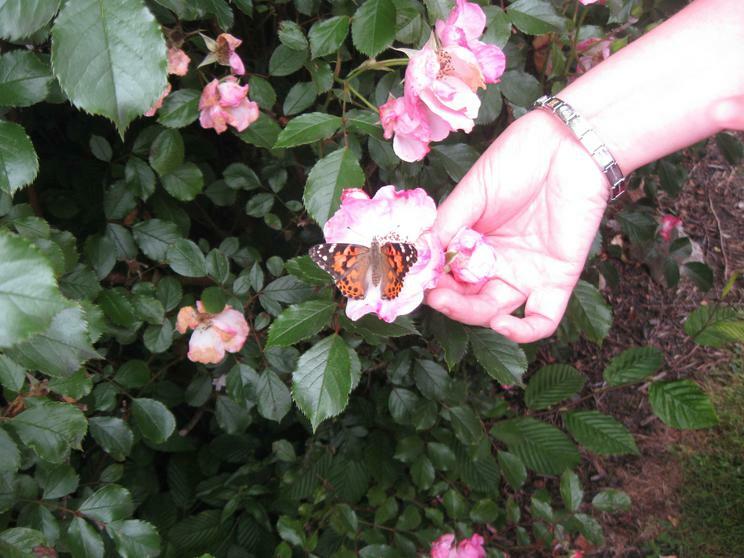 They were quite happy to sit on our hands before they fluttered away. 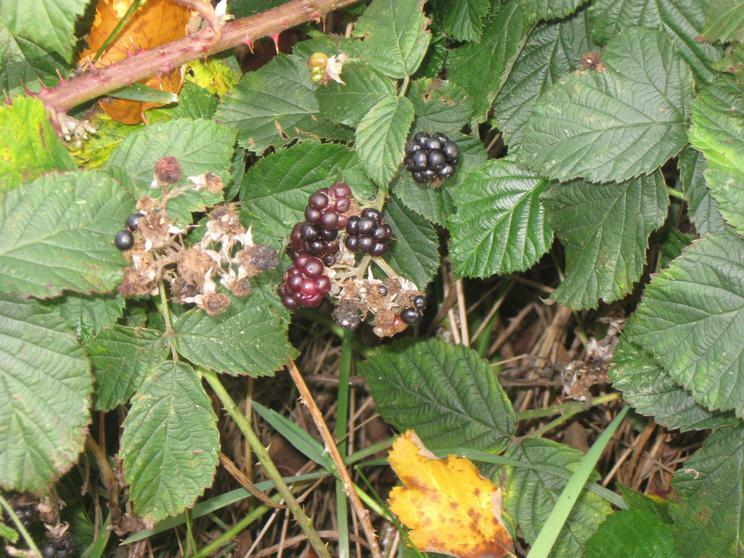 Some went onto the wild roses for a feed. 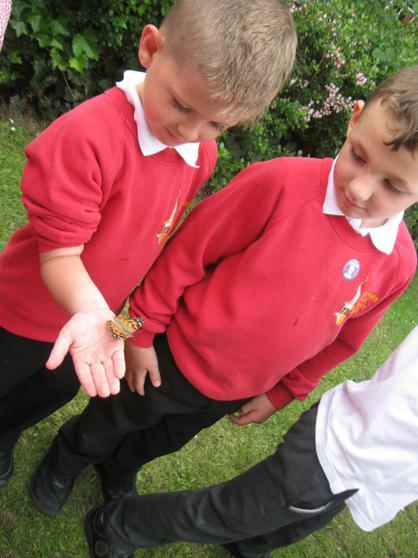 Goodbye, we will watch out for you flying around our school. 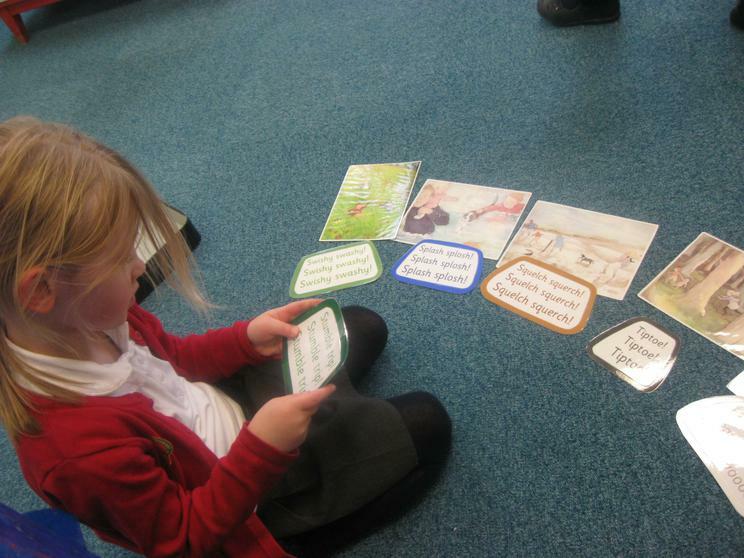 We couldn't decide which Life Cycle book to read next - life cycle of a dog, of a kangaroo or a sea horse. 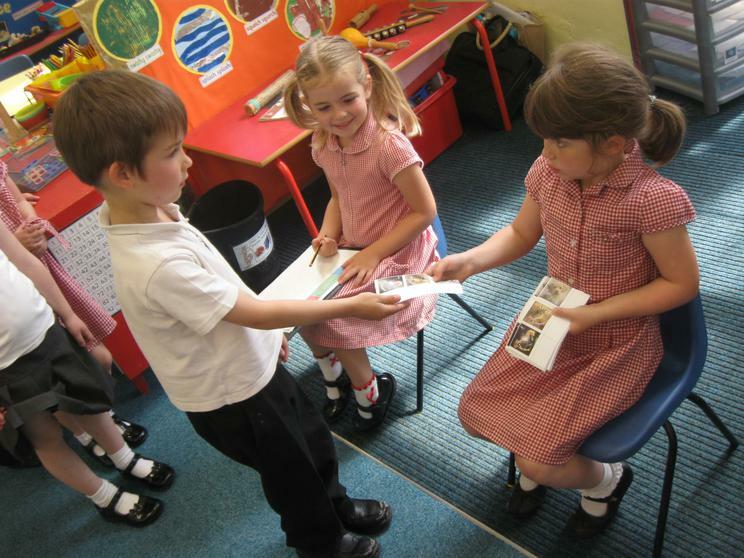 Different children wanted different books, so someone suggested we had a vote. 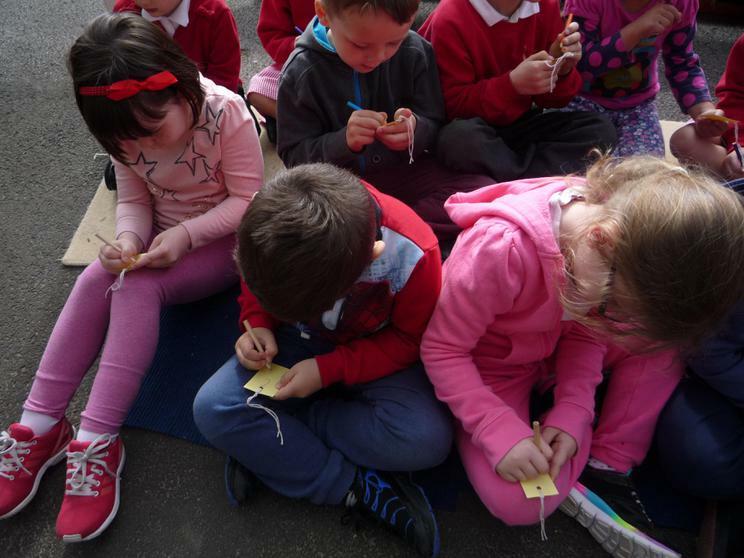 When I suggested that just the boys should vote the children thought this was unfair, so what about if people with blonde hair should vote - still not fair. 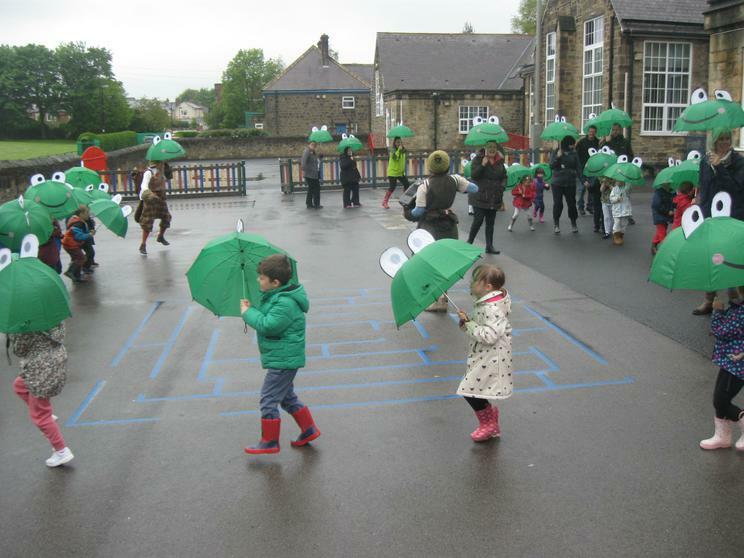 They thought it was only fair if everyone voted. 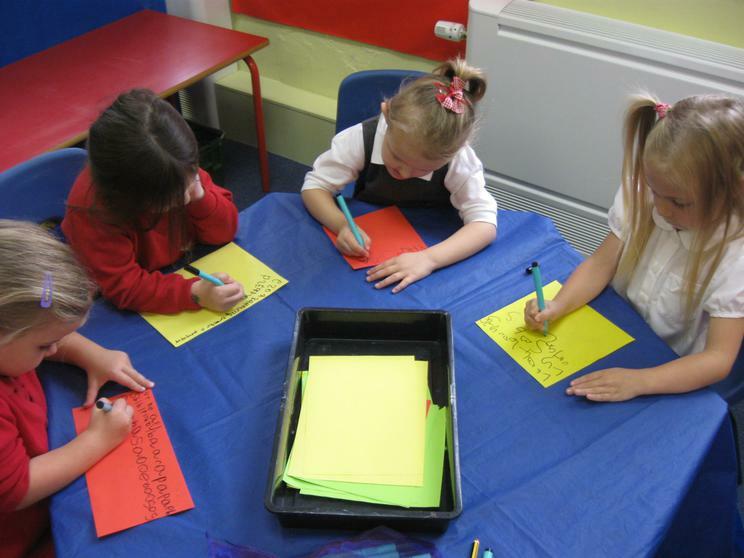 The children found it strange to hear that in some countries not everyone is allowed to vote, we are very lucky in this country. 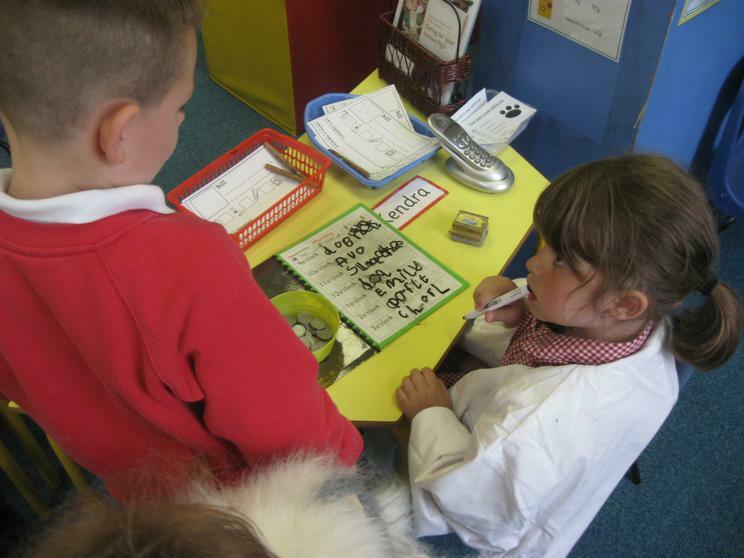 This is called democracy. 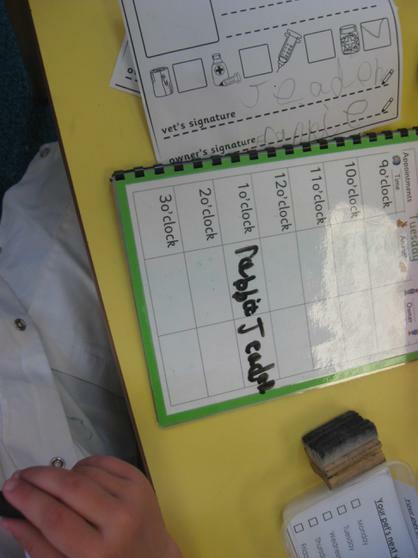 So we made some voting papers which we had to cross to make our choices. 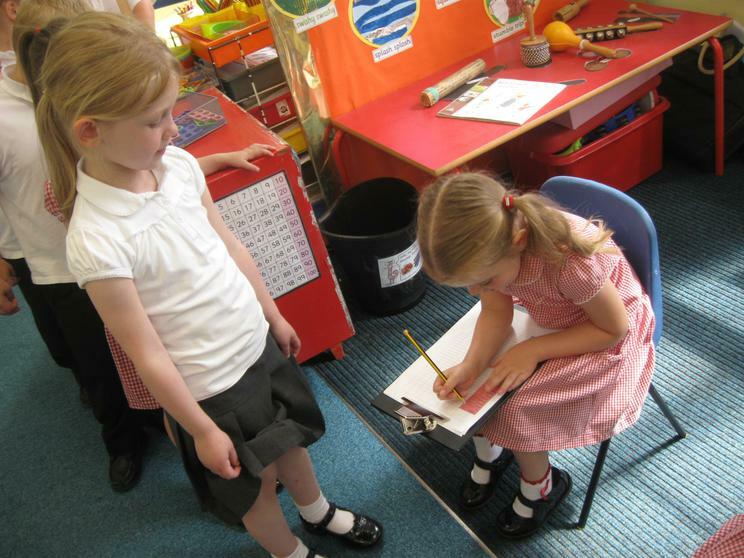 Our names were checked on a list and we took our voting slips to vote in secret. 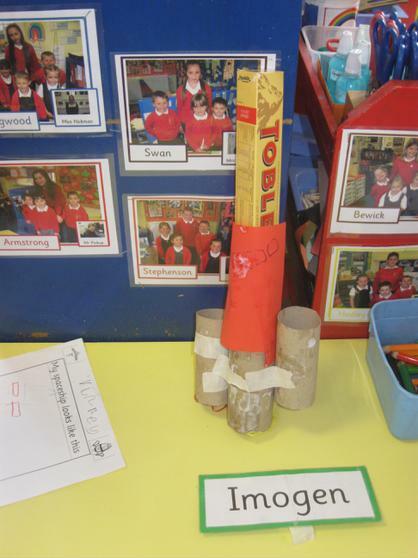 These were collected in the ballot box and we later counted them. 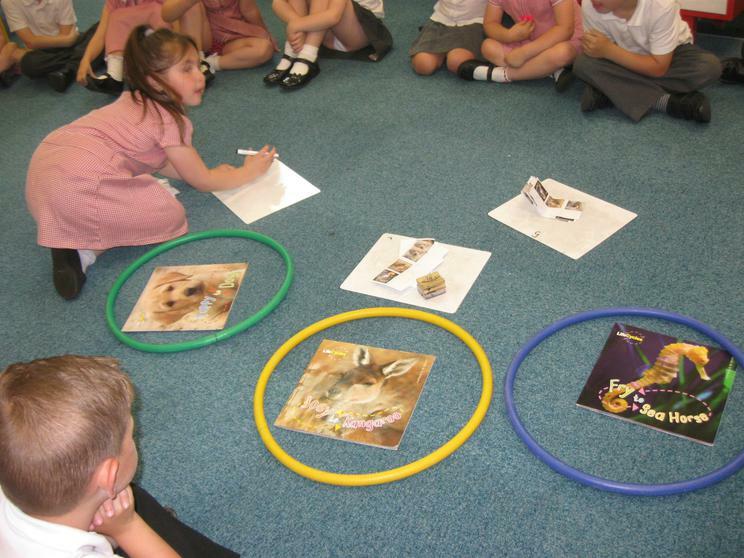 The life cycle of a dog had the most votes - so we read this together as it had been chosen democratically. 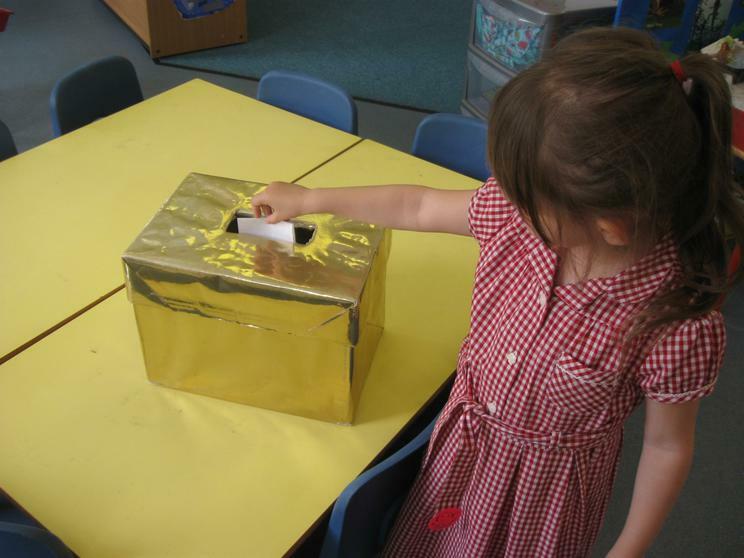 Our parents have an opportunity to vote today too, to help choose about important things which are happening in our country. 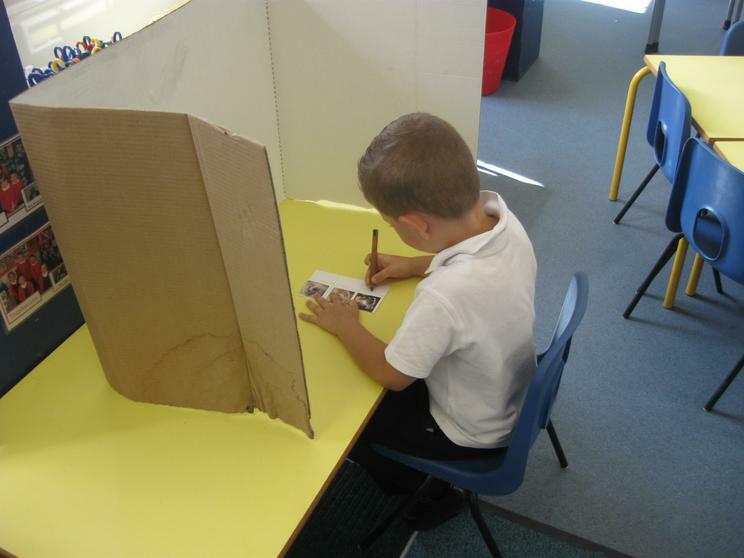 They will be able to vote in secret too, just like we did. 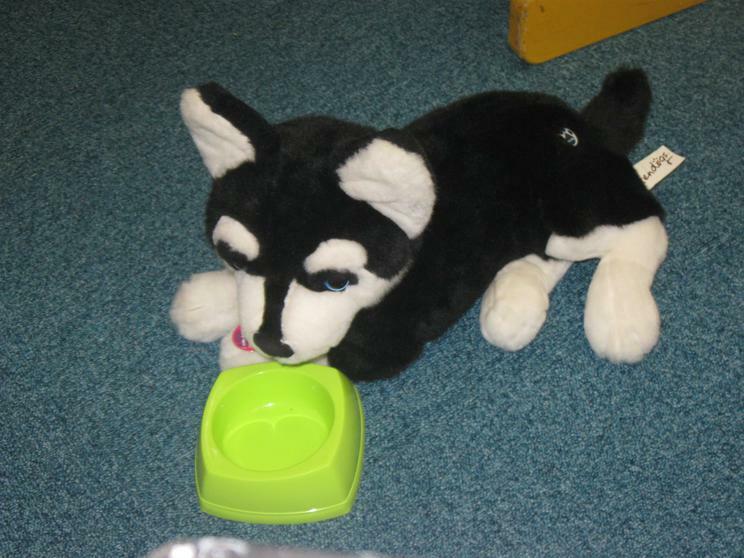 Sam has been telling us all about his new puppy and how to look after it. 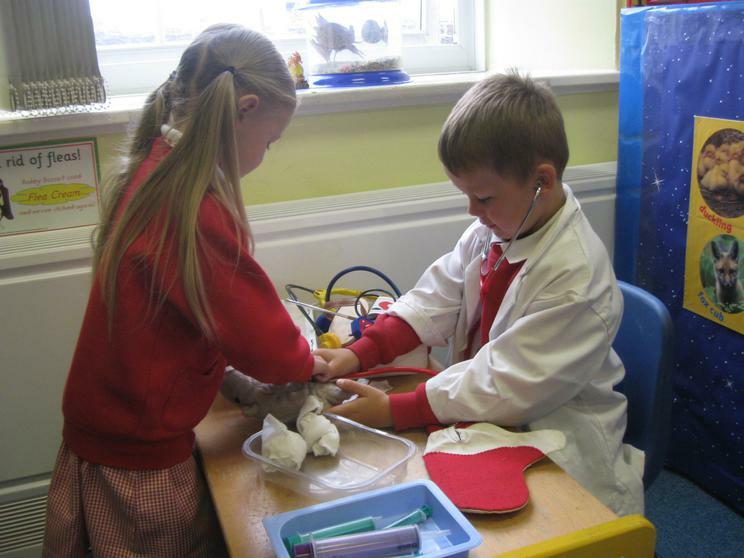 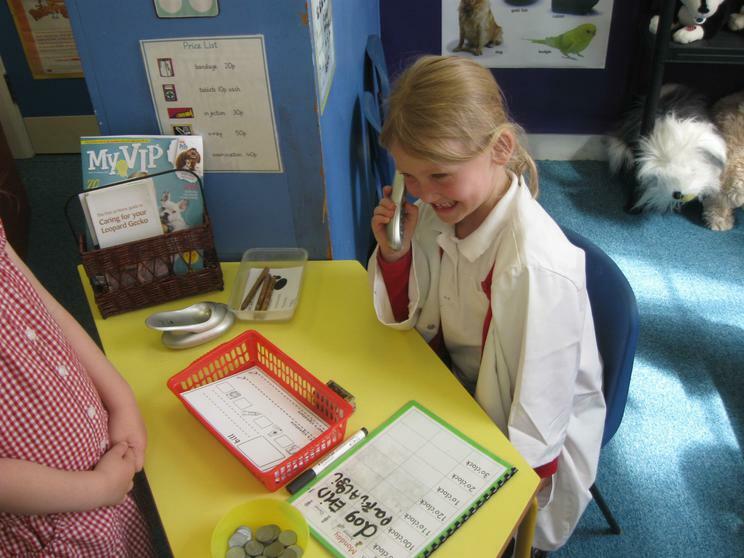 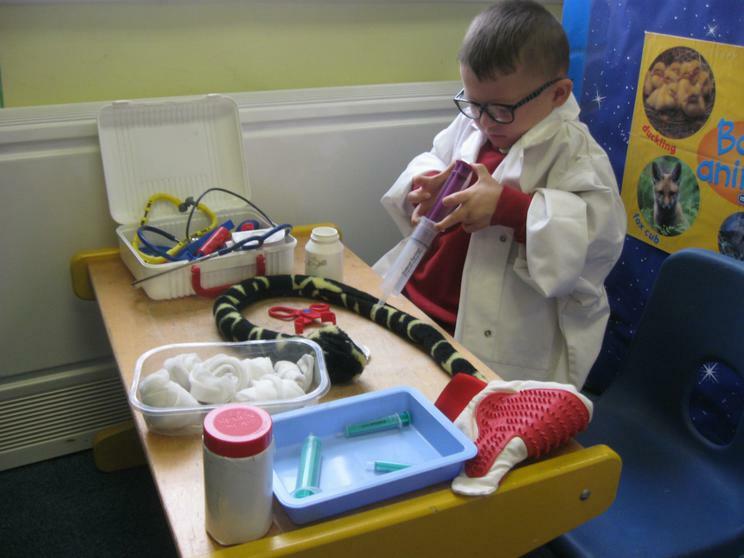 Many of us have pets so we decided to change our role play area into a pet clinic. 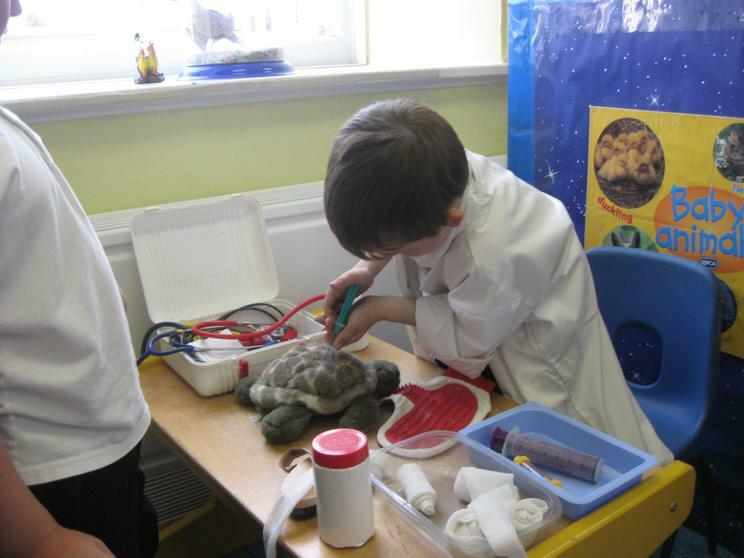 We have played in there this week with Miss Luke and have had a busy time taking care of these pets, giving them injections, putting bandages on injured parts, grooming them and exercising them. 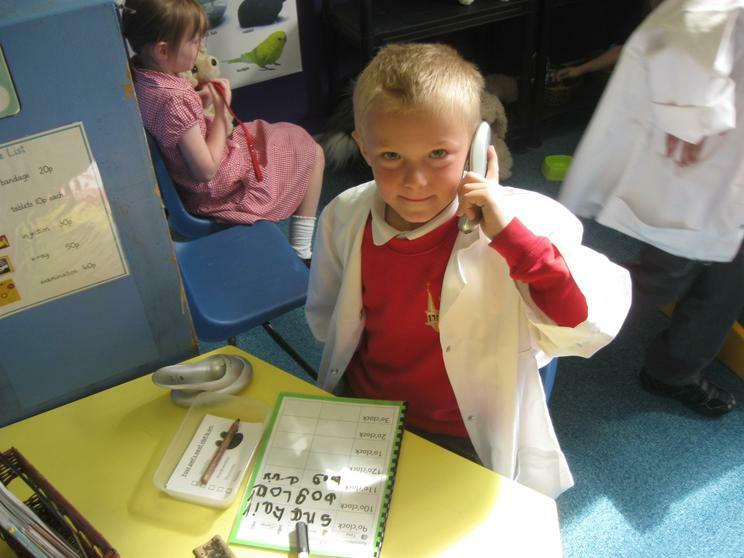 We also have to make appointments for their next visits, and take telephone calls too. 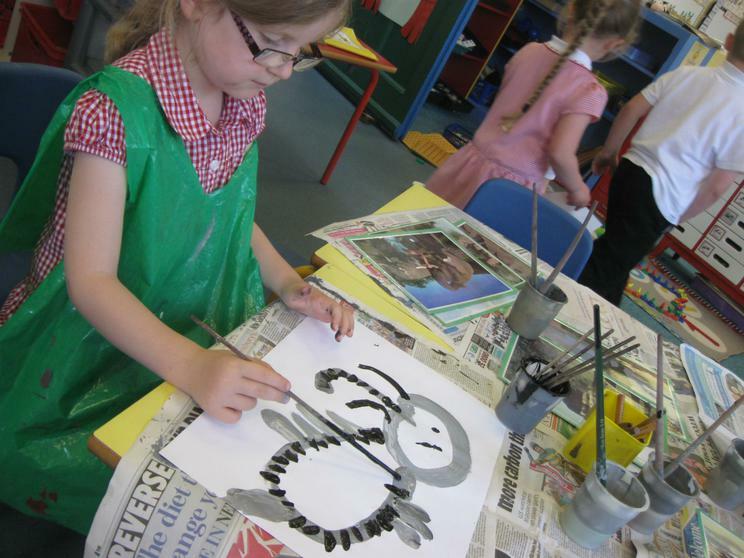 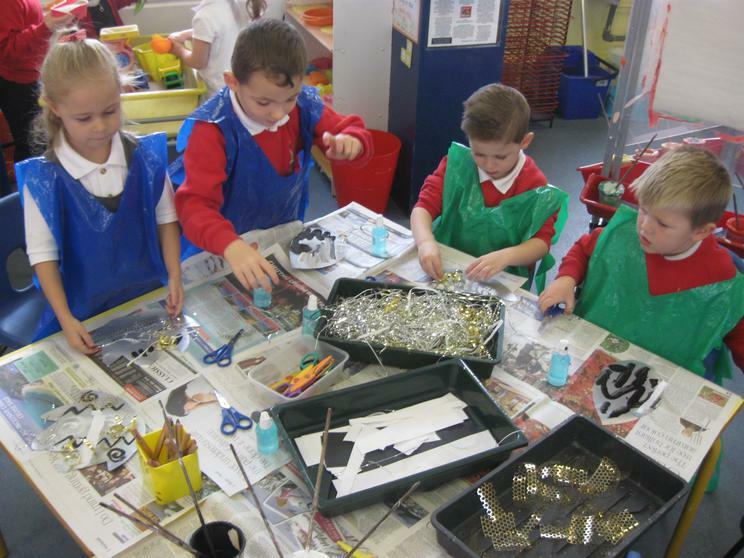 We have had a busy week during Art Week. 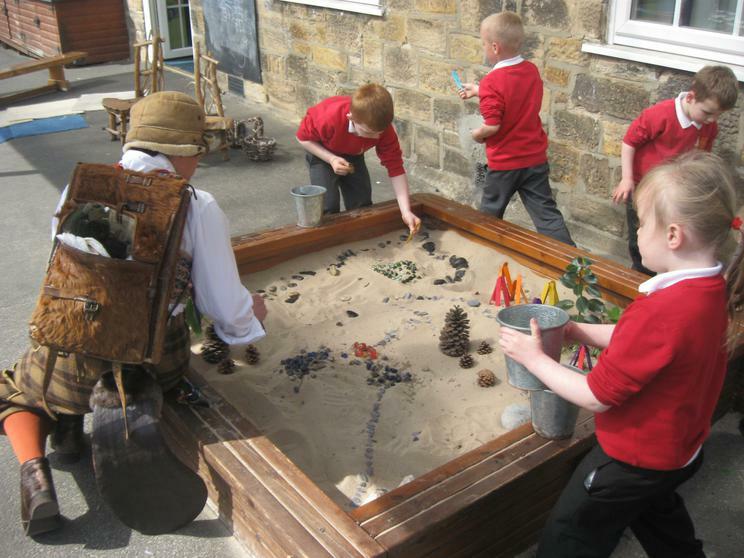 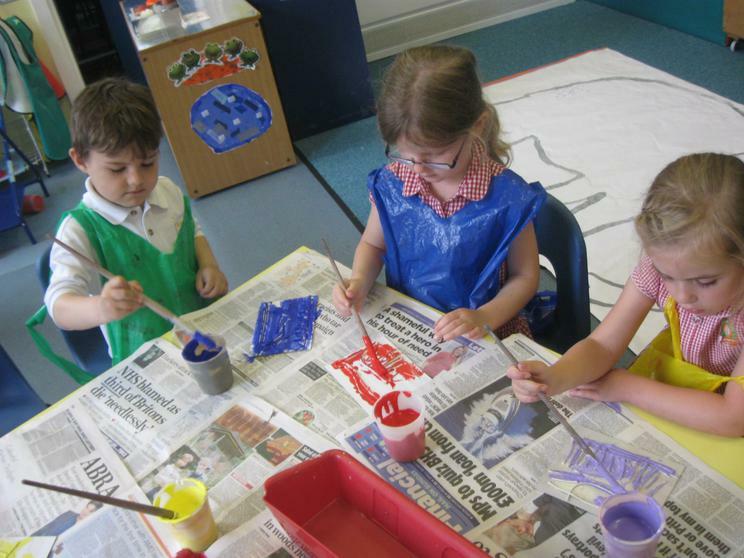 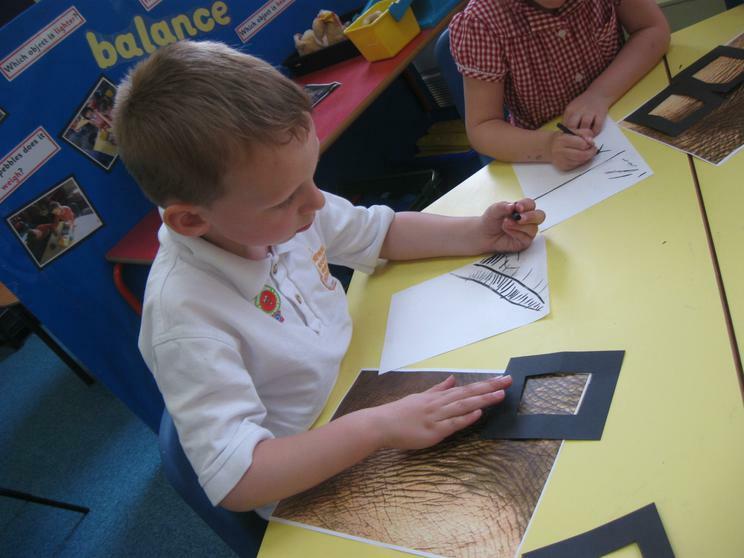 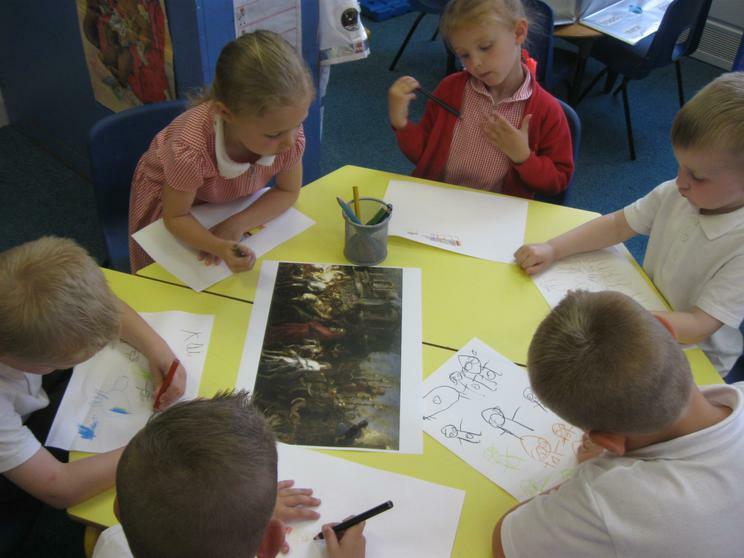 The activities began when we looked at a very old painting called 'Roman Triumph'. 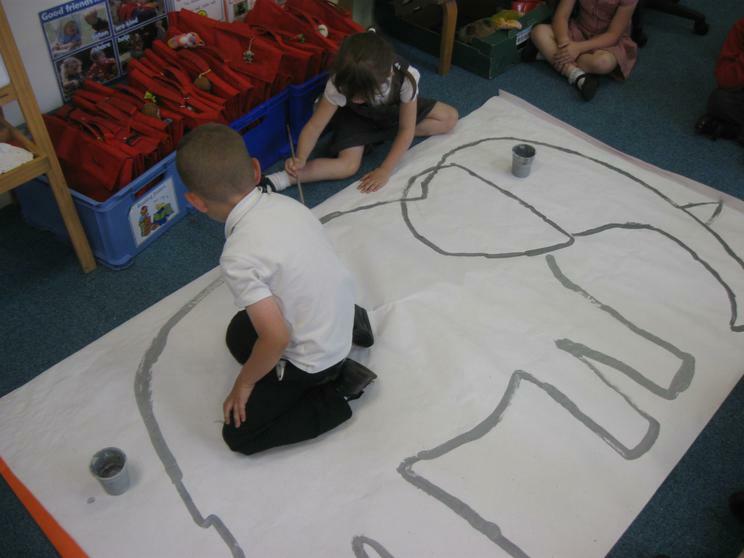 It was very different, we didn't think it was a painting from this country - Tony knew it wasn't Throckley or Lemington because people who live there don't have elephants for pets! 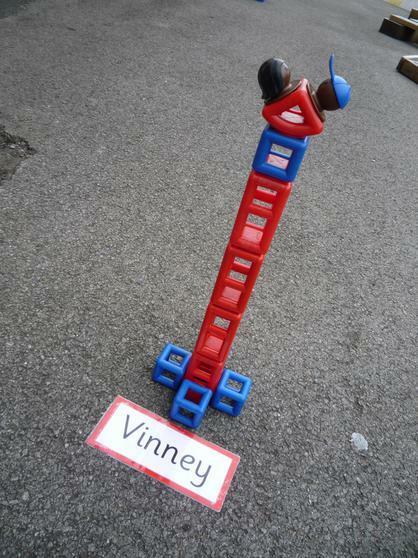 Vinney thought it was 2000 years ago when Jesus was born because the man in red looked very special, like a king. 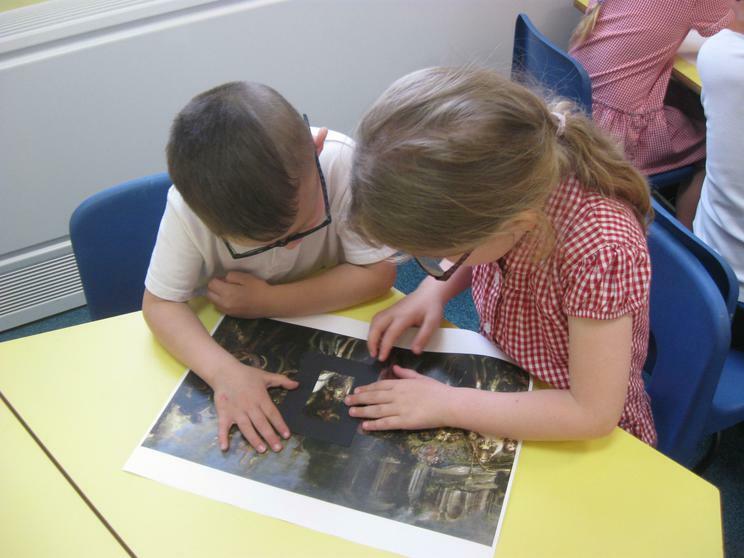 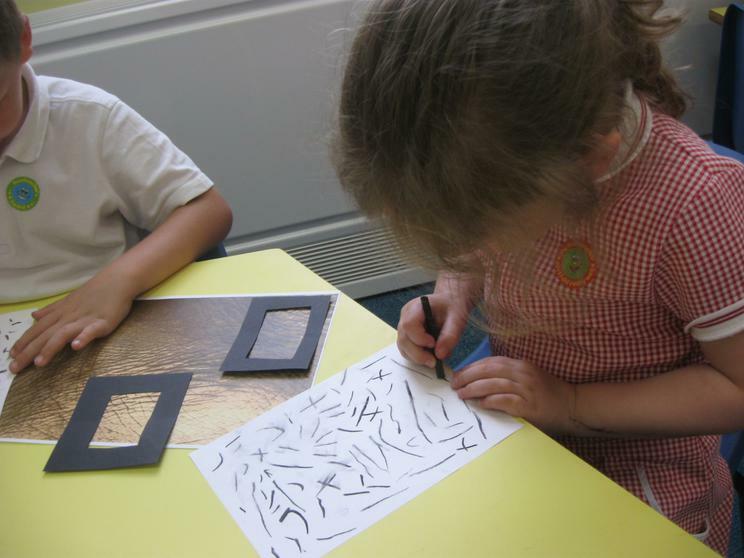 Using view finders we carefully looked at different parts of the painting, and drew the bits we liked. 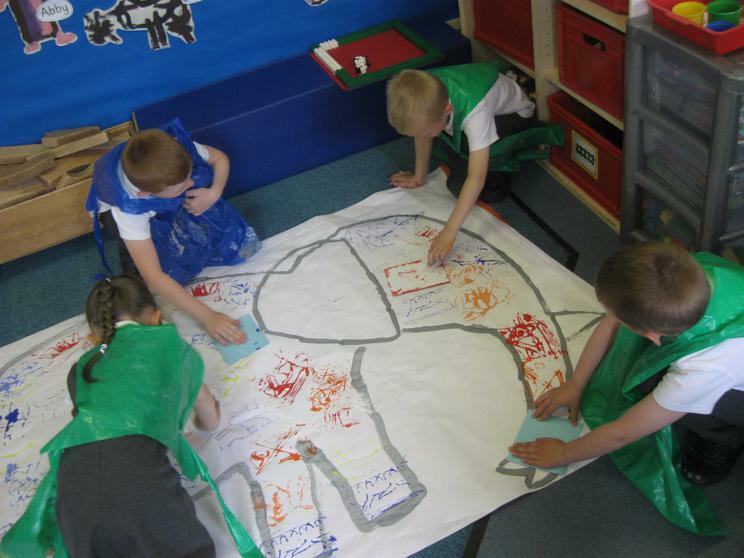 We found the elephants very interesting so looked at pictures of elephants and painted some. 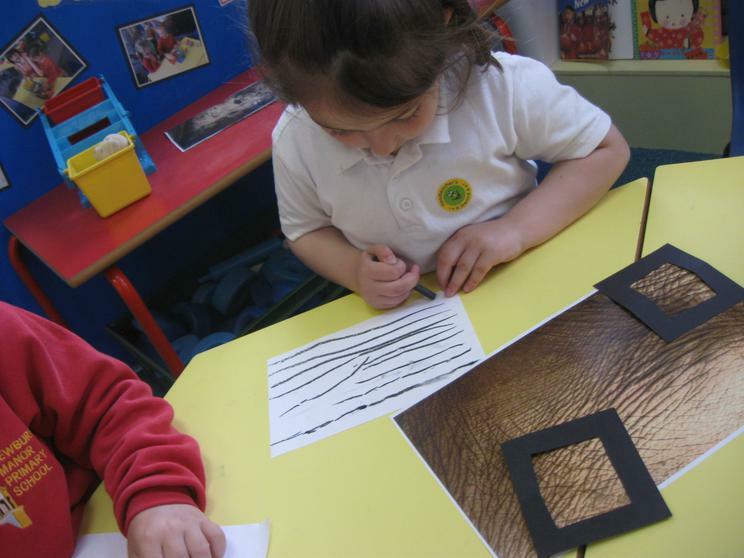 We noticed the patterns on their skin so decided to look more closely to investigate these patterns. 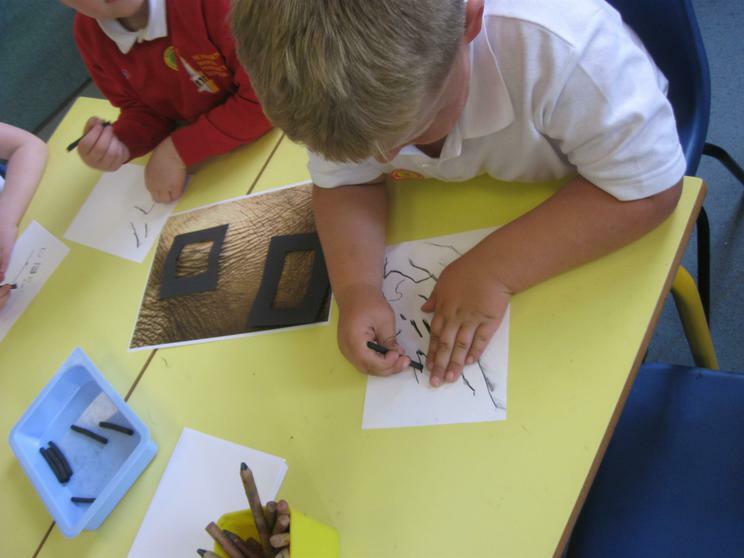 It was the first time we had drawn with charcoal. 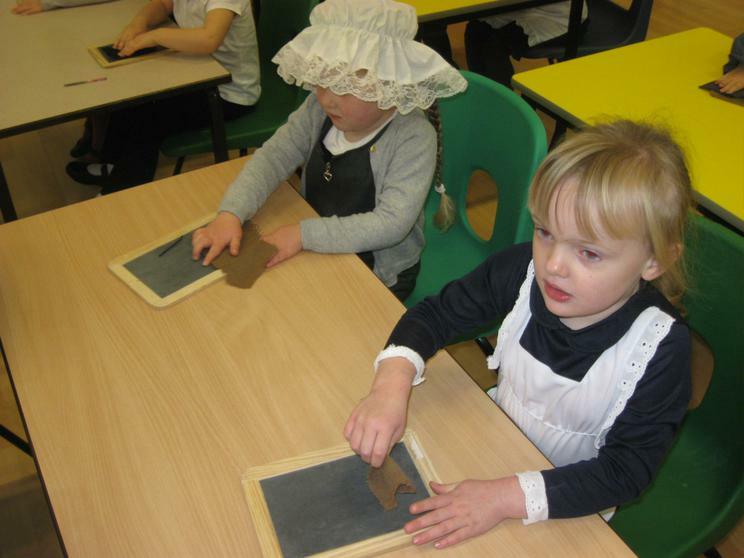 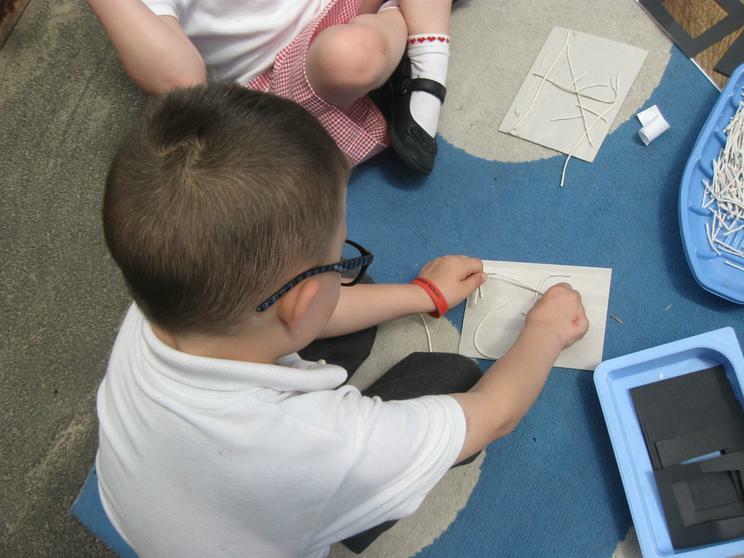 After that we used string to prepare our own printing tiles of skin patterns. 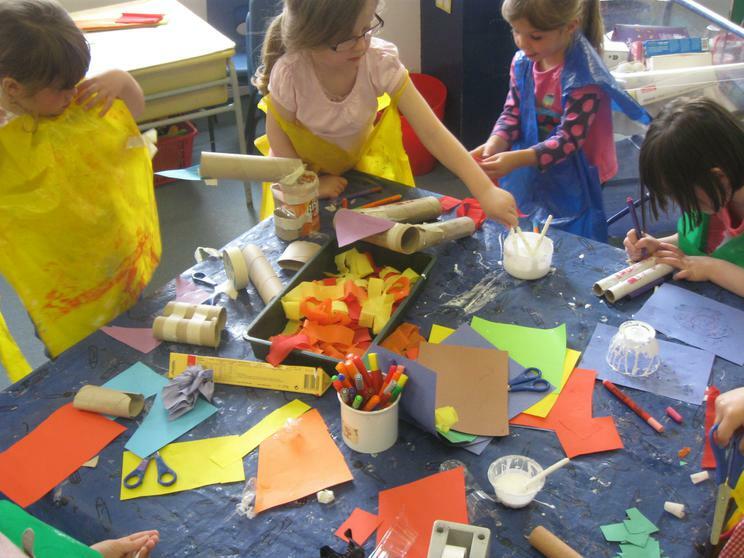 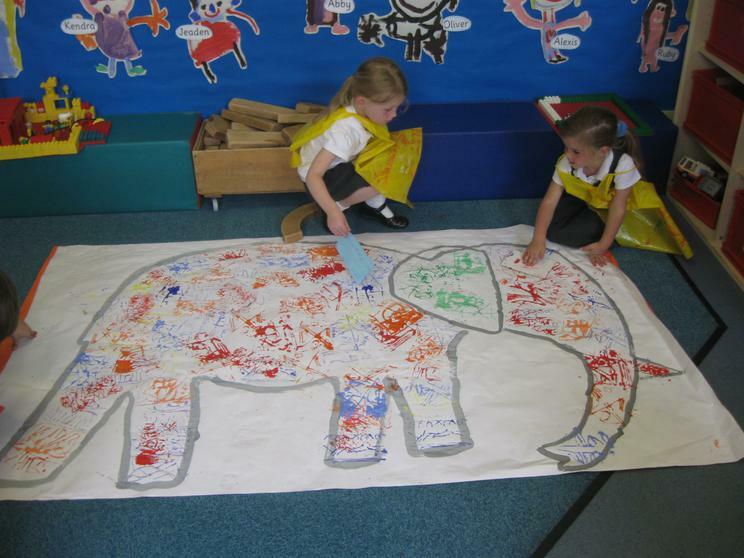 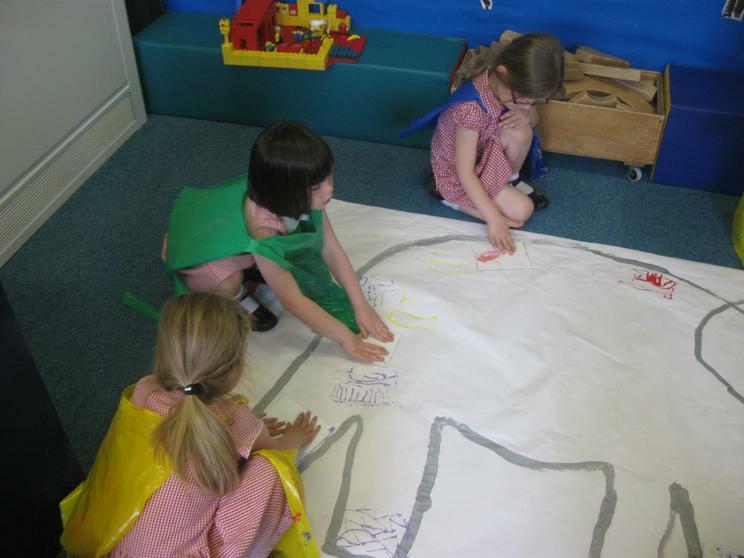 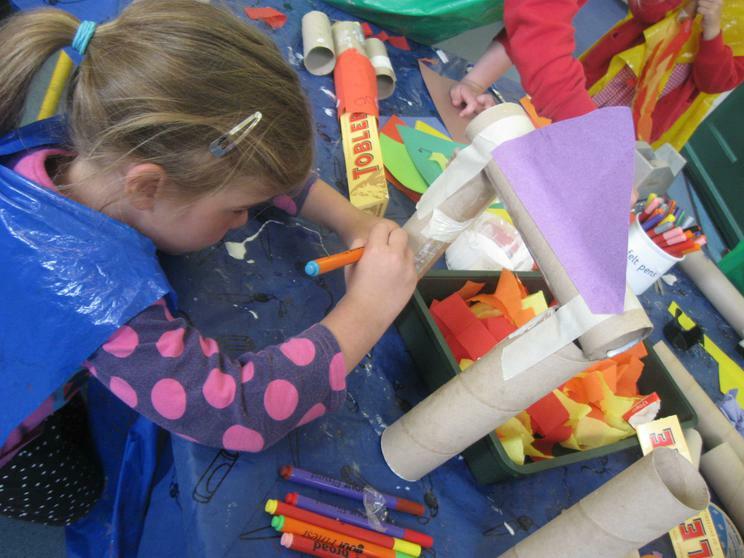 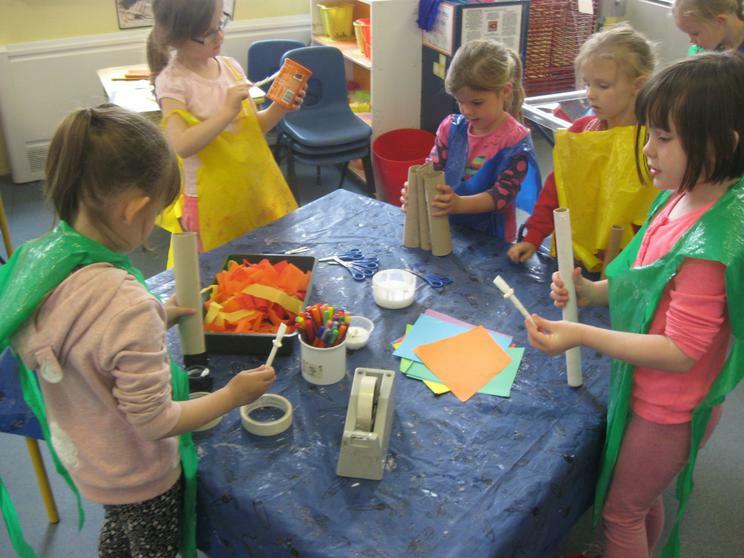 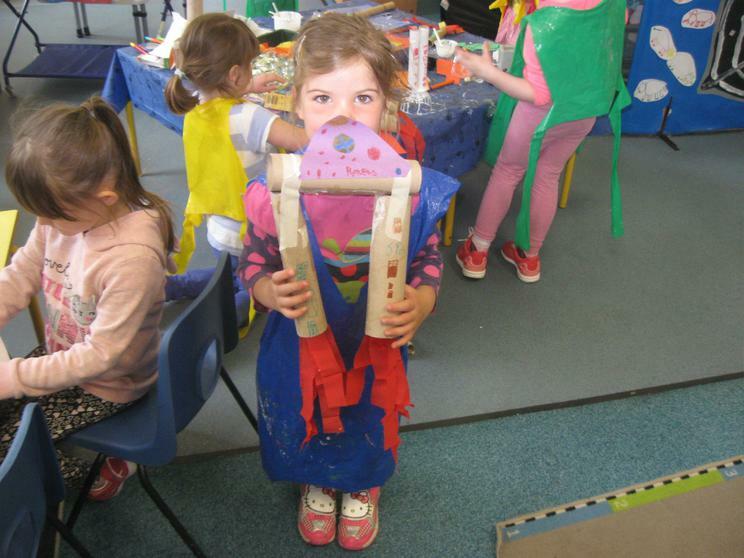 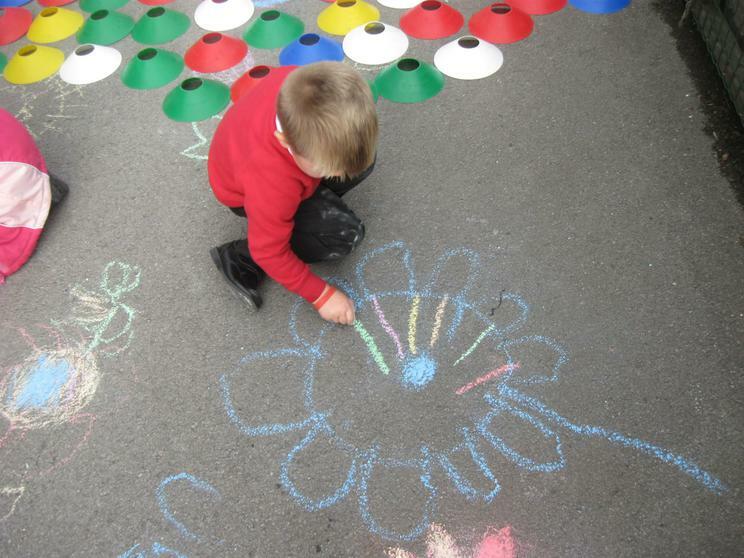 Our huge colourful elephant was the end result of our very busy art week. 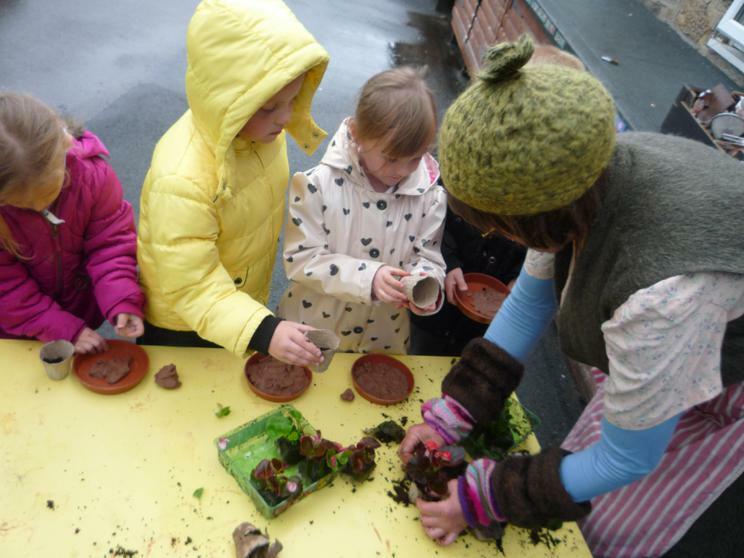 Mrs Lester took some of us into our school garden to do some planting. 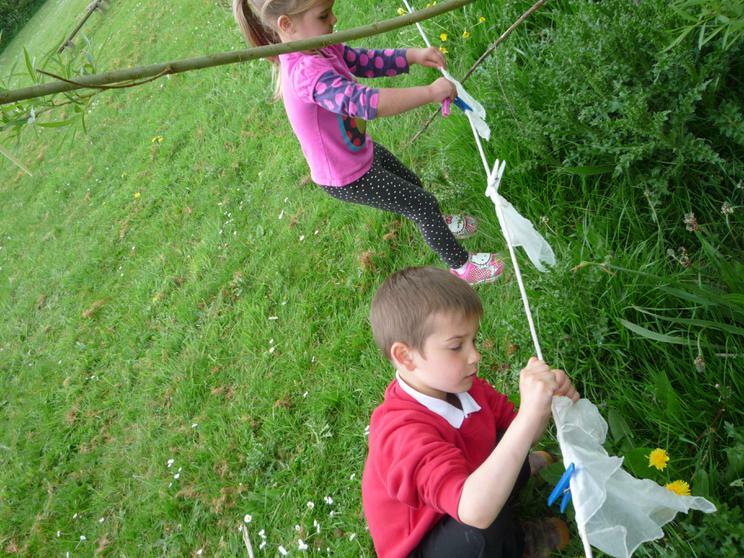 We planted some sweet peas, but first we had to put in some canes for the plants to grow around - we hope they have some lovely scented flowers before the summer holidays. 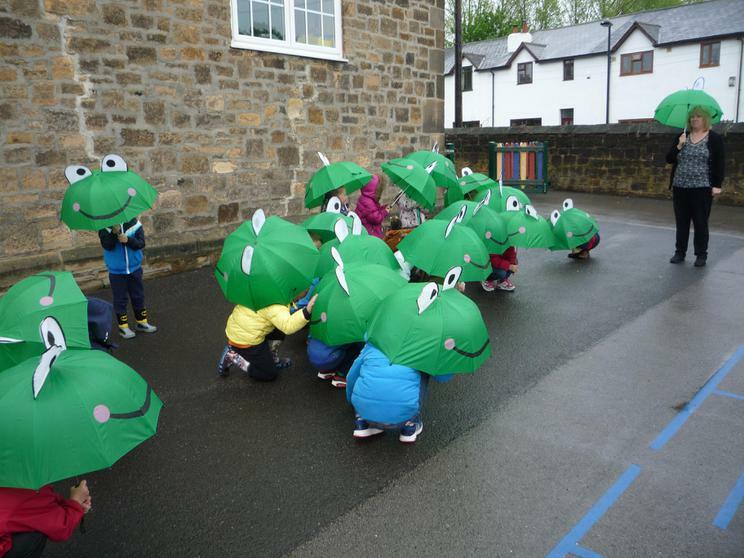 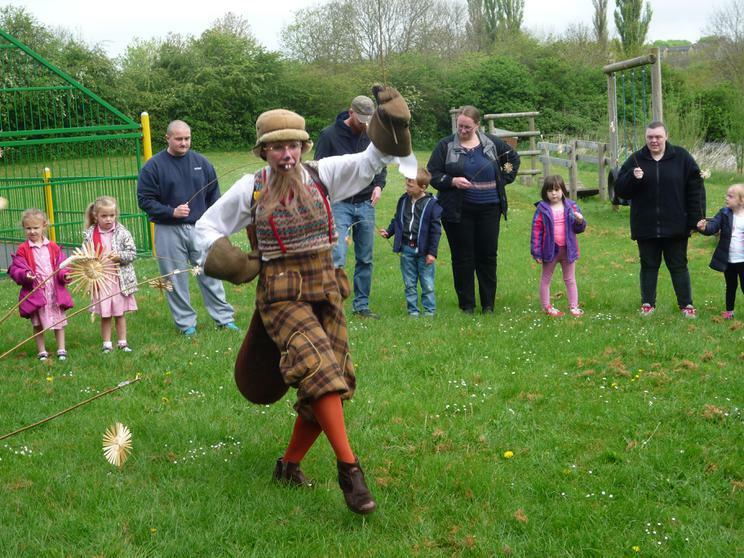 It was a damp day today - perfect for our frog dance! 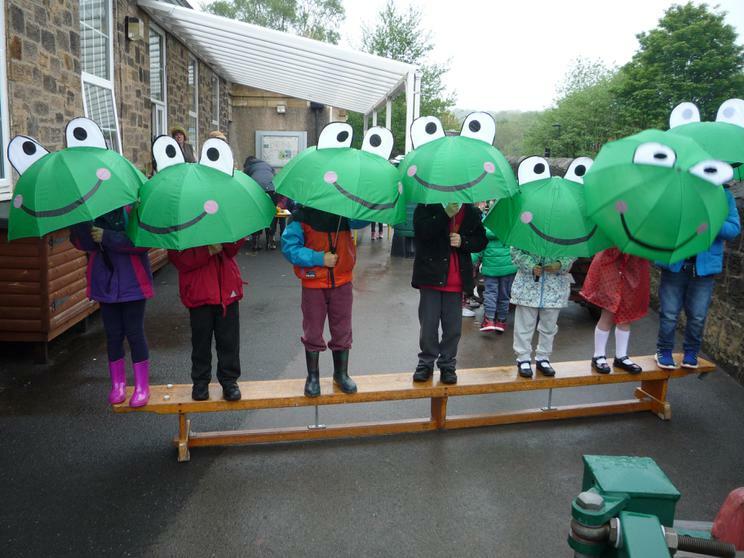 We jumped and hopped just like real frogs. 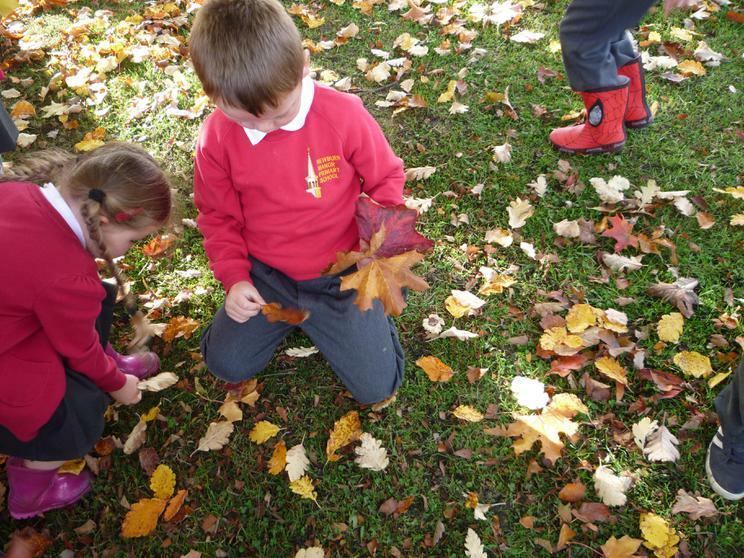 Our magical gardens had nests for the robins - we have to turn out their red breasts when we are going to a good deed for someone. 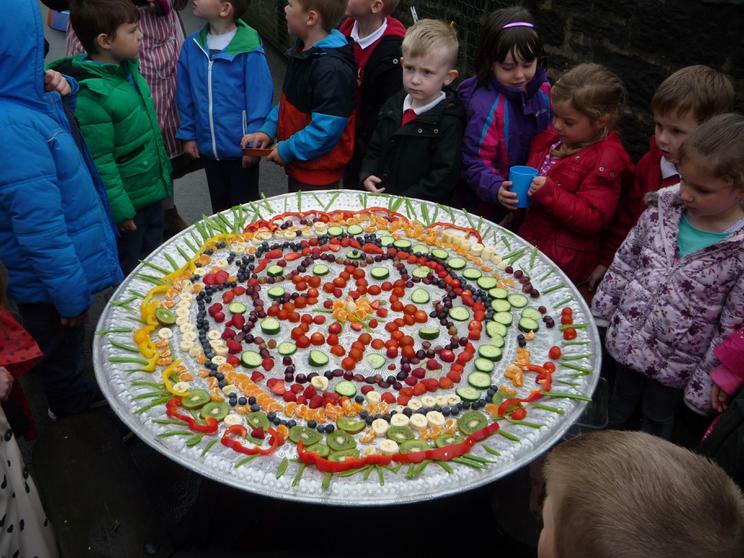 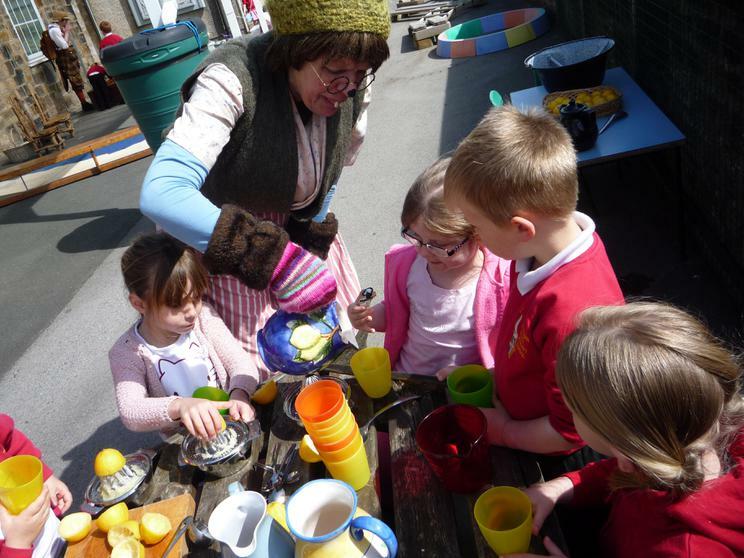 We had a busy time again, making mint tea (experts now) and chopping up fruit for the huge edible rangoli pattern. 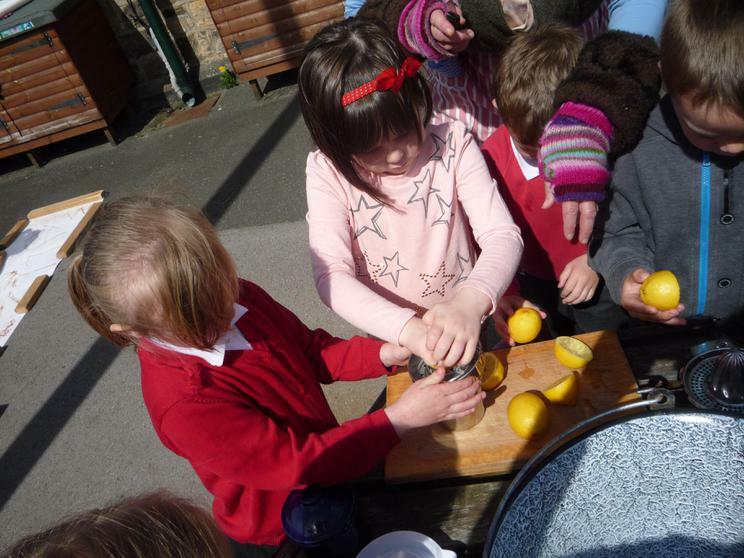 It was very tasty - and healthy. 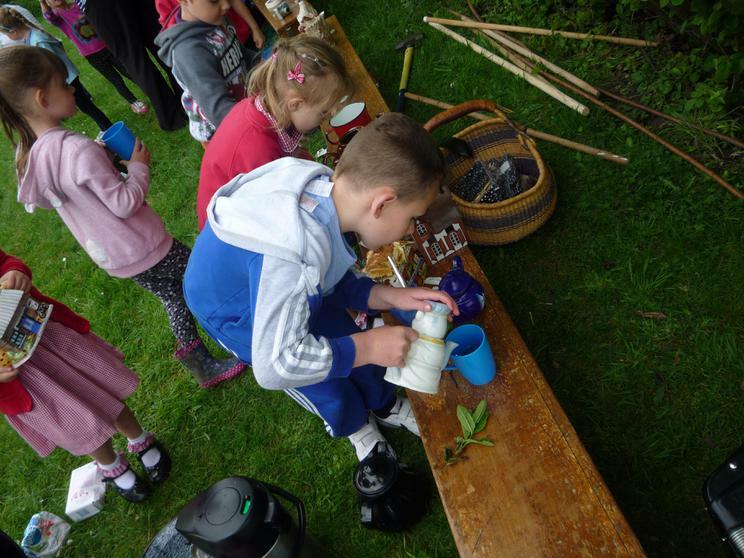 Thank you again to Mr and Mrs Beaver and our VIPs (Very Important Parents) who came along to help and join in the fun. 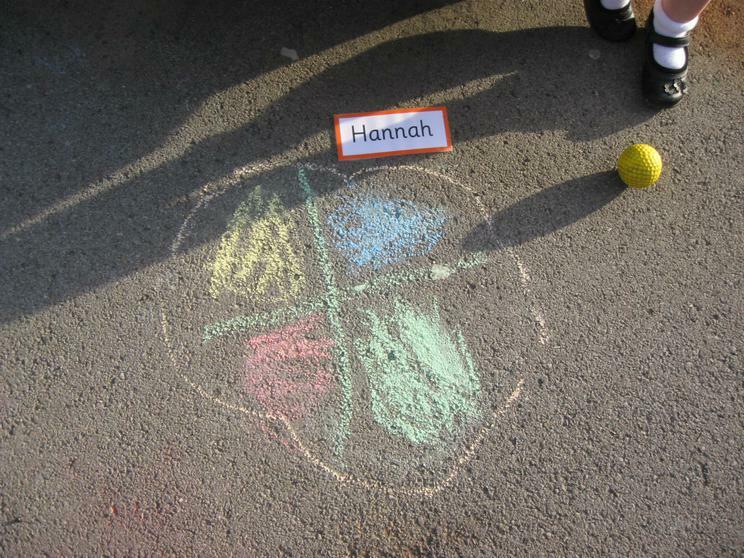 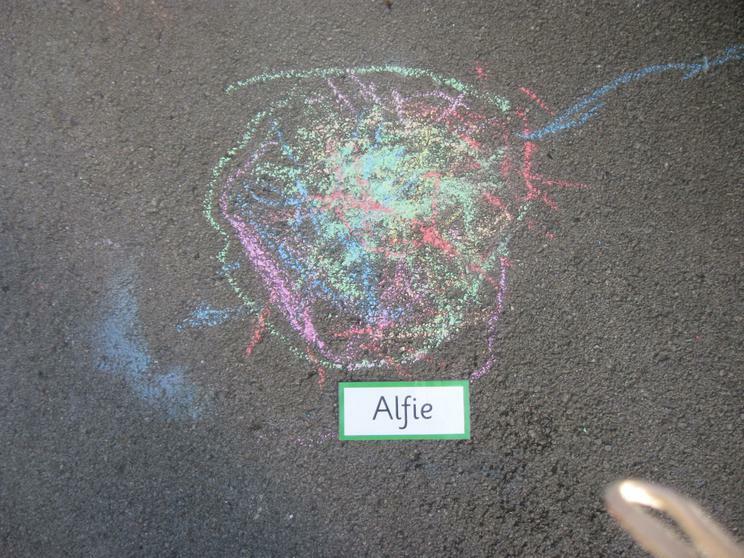 Today we did a dance to honour the star - we followed the star in our procession and made star biscuits. 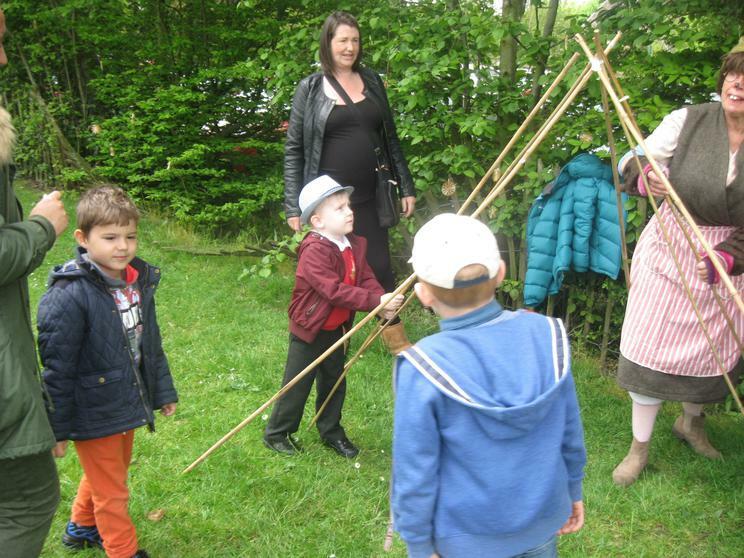 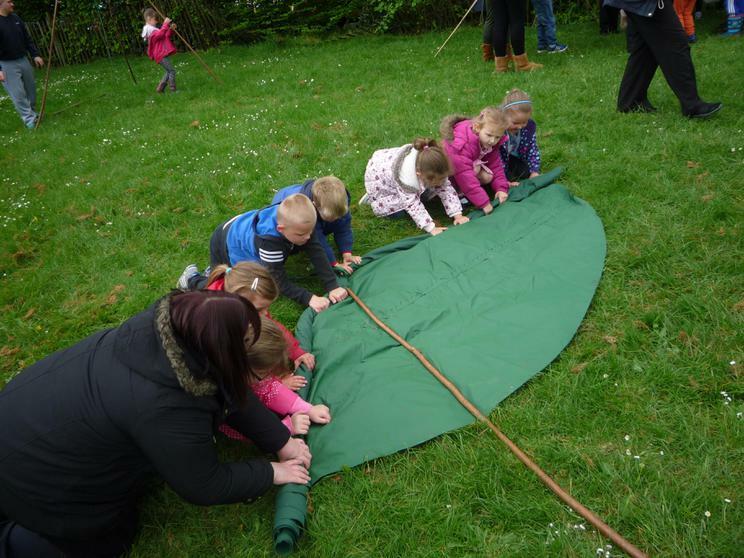 We made beaver dens this week so it was really good to have our VIPS (Very Important Parents) to help us as we had to find long sticks the same length, then roll up the covers before they were lifted onto the frame. 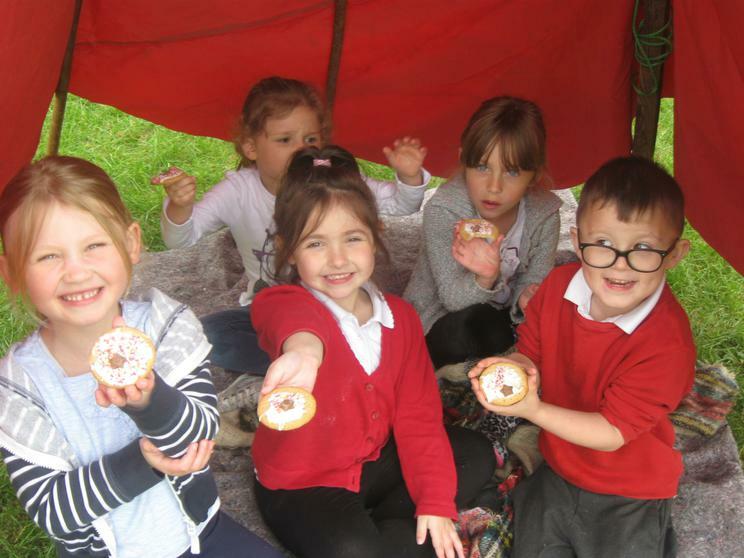 These were good places to eat our star biscuits! 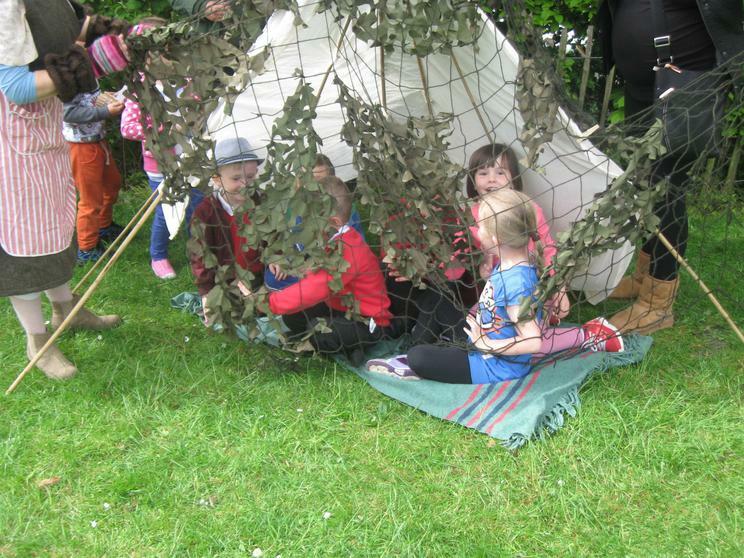 We also made a bird hide from where we could watch the beautifully coloured beaver parrots flying around and about. 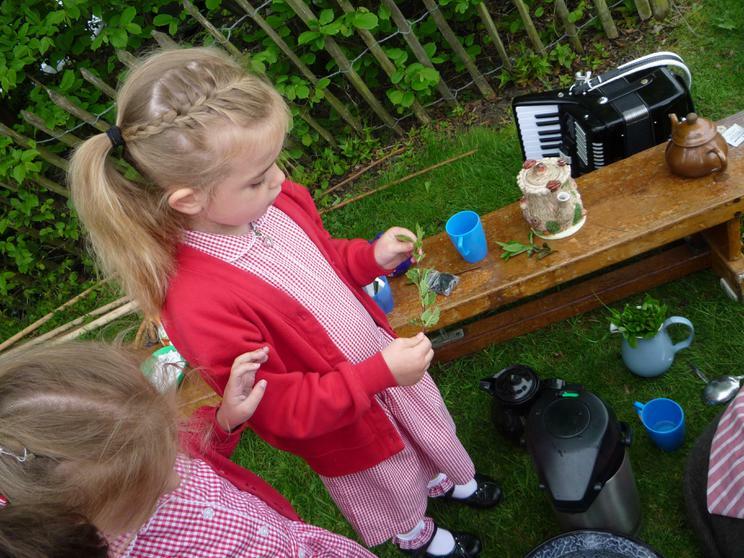 The mint tea was delicious and we poured it from lovely quaint china tea pots. 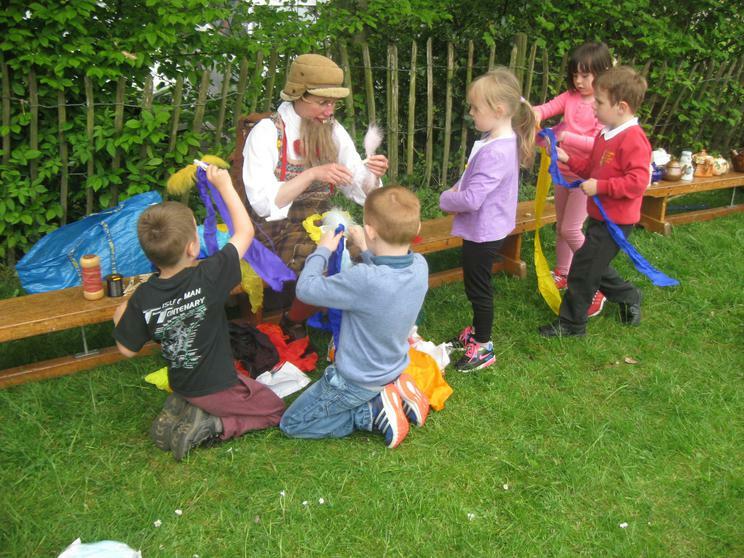 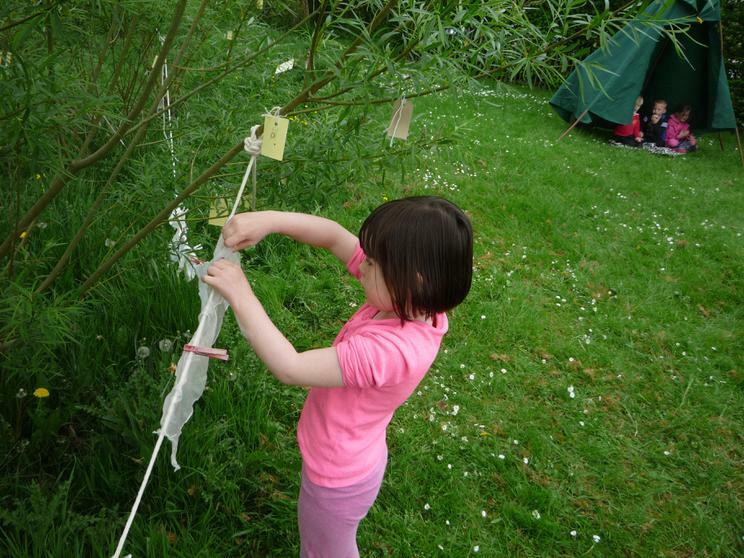 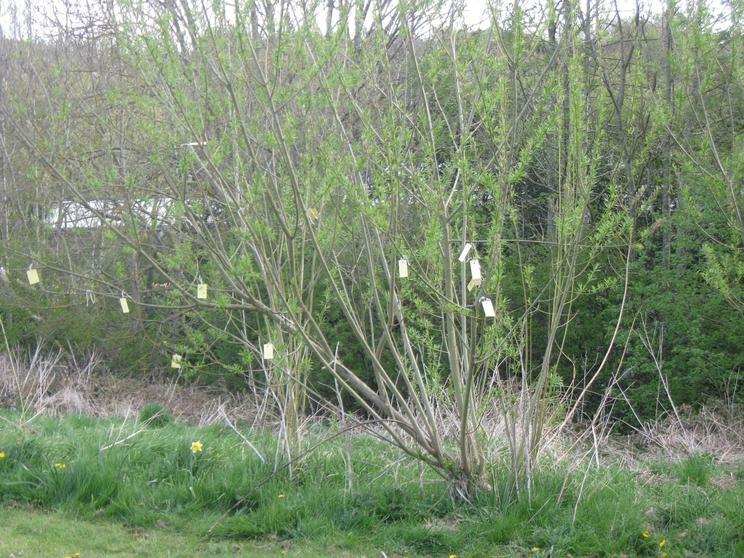 We washed Mr and Mrs Beaver's hankies in soapy water, squeezed them out tightly then hung them out to dry on the washing line. 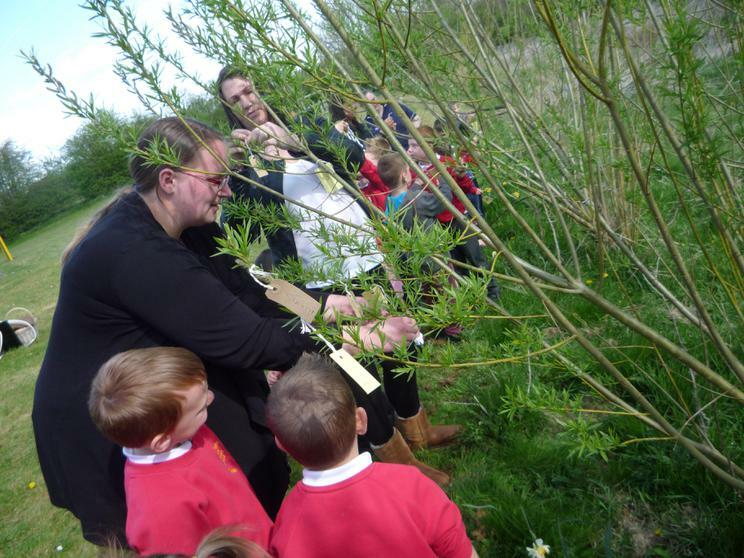 Today we welcomed Mr and Mrs Beaver for the first time. 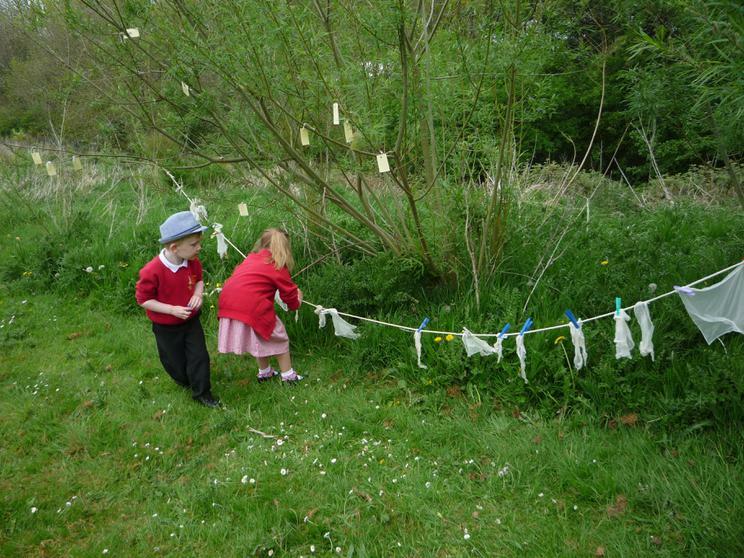 We sang songs together then processed up Wish Tree Mountain to fasten our wishes to the tree - whose name did you write on your label? 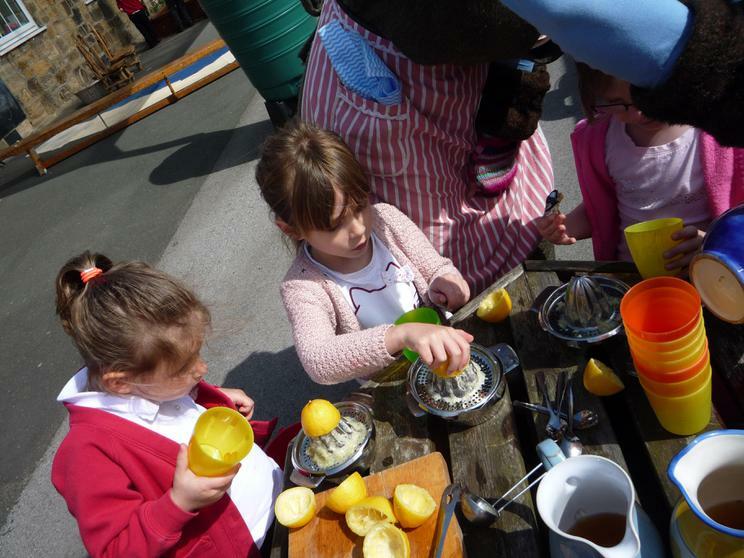 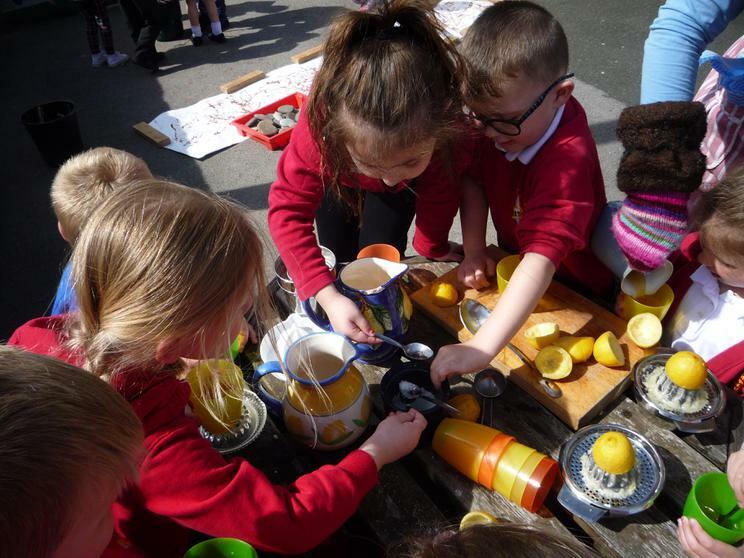 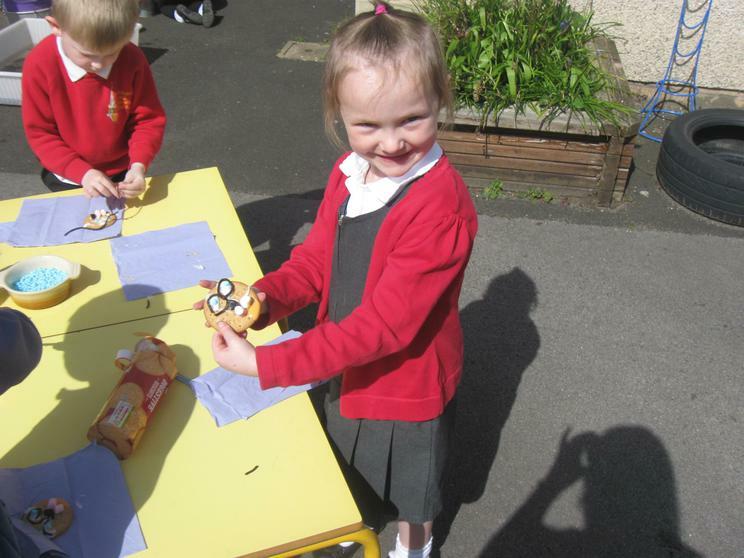 After that we were very busy kitten beavers - we made lemonade by squeezing lots of juicy lemons, we decorated biscuits to look like Mr beaver - with his spectacles on! 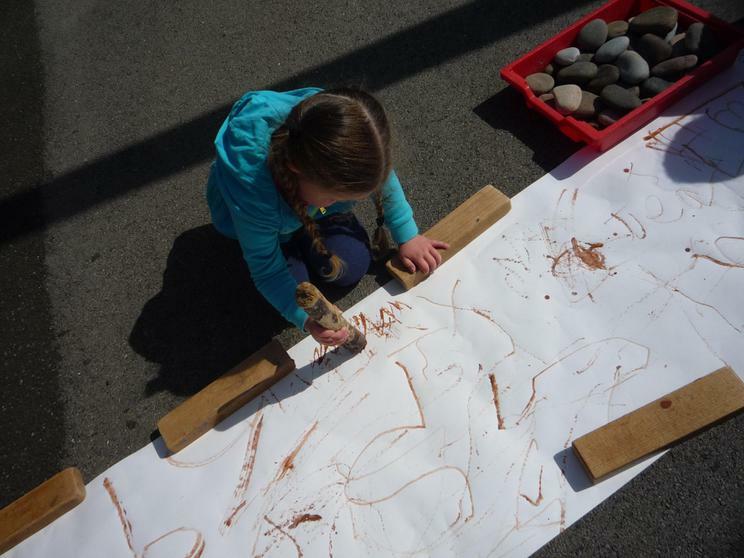 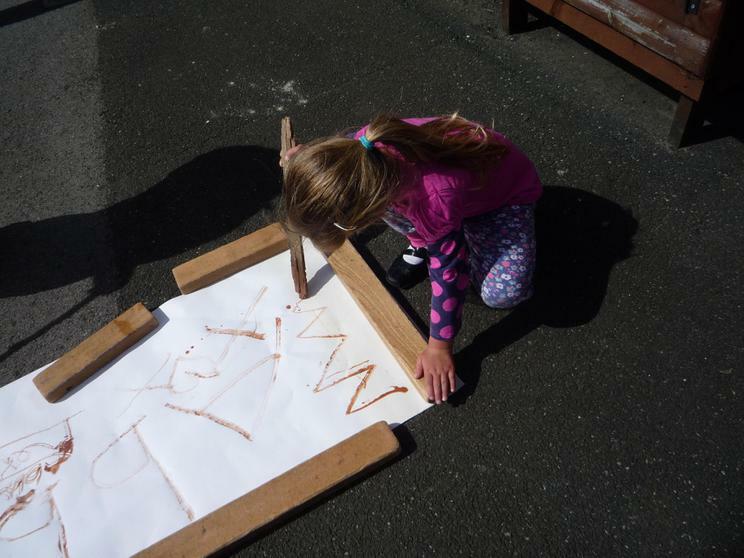 We had great fun mark making with slip, using thick and thin sticks, we dredged for jewels to make a huge beaver colony in the sand. 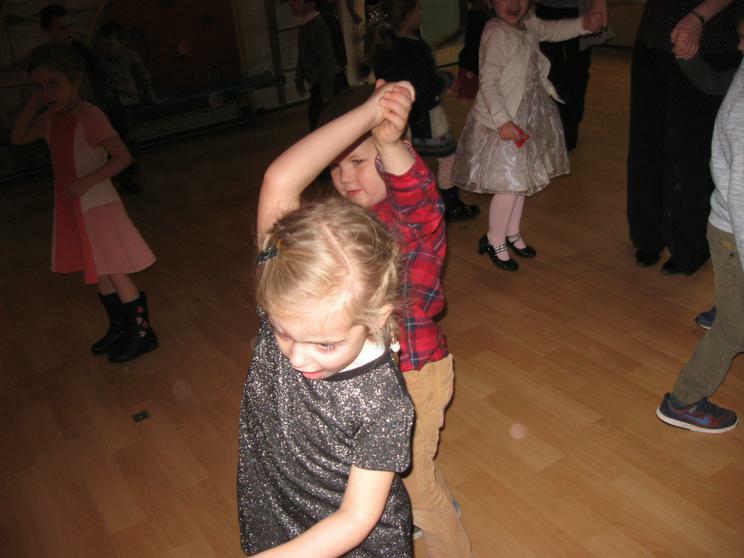 Thank you to our VIPs (Very Important Parents) who also had a good time and joined in the fun. 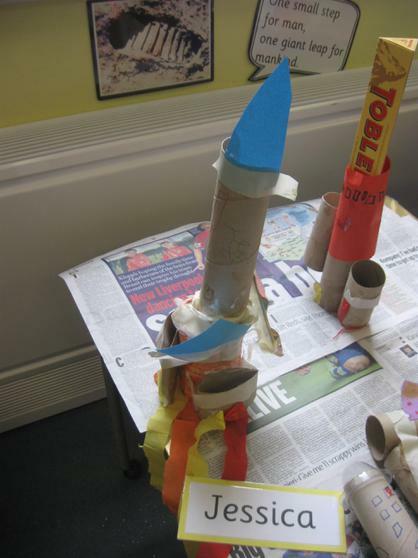 After reading about Q Pootle 5, we designed our own spaceships - complete with rocket boosters - can you spot the rocket boosters on our models? 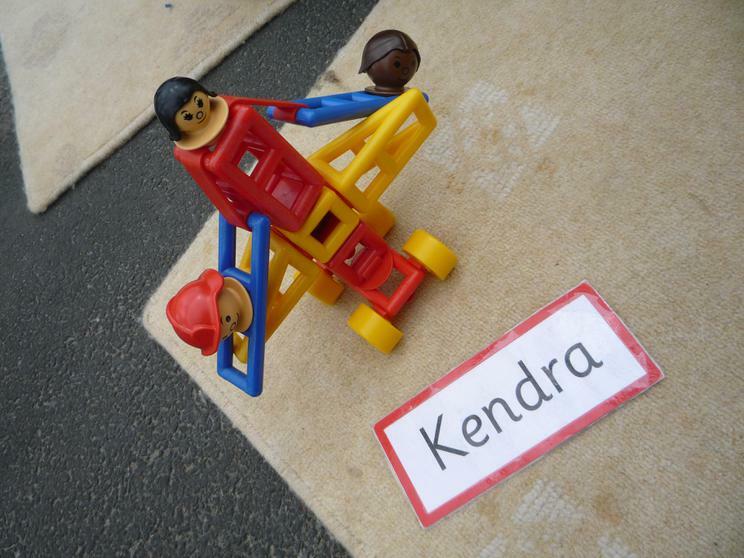 They make the spaceships blast off. 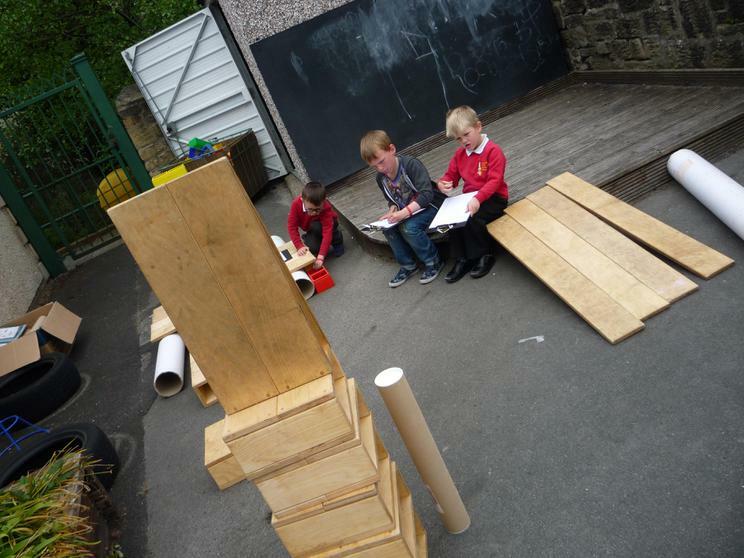 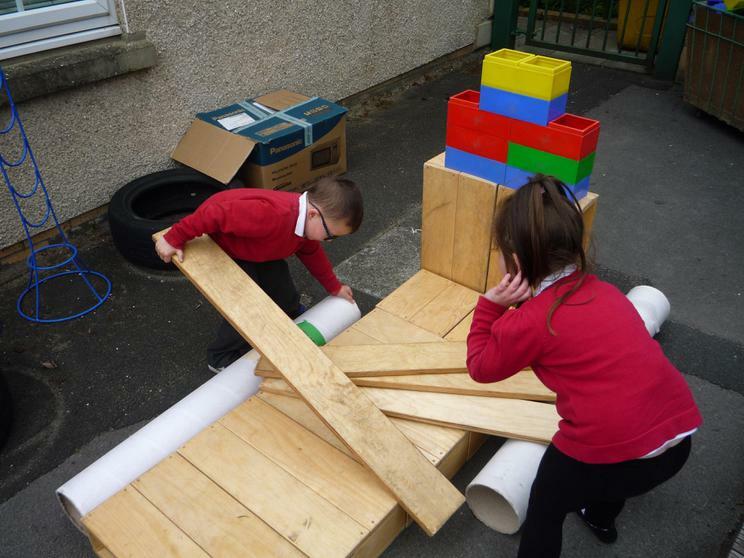 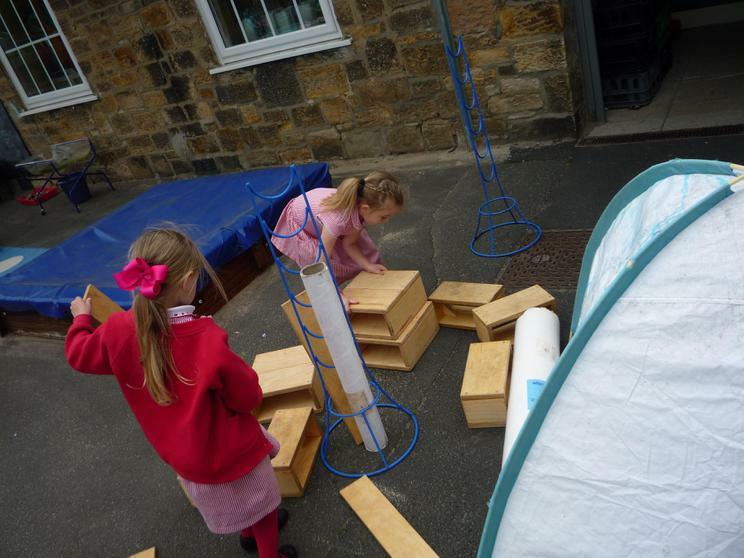 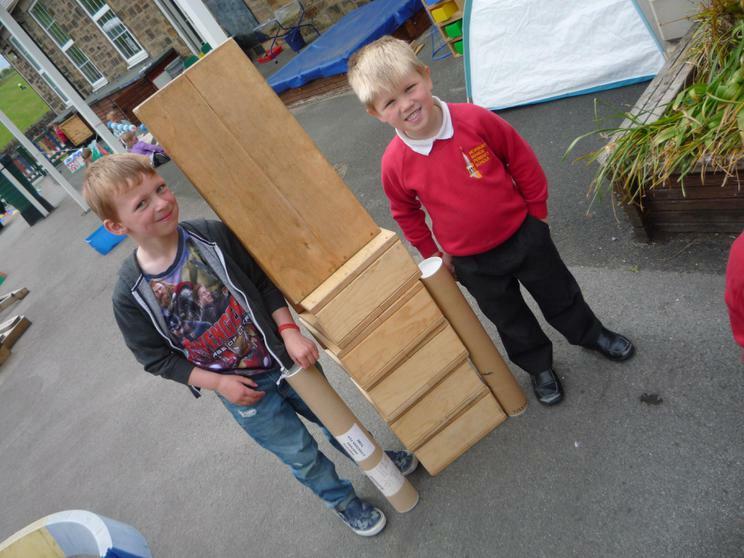 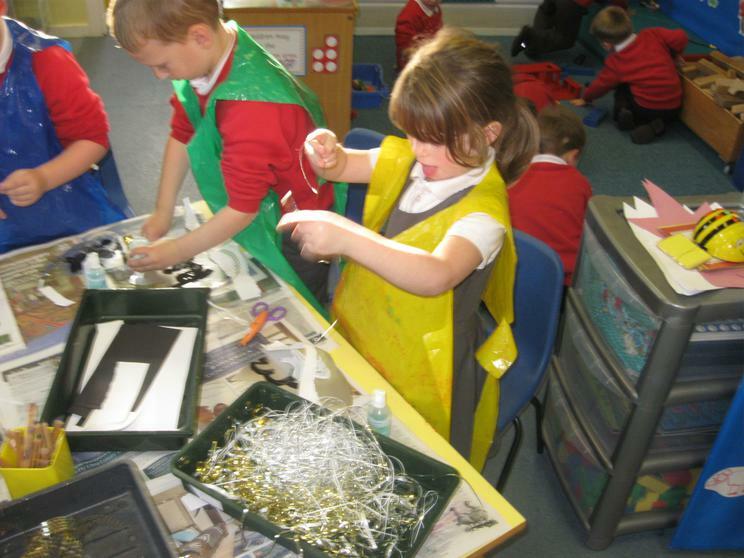 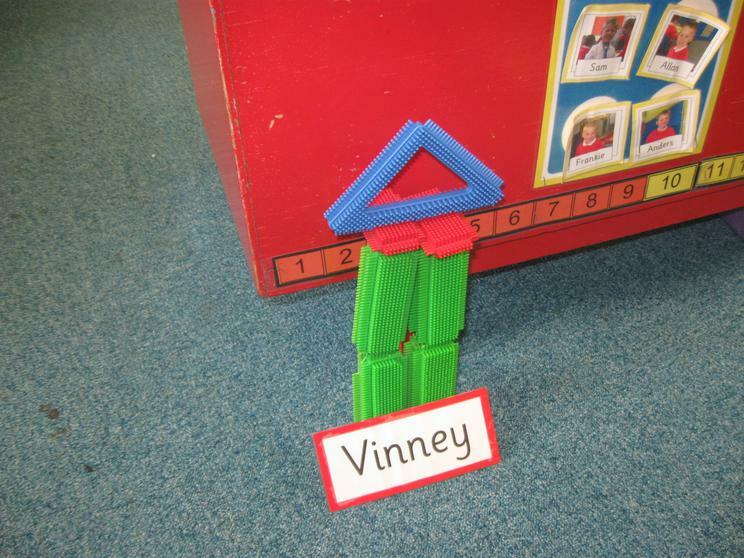 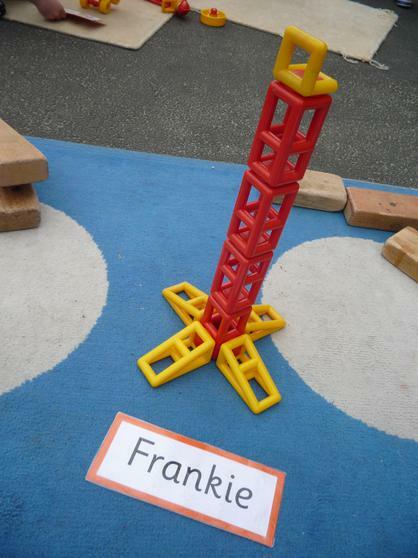 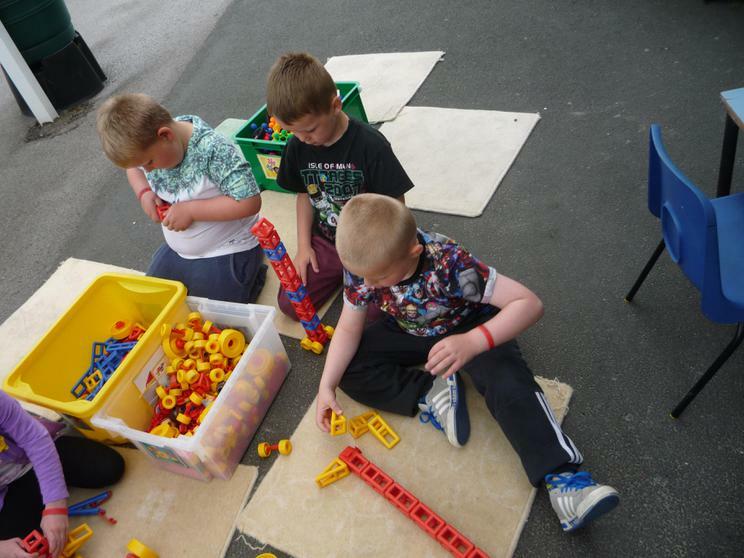 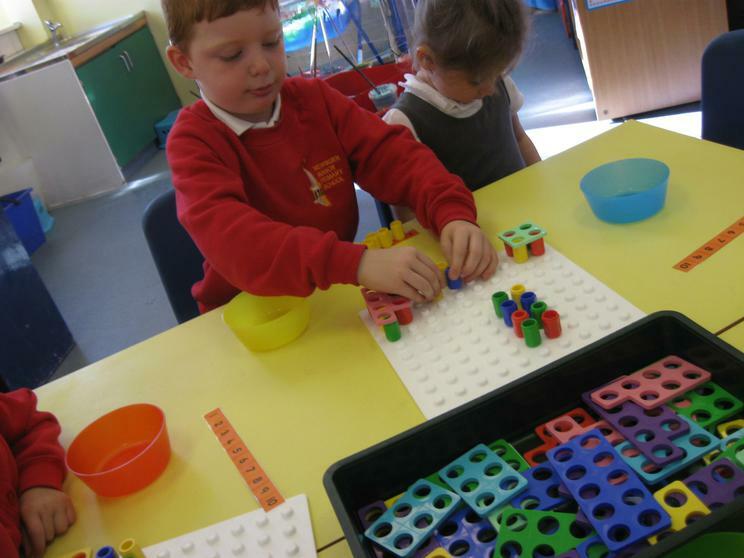 We used lots of different materials to build with, and investigated how to join pieces together. 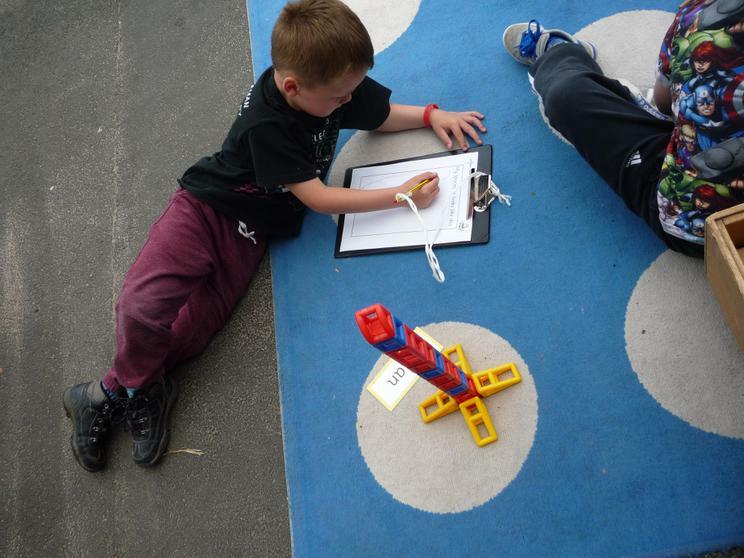 Once our spaceships were made we drew plans of our designs. 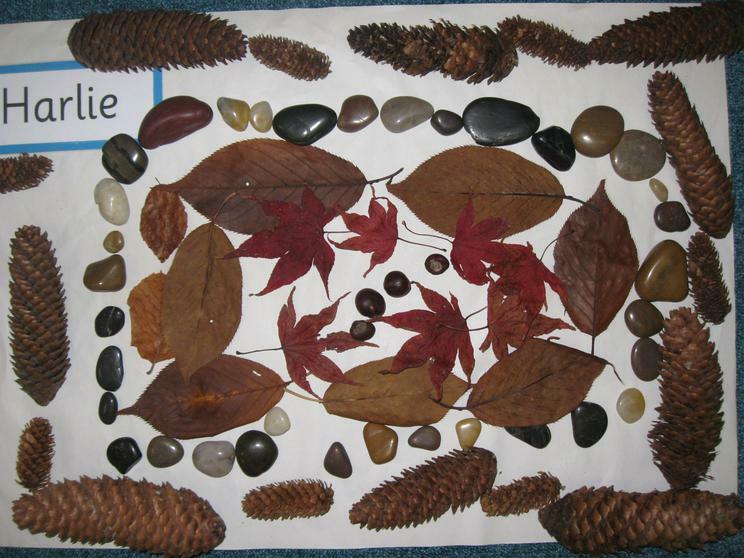 We used Pie Corbett's Text for Writing to construct our text map. 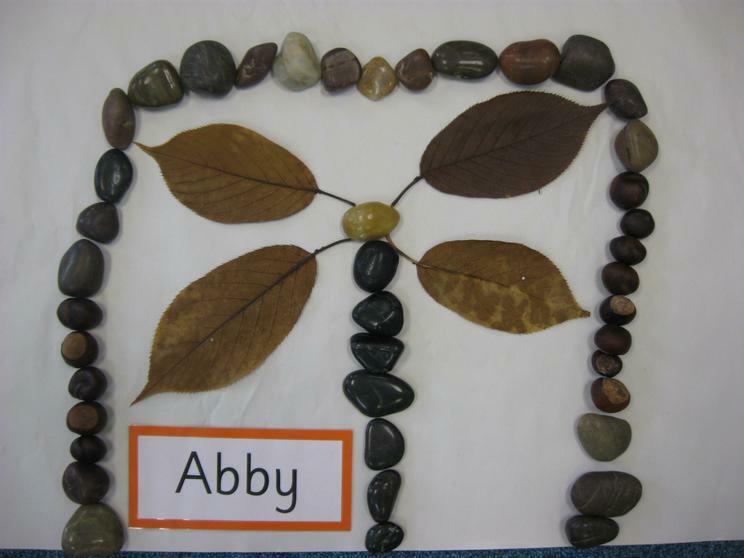 Abby went on to recall this in her child initiated written work. 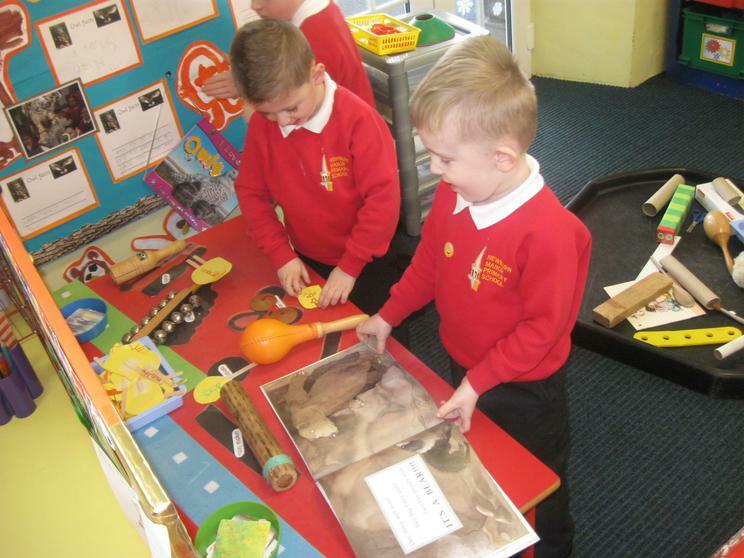 We have enjoyed reading the story about Baby Bear and his adventures as he went to visit the moon. 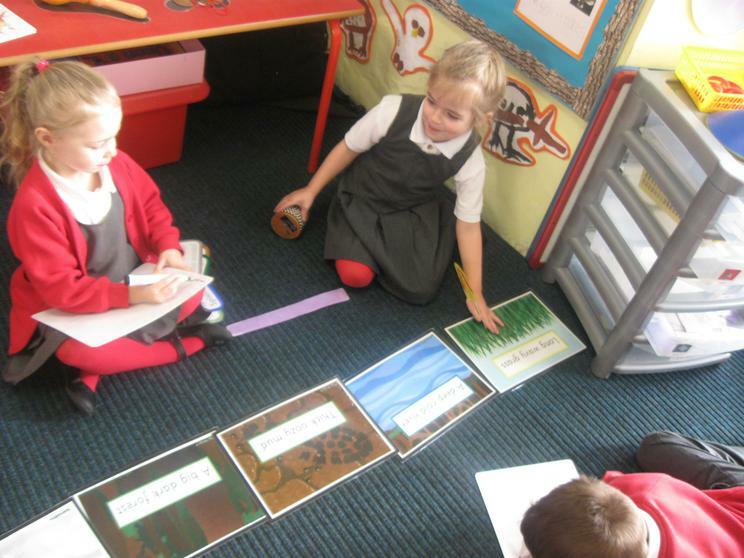 The story map helps us to retell the story. 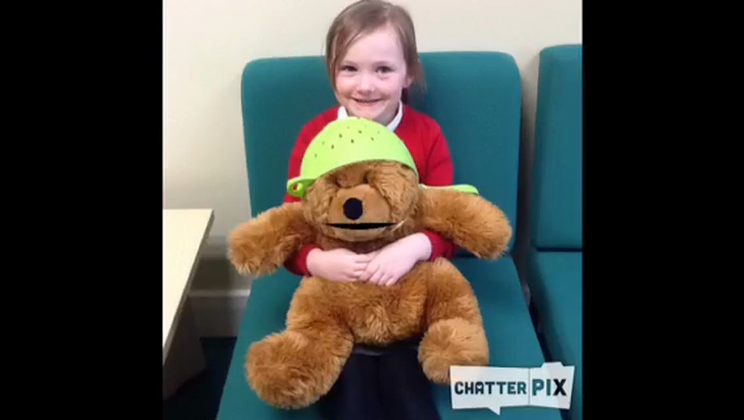 We used an app called ChatterPix Kids for Baby Bear to record parts of his adventure. 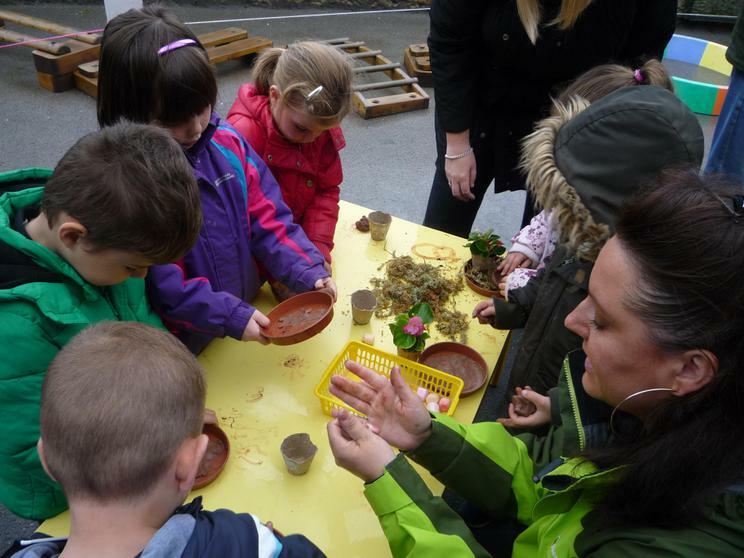 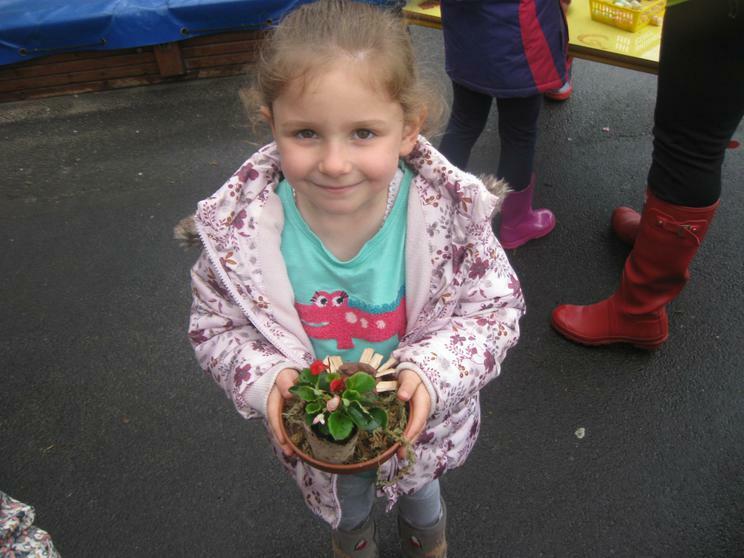 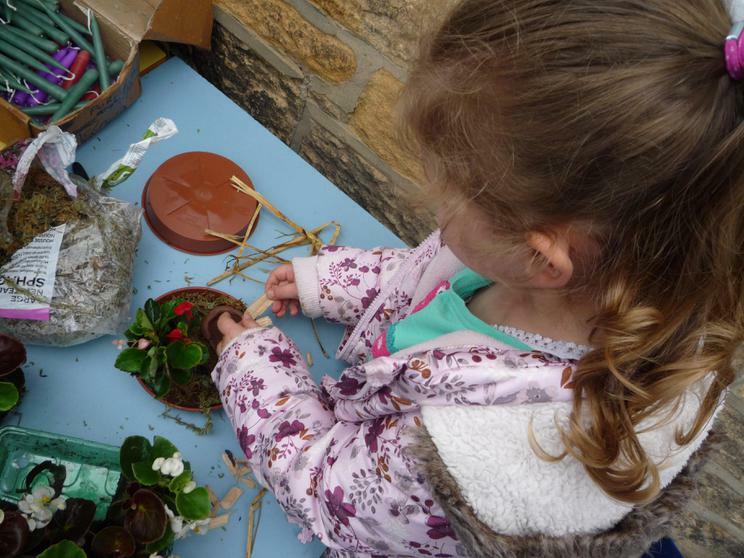 Thank you to all the grown ups who came to join in our Easter activity afternoon. 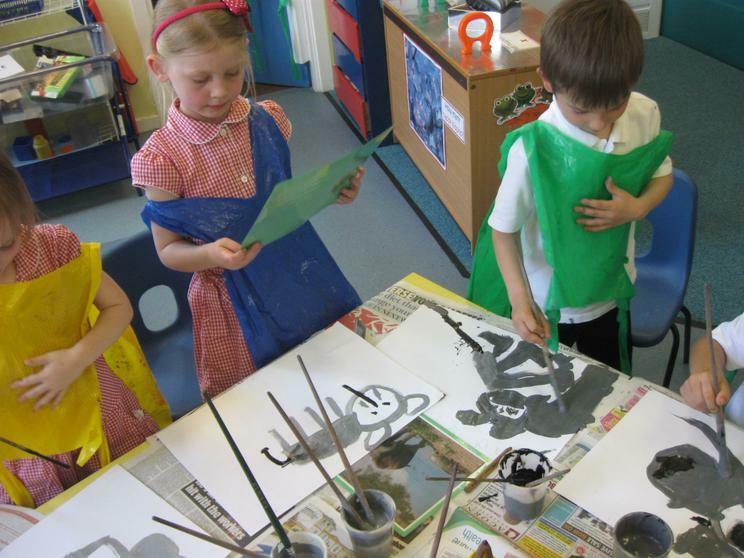 Can you spot some of the characters from our favourite stories? 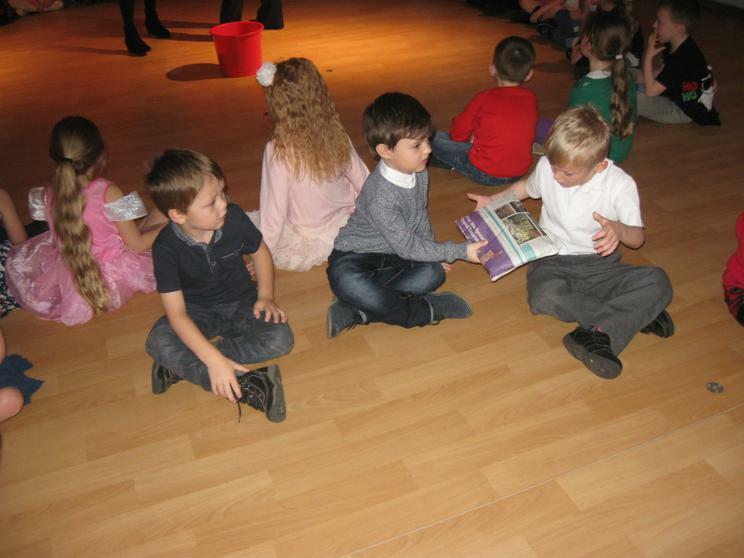 At the end of the day our adults came early to share our new story books with us. 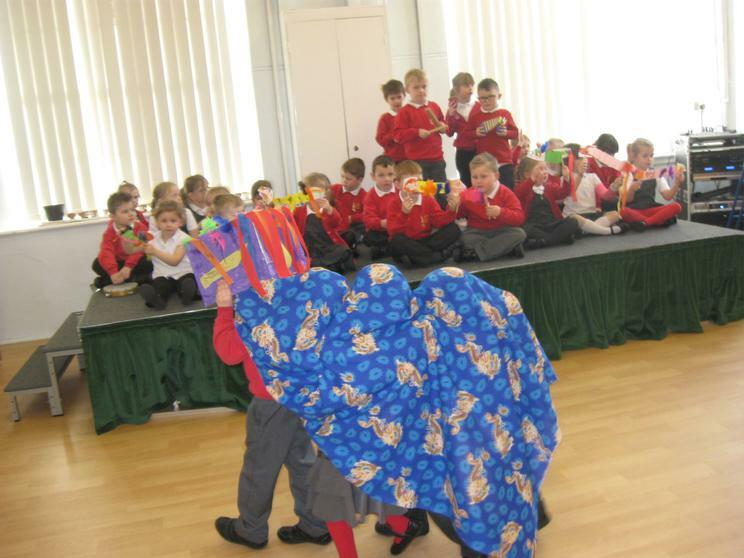 We hope you managed to see our Chinese New Year celebration during our class assembly. 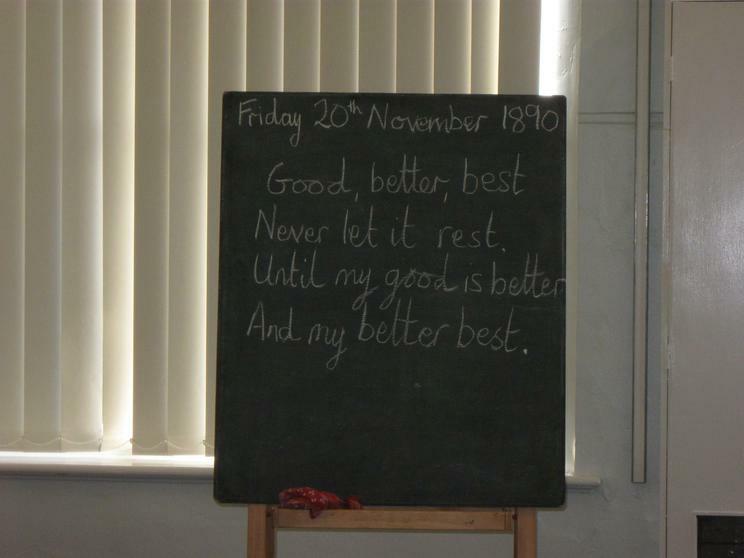 If you didn't (and even if you did!) 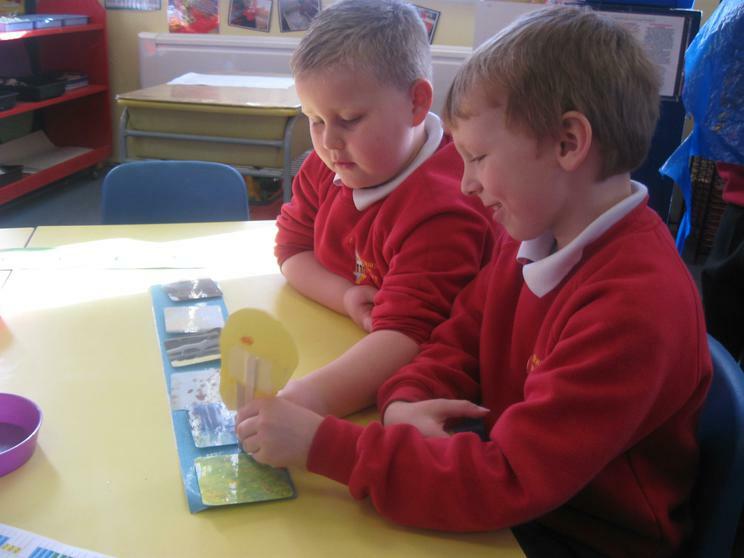 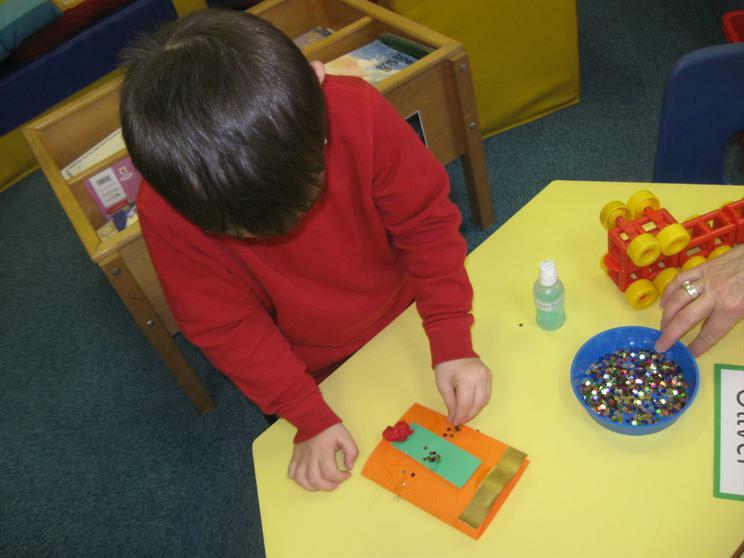 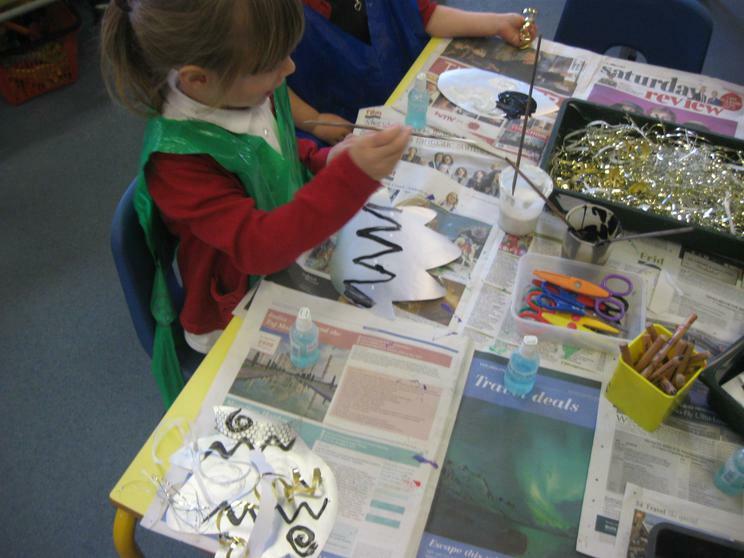 here are some photographs of activities when we were finding out how some people celebrate Chinese New Year. 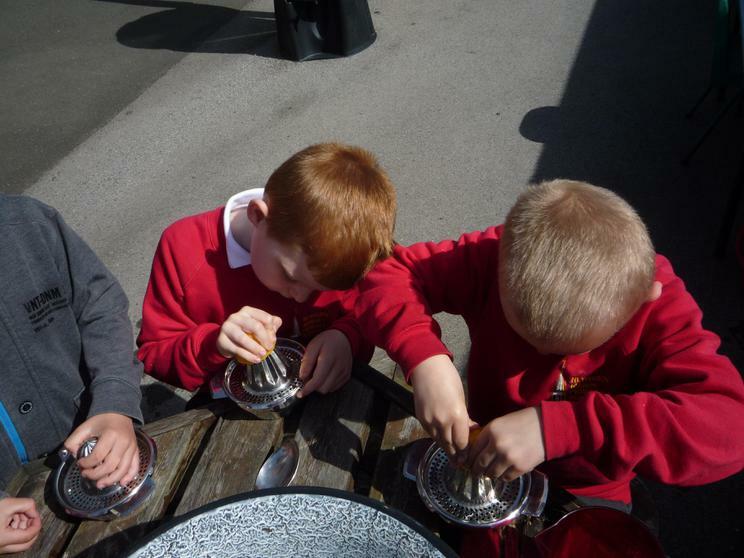 The Chinese food was delicious - but the dip was a bit spicy! 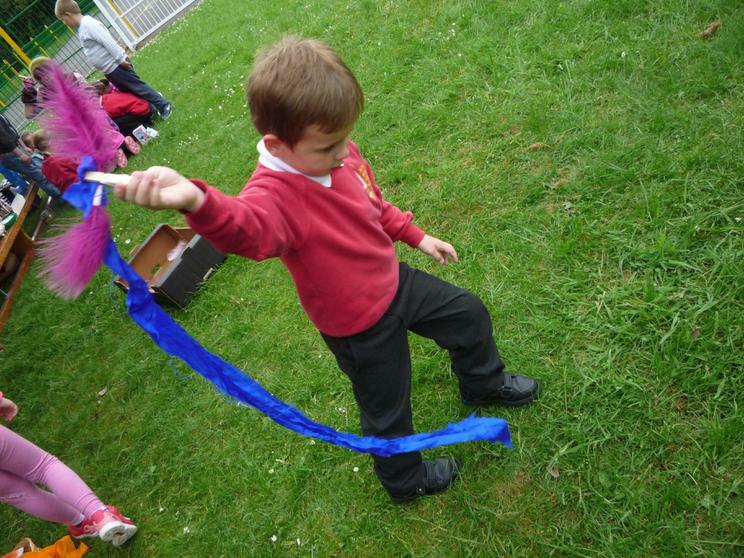 Let the dragon dance begin! 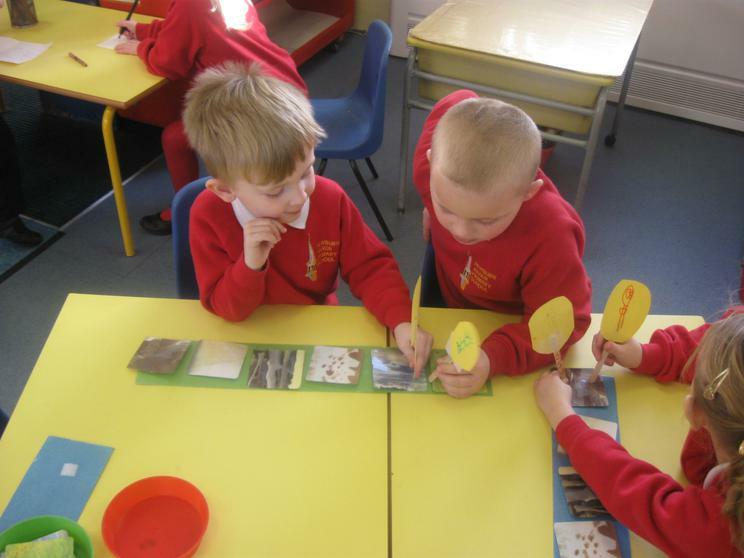 We have been learning lots of facts about bears, looking at information books and also looking on the internet. 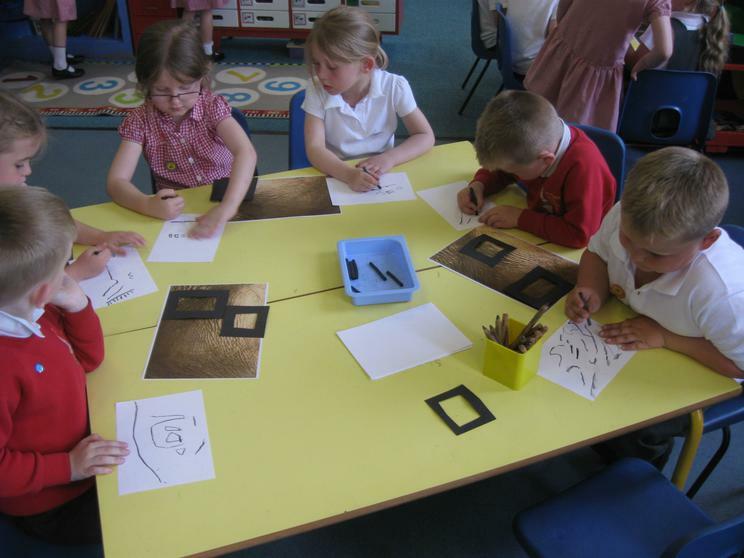 Our writing and paintings are in a big class book. 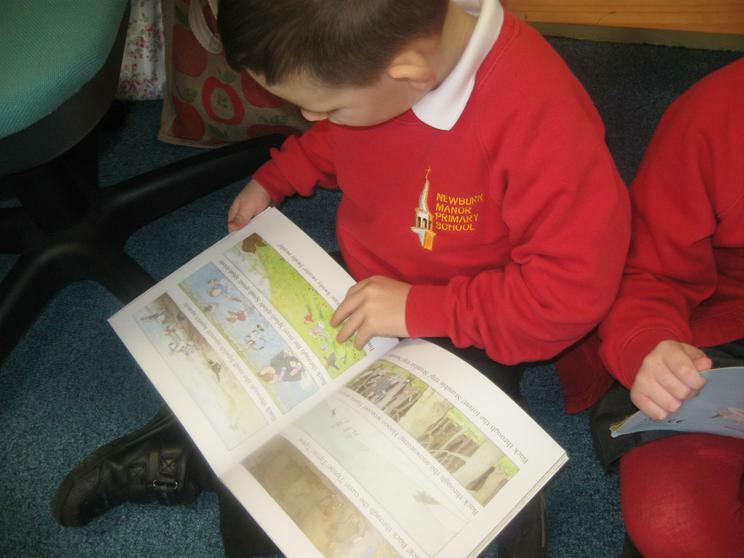 Then we read a familiar story about the bear hunt, we like to say this together, especially joining in with all the lovely vocabulary like squelch squerch, swishy swashy and the quiet tiptoe, tiptoe. 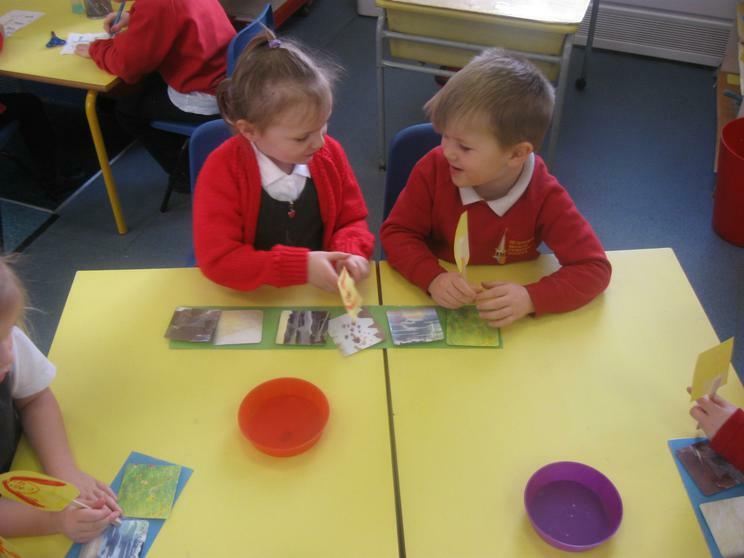 After we made our own stick puppets we sequenced the pictures to go on a bear hunt ourselves and re tell the story. 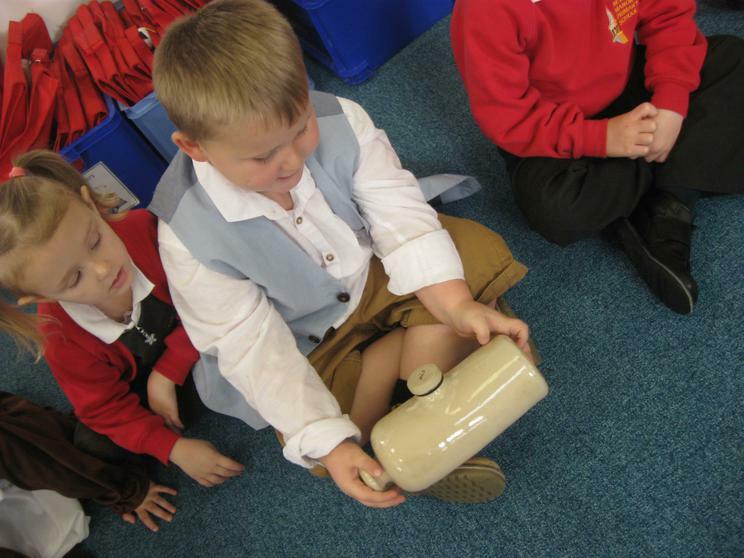 We have even used the percussion instruments to add sound effects to the story. 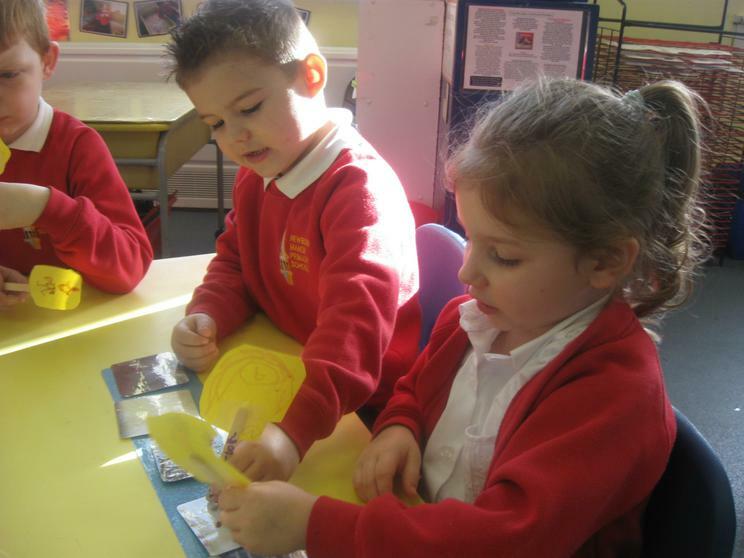 Today we were learning about looking after our teeth. 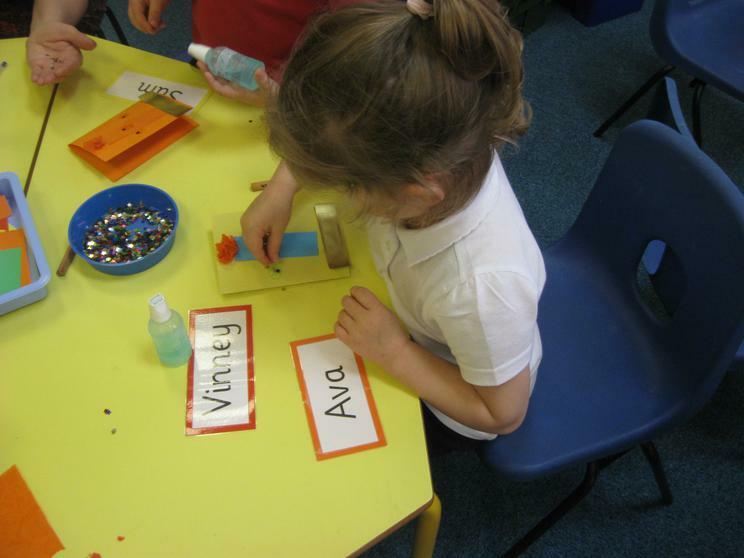 The lady told us how to clean our teeth - we have to brush them carefully all over for two minutes, two times a day. 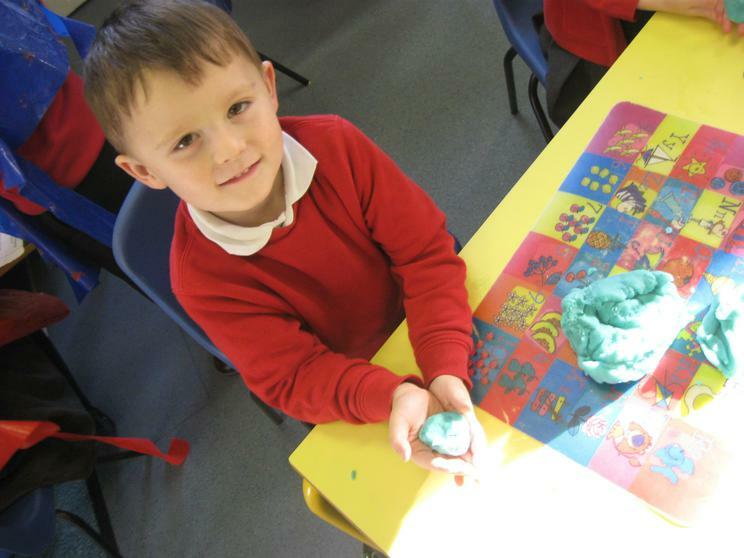 It is important not to rinse off the toothpaste as it helps to protect our teeth. 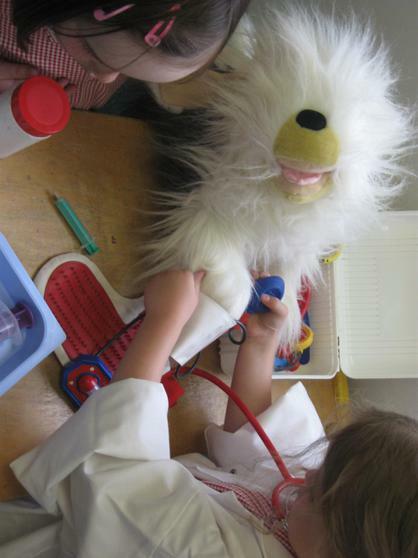 We should also visit the dentist two times a year. 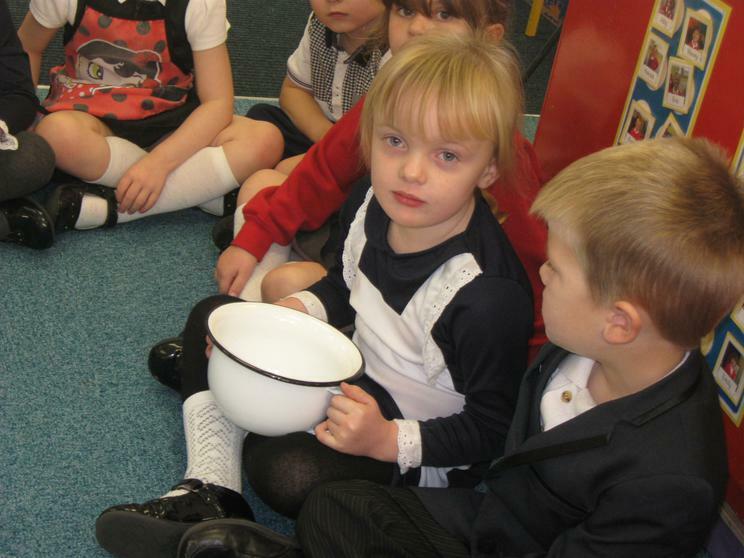 We learnt that water and milk are healthy drinks to keep our teeth strong. 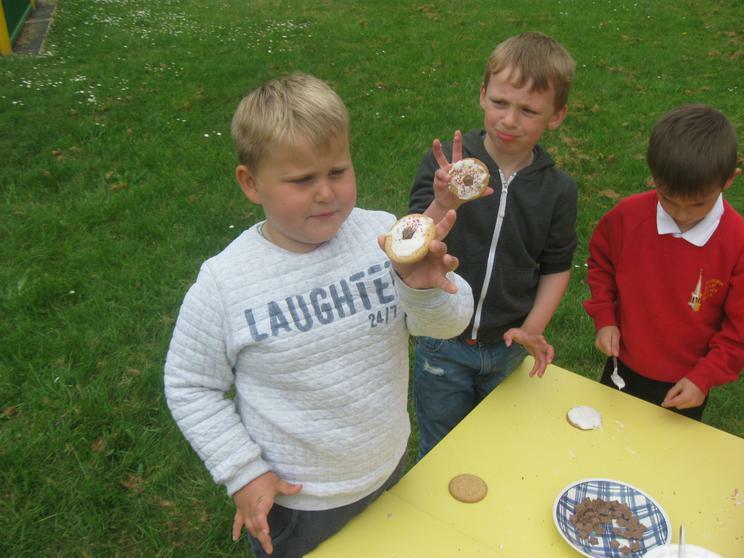 We should only have sweets occasionally, after a meal as sugar is not good for our teeth. 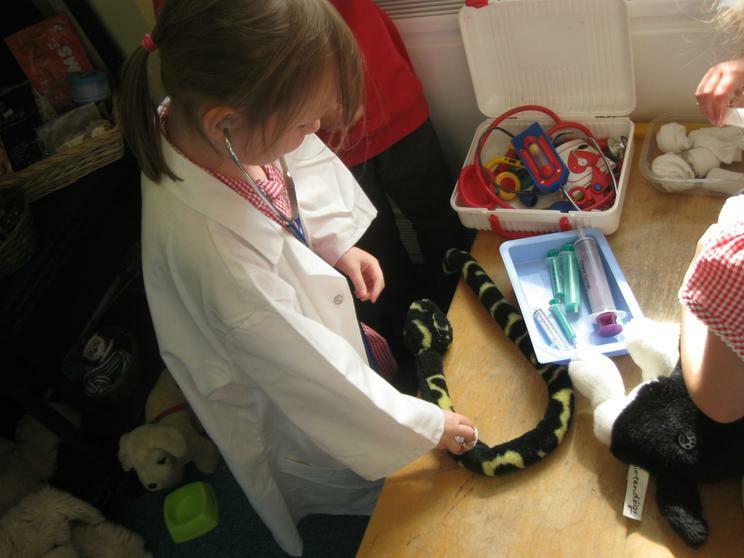 She left us some role play props so we can play dentists! 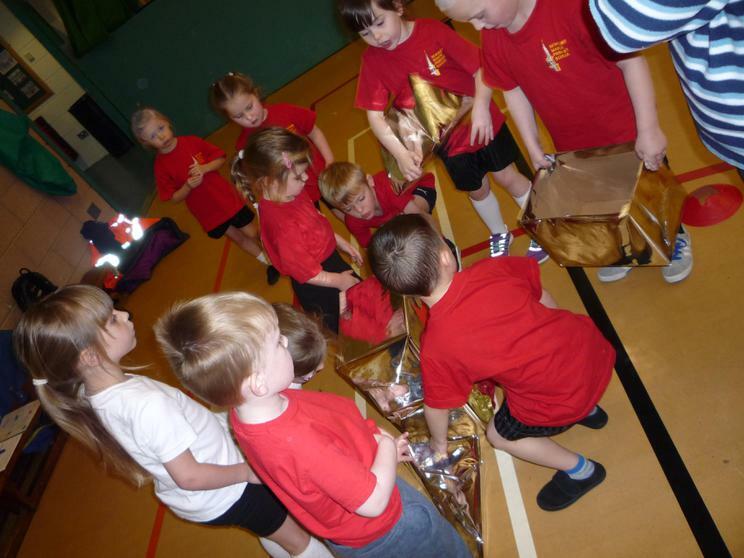 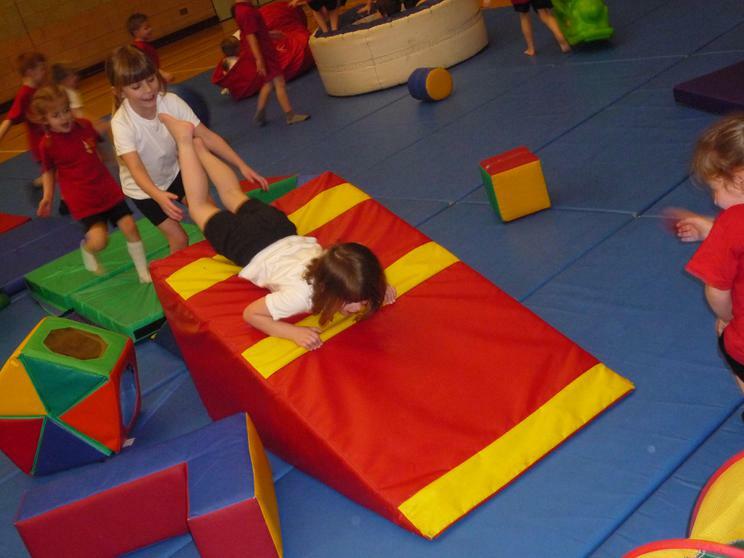 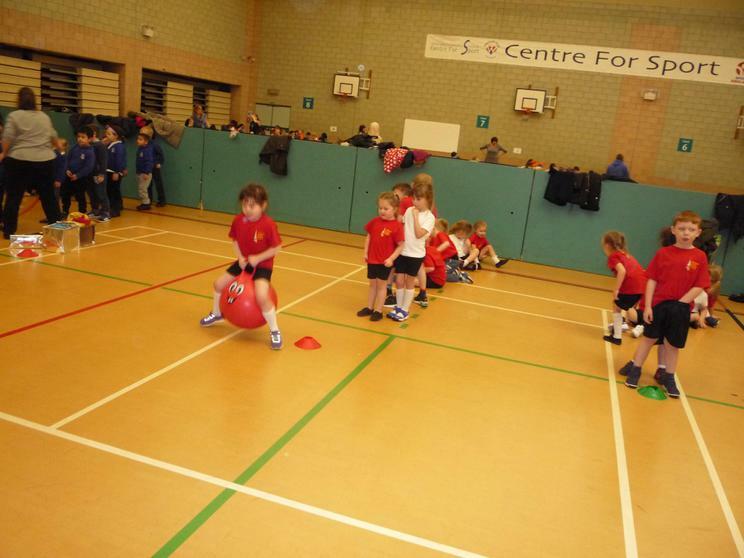 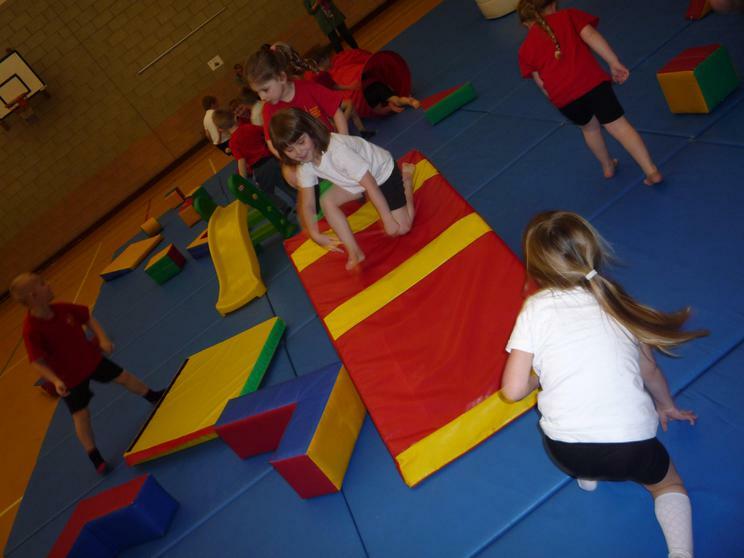 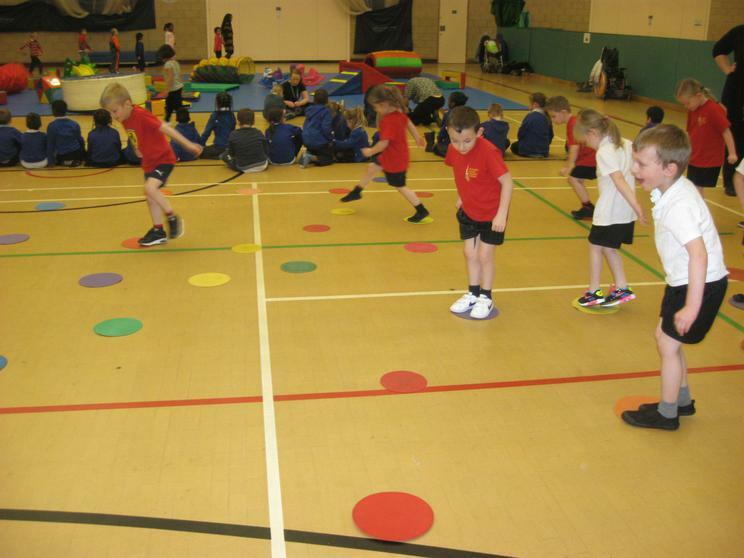 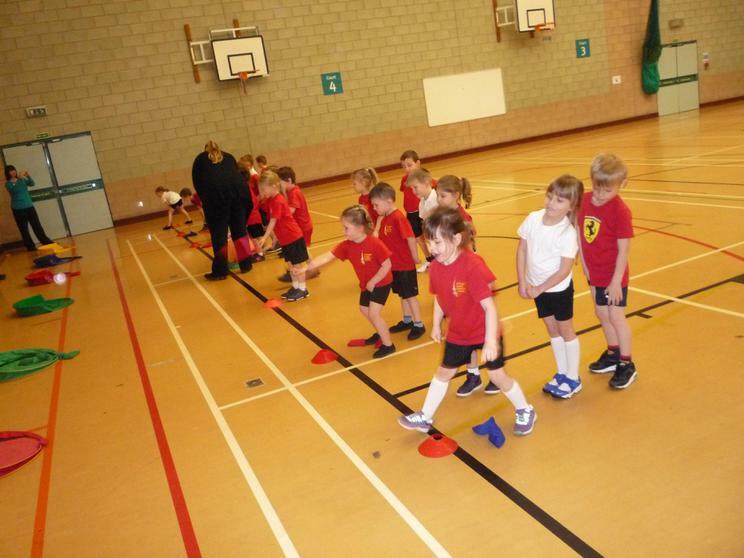 Our class was lucky enough to go to Westgate Centre for Sport to join other schools for a play festival. 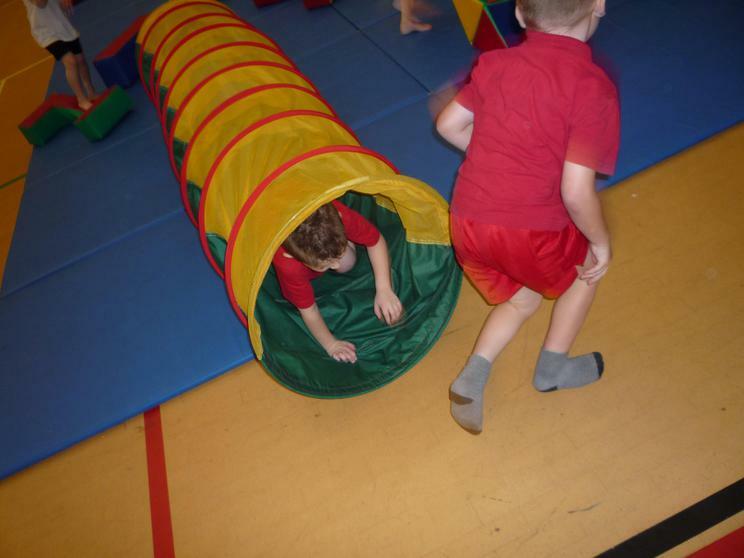 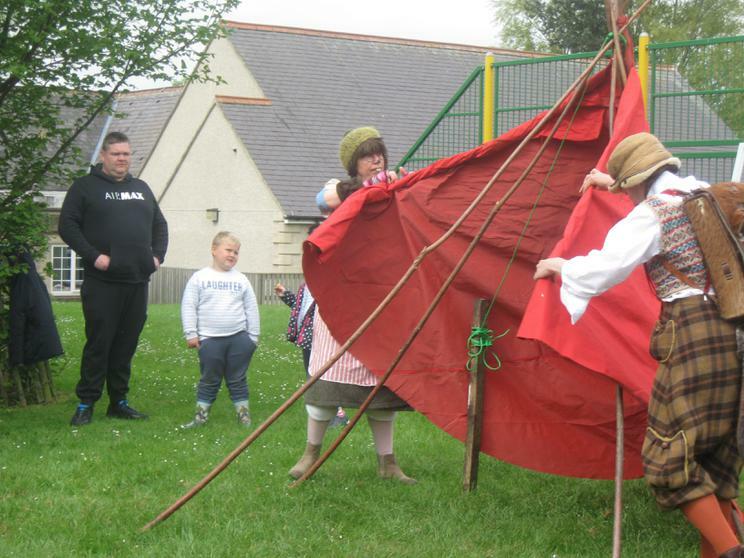 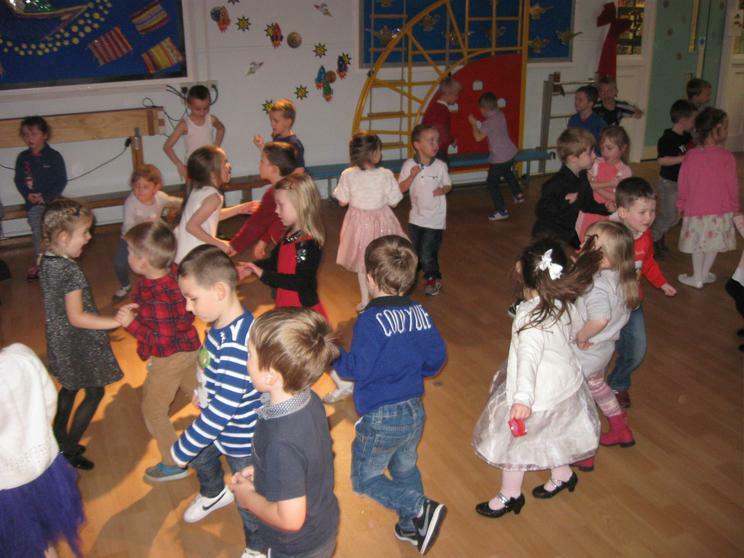 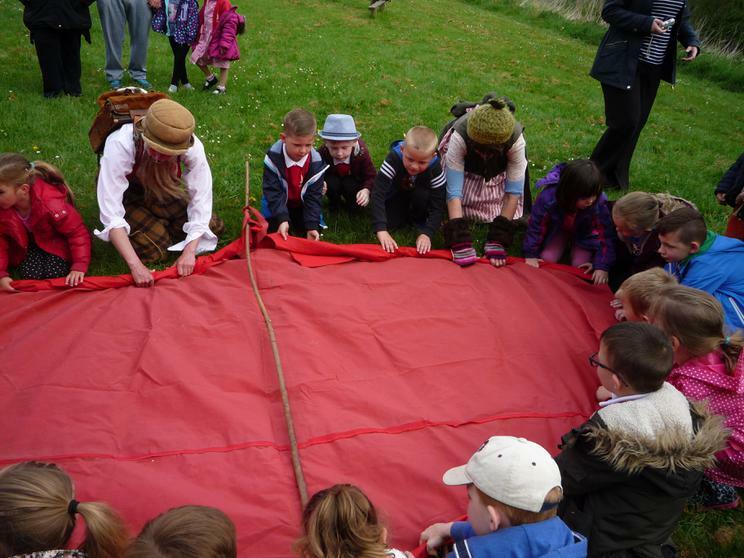 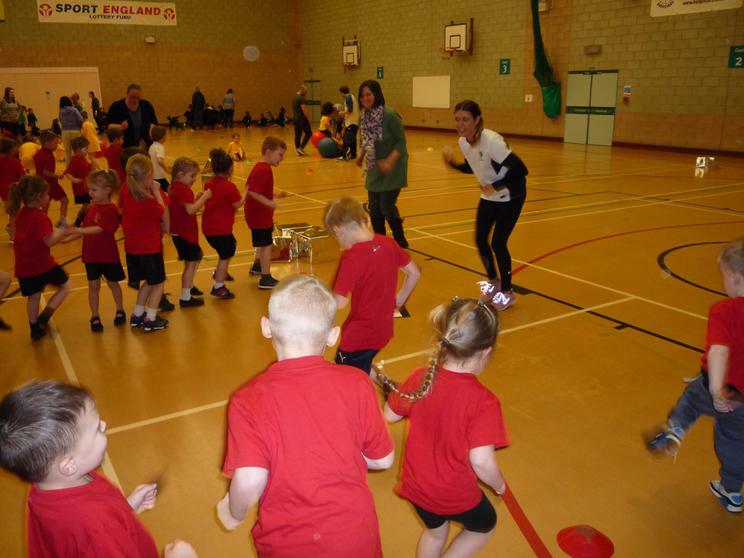 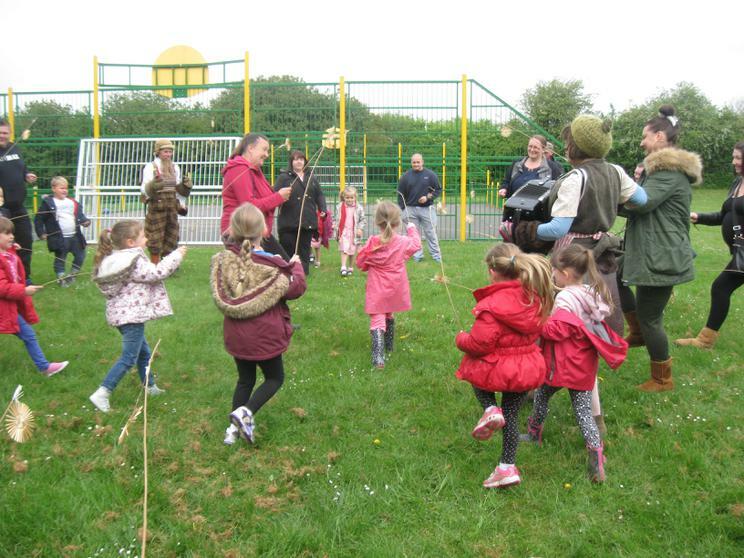 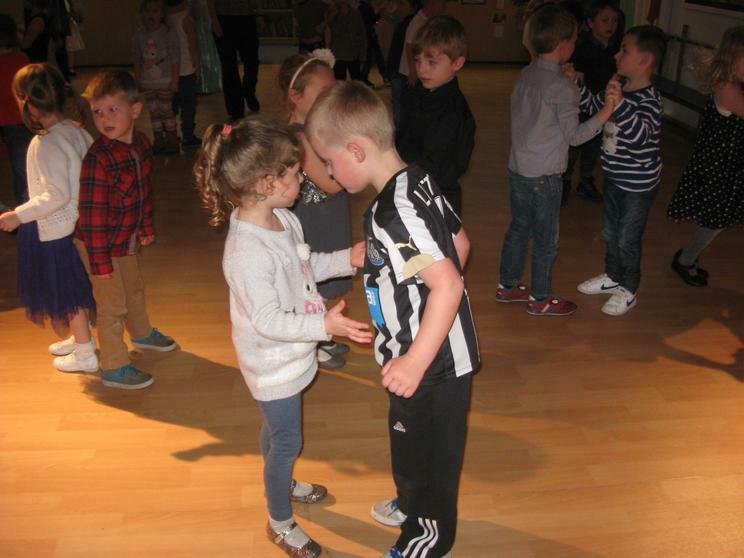 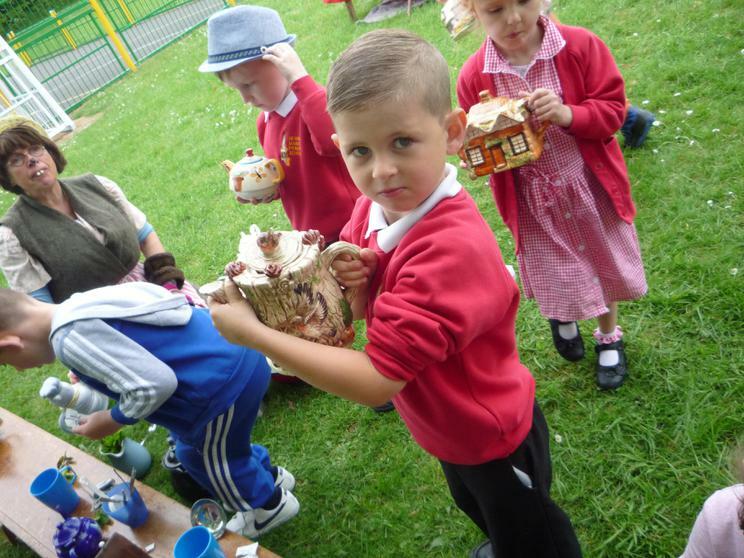 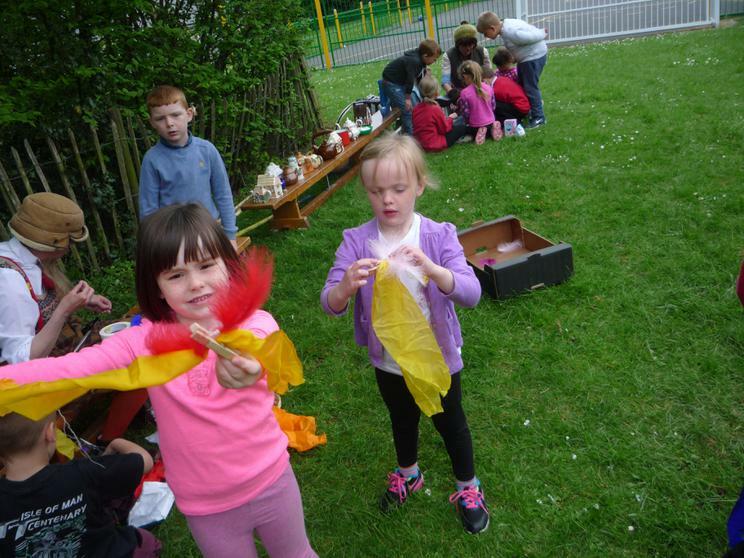 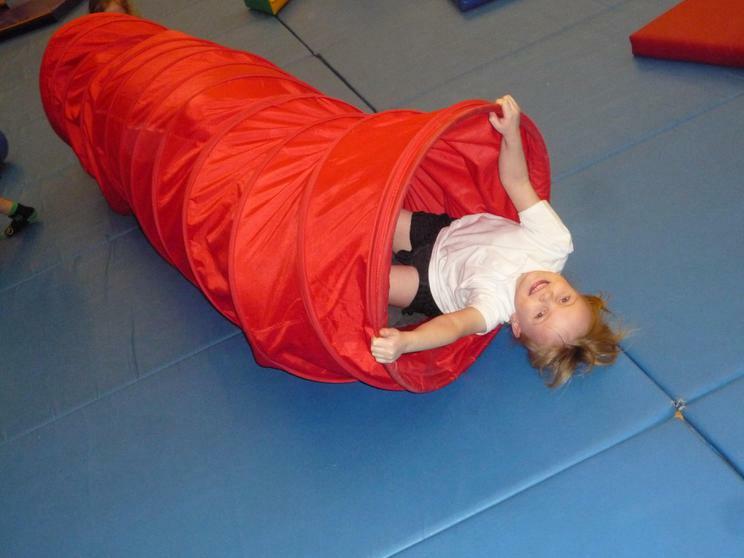 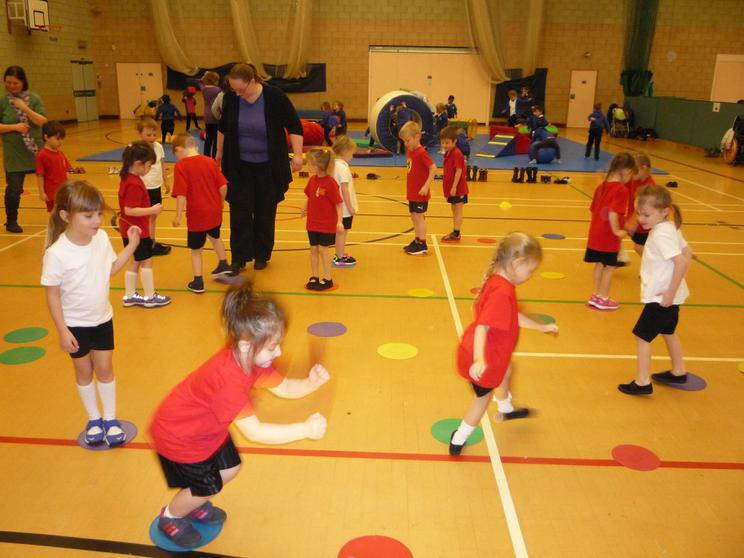 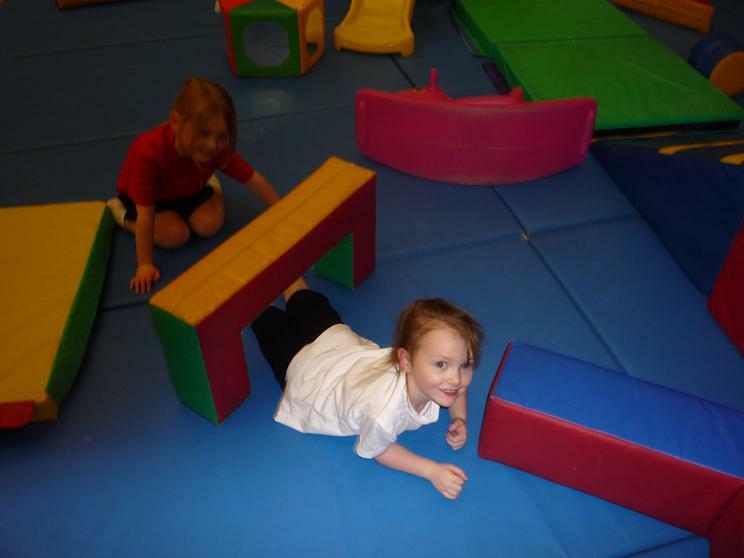 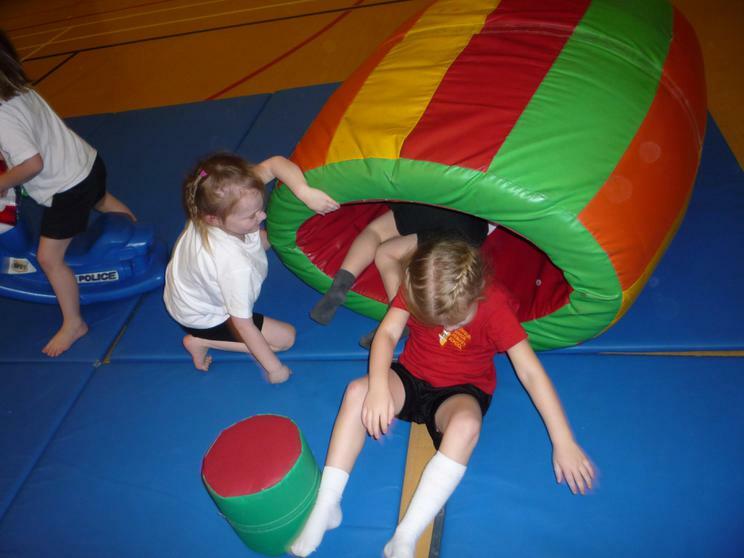 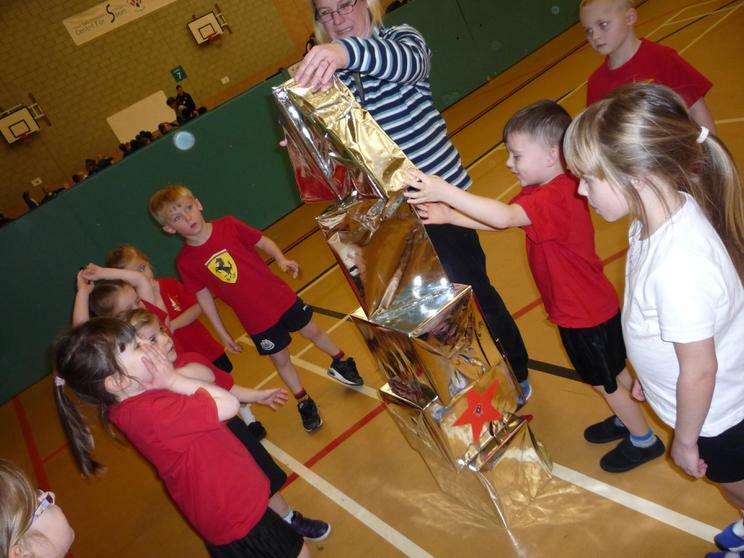 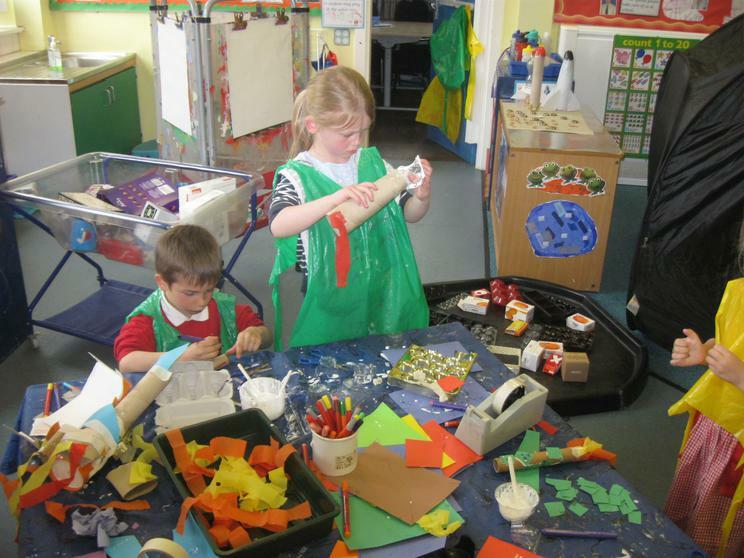 We took part in a carousel of activities which kept us busy and active, at the same time we had lots of fun. 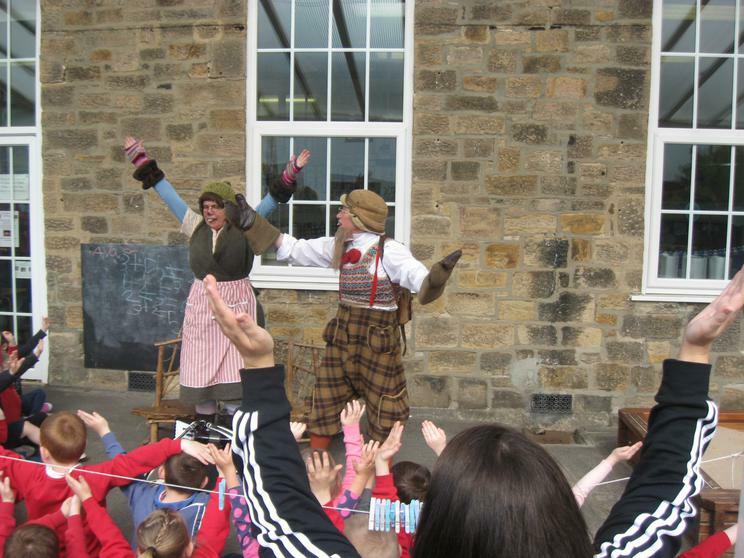 A great afternoon, thanks to Mrs Dooley for arranging our trip, and to Chloe and Ryan for organising the activities. 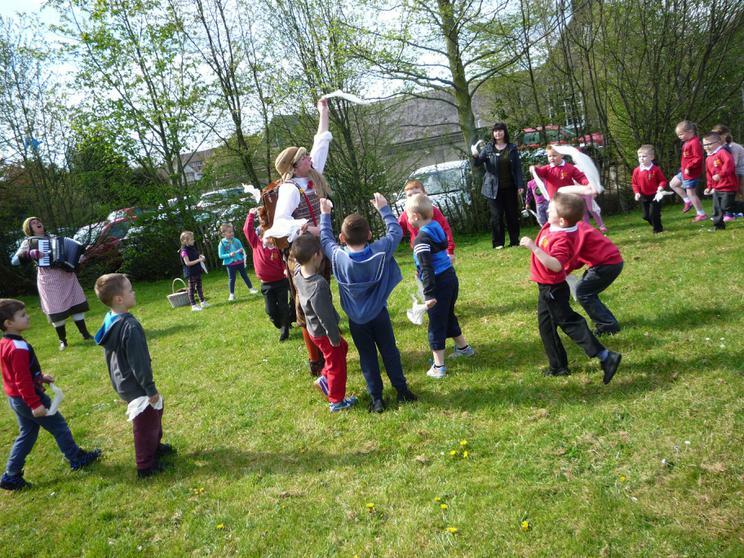 Ray from the Bird of Prey Centre at Kielder brought some of his owls to school today. 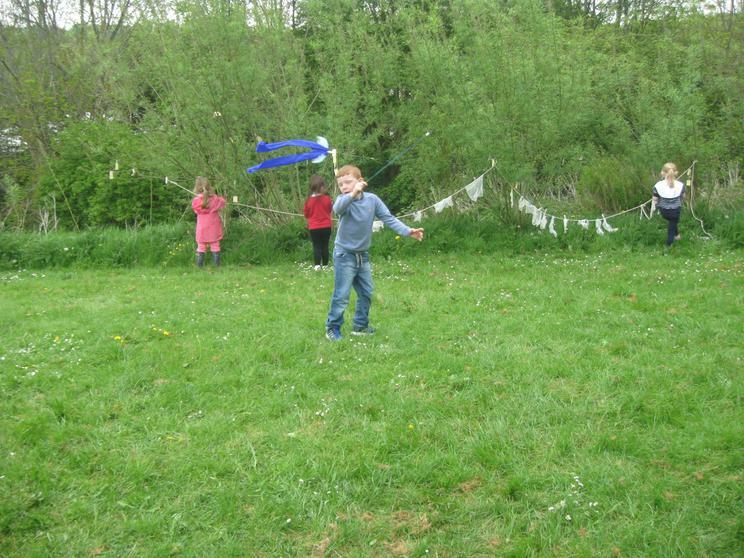 There was a pretty barn owl called Whisper, Gizmo - a huge European eagle owl and some other smaller owls, as well as a vulture. 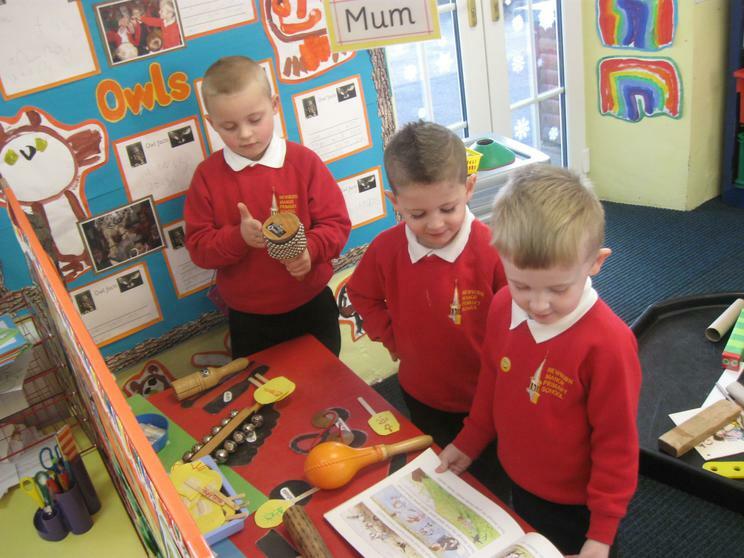 He told us lots of interesting facts about owls. 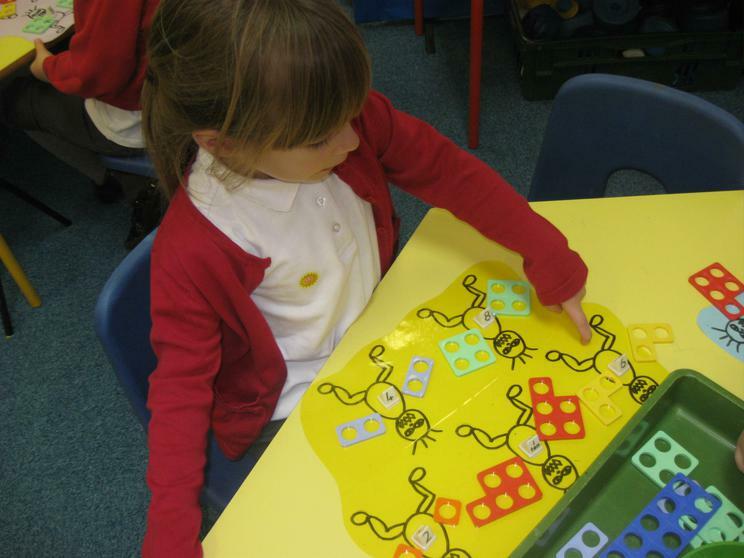 Can you remember when owls with yellow eyes hunt? 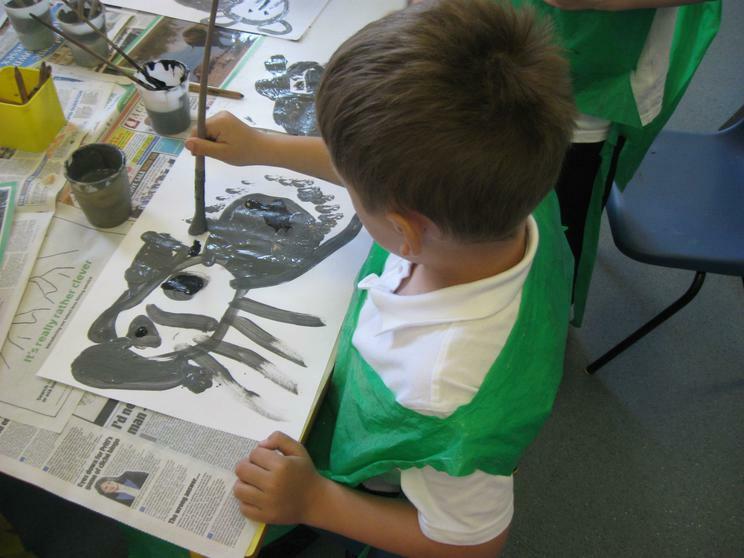 And owls with orange eyes? 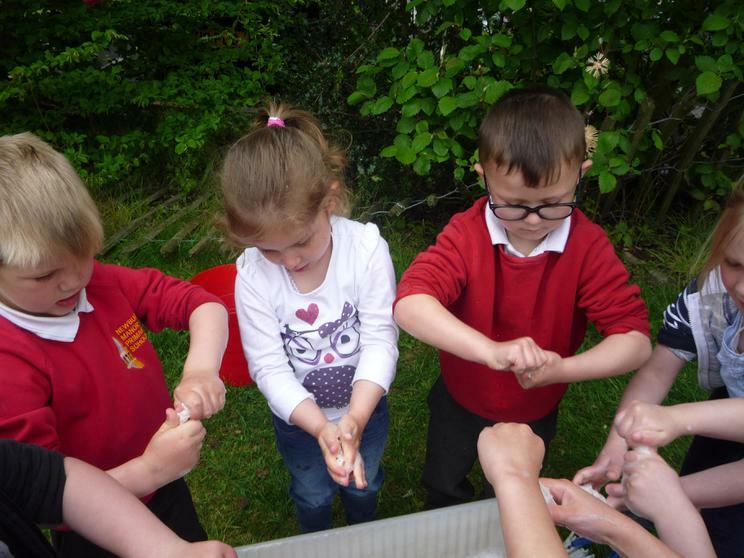 When we stroked them their feathers were really soft. 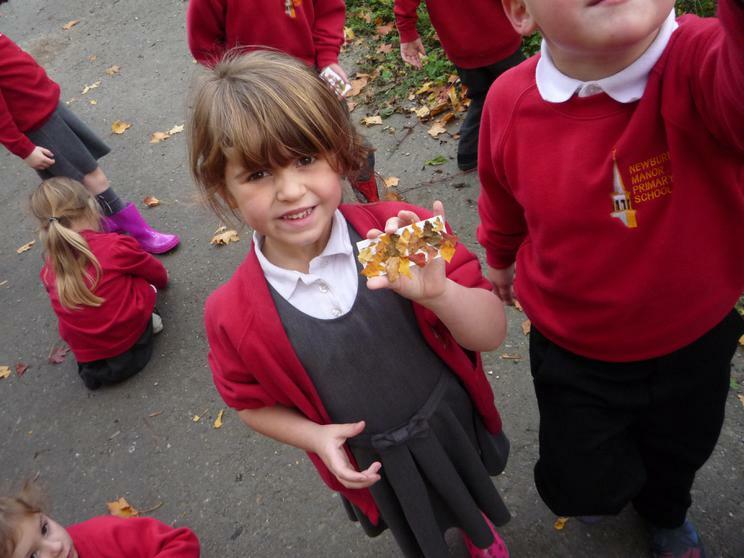 When Oli and Abby held Gizmo he was so heavy! 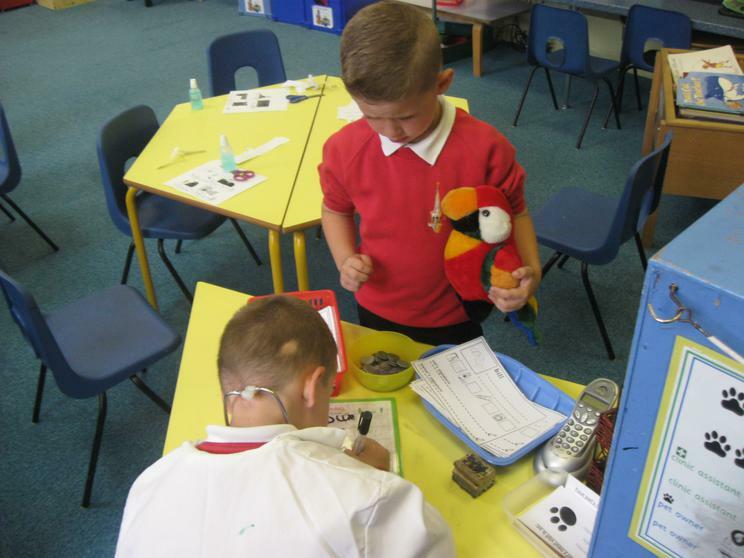 The birds are very friendly - they think Ray is their Dad! 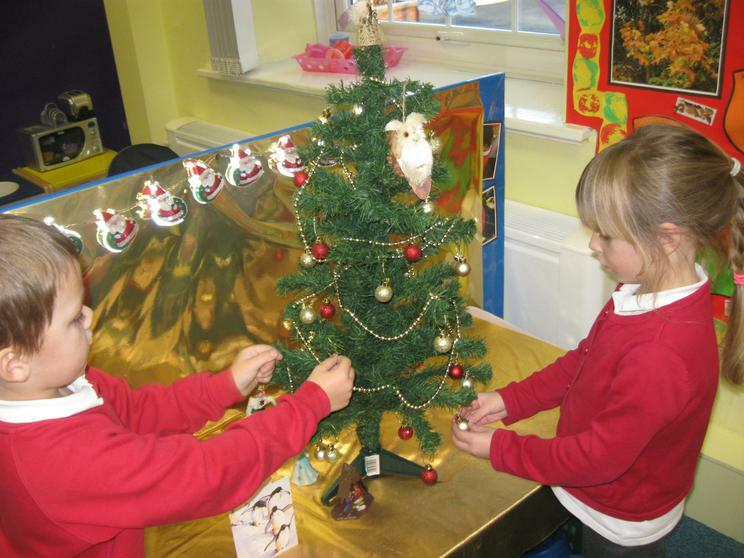 We have celebrating Christmas in the Reception class. 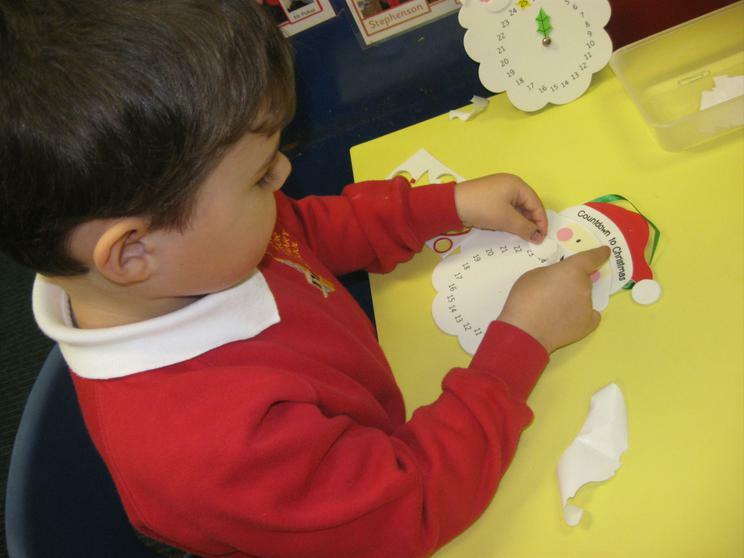 Our Christmas cards have lovely sparkly winter trees on them and we hope you like our calendars. 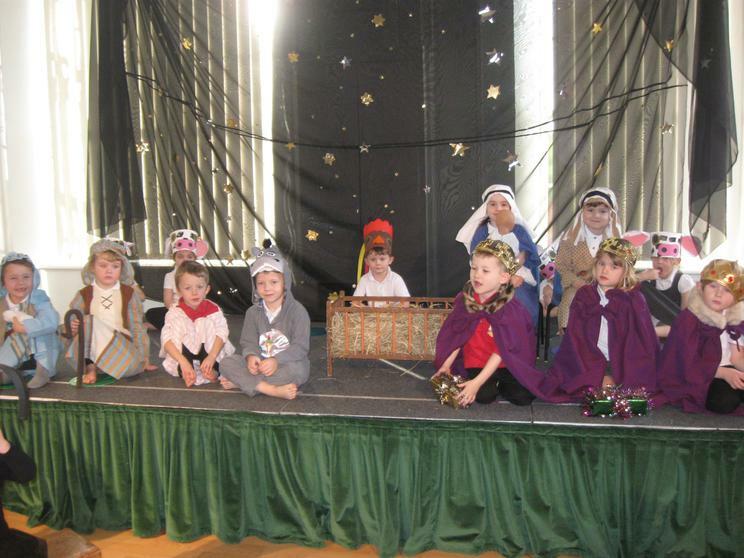 Everybody sang nicely in our Nativity play when we told the story of the first Christmas, when Jesus was born. 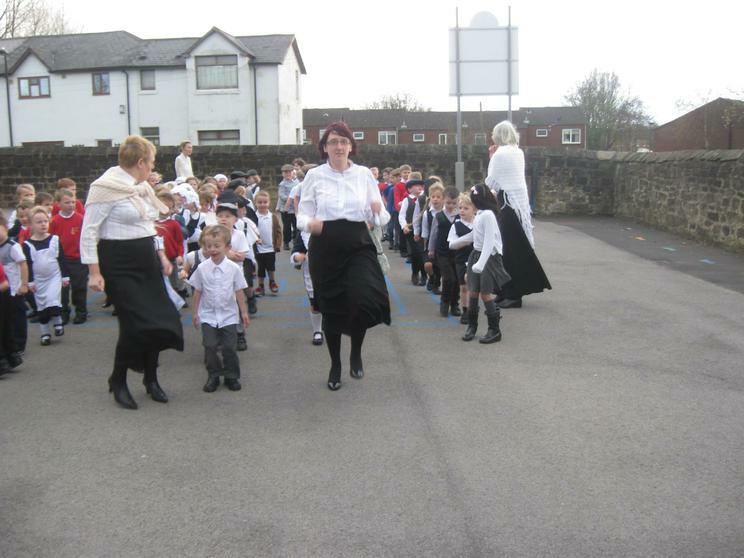 We were all dressed as different characters. 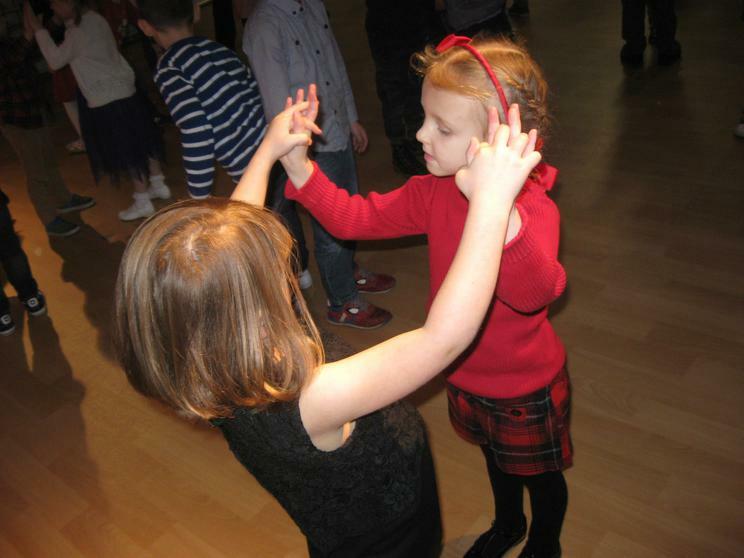 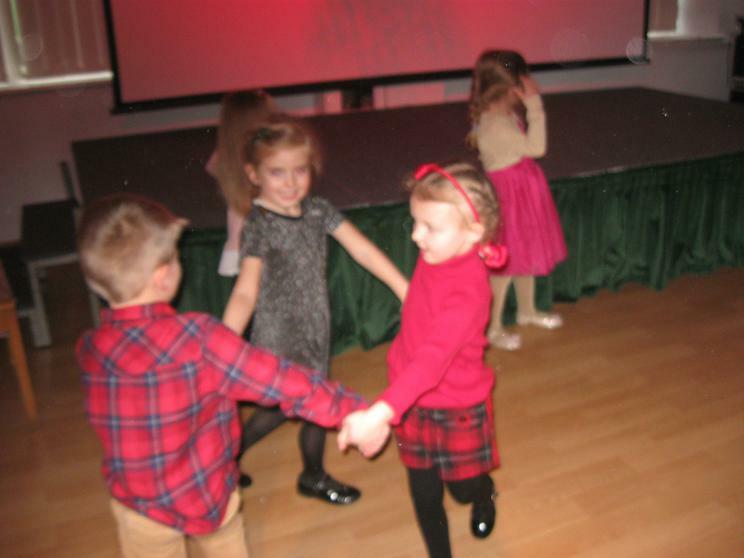 We had great fun at our Christmas party too. 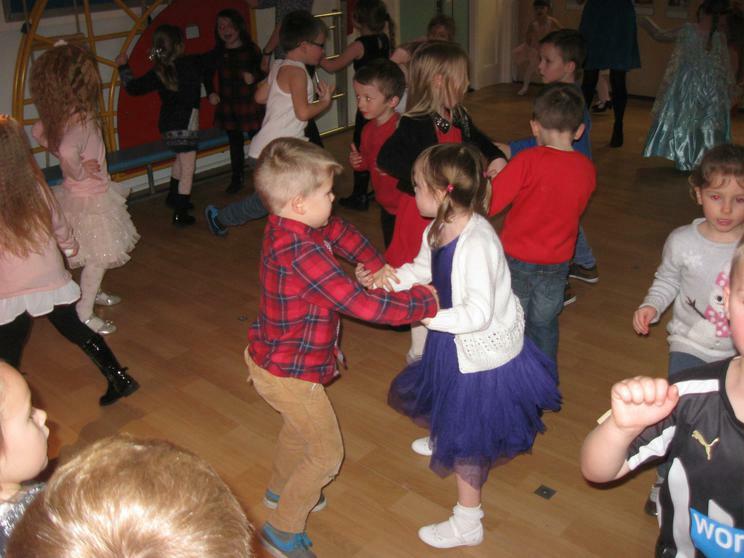 As well as dancing in our beautiful clothes we played party games. 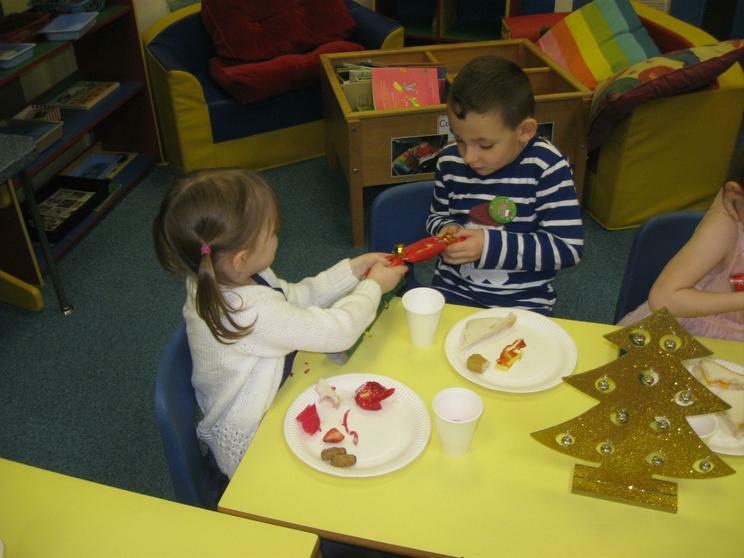 The food at the party was delicious - there was so much! 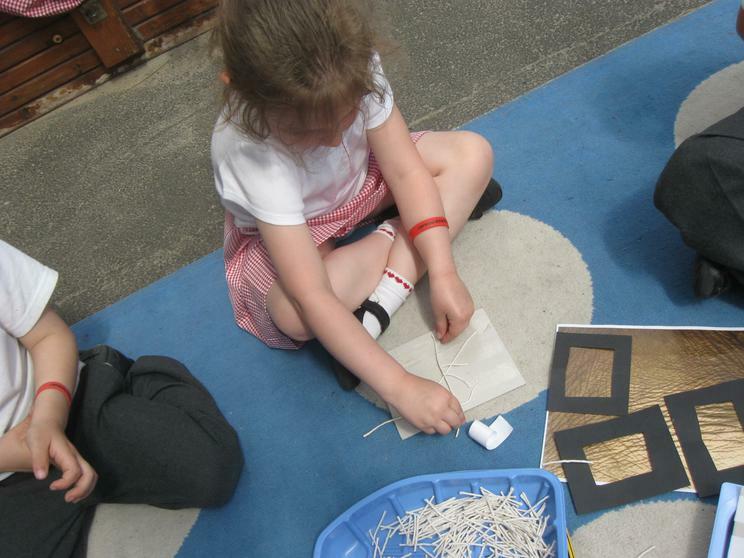 We pulled crackers with our friends. 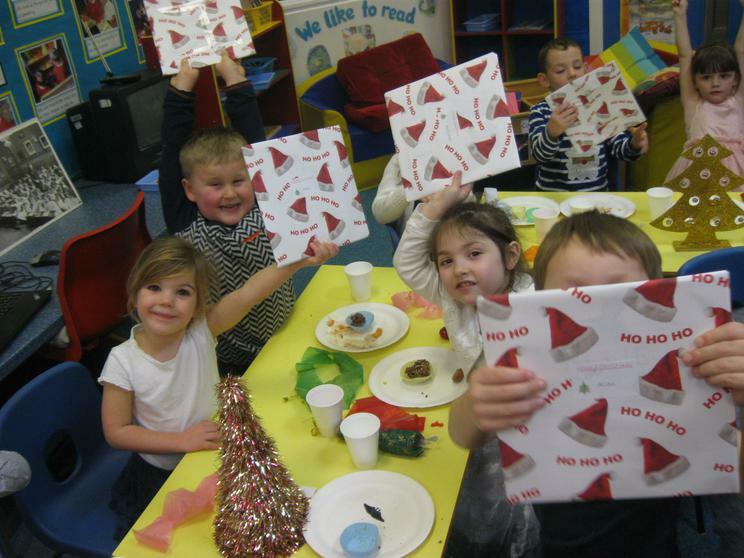 Santa called at school, we heard the sleigh bells, and he left a present for us all. 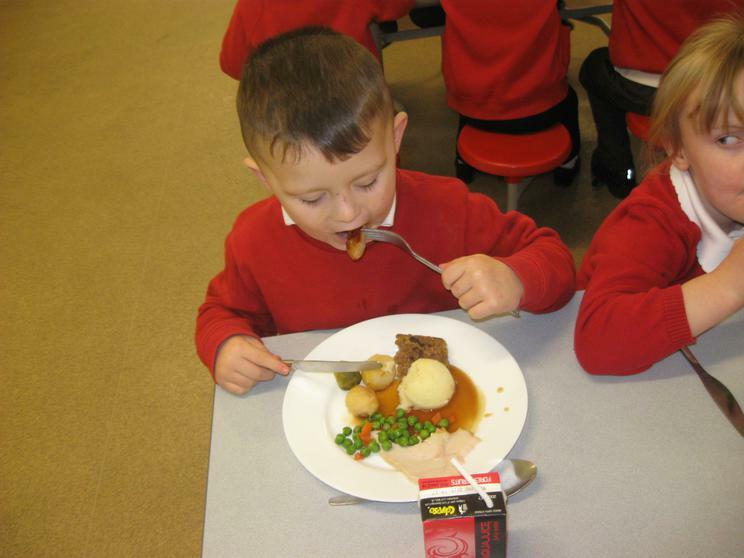 On Thursday we all tucked into a wonderful Christmas lunch - yummy - thanks to Paula and kitchen staff. 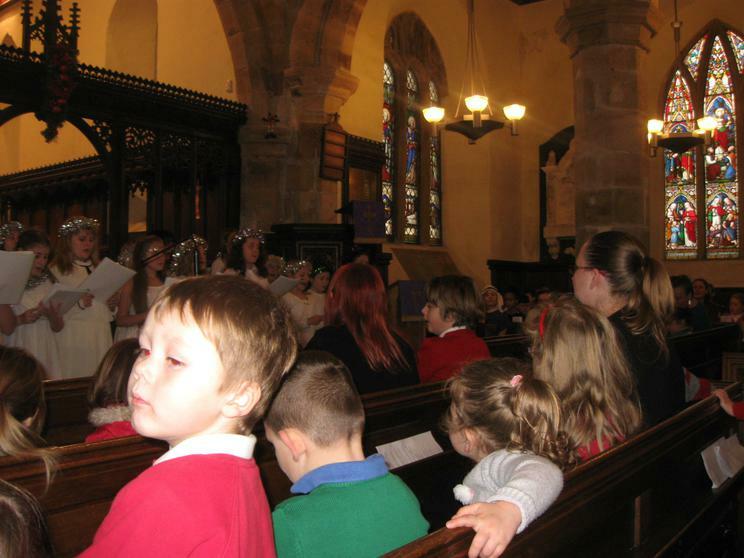 On the last day of term we all went to church to sing Christmas carols. 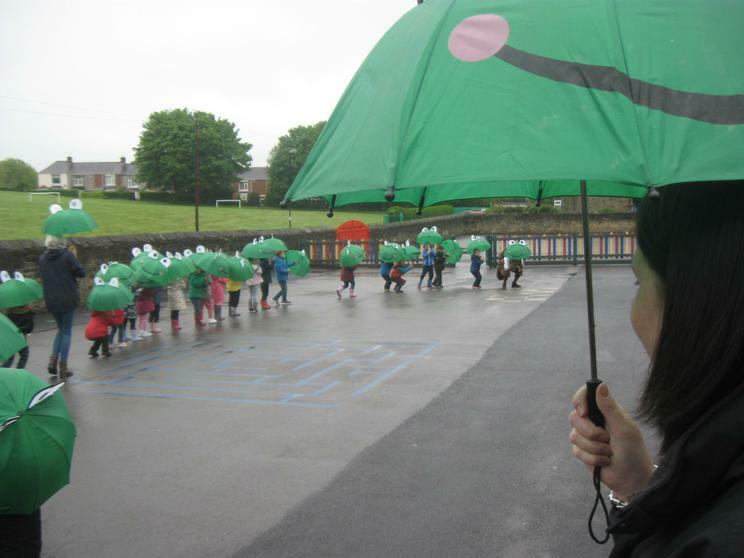 It was nice to have so many parents join us too. 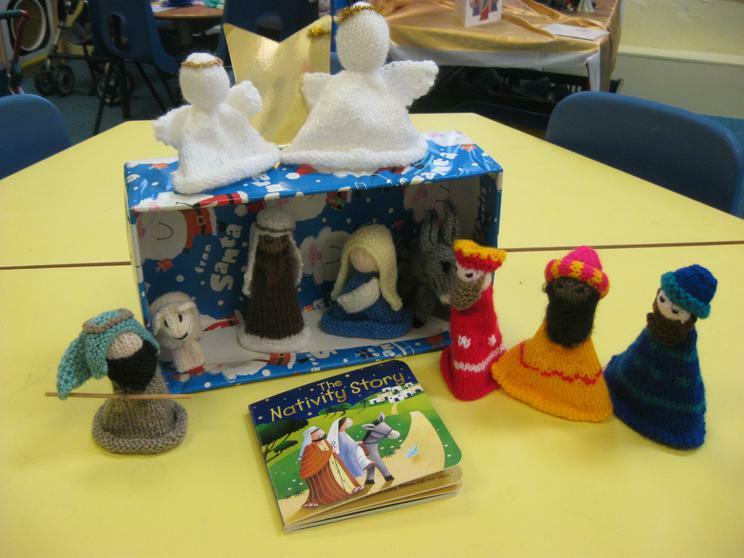 We got a wonderful present of knitted Nativity characters from the Knit and Natter group - thank you so much! 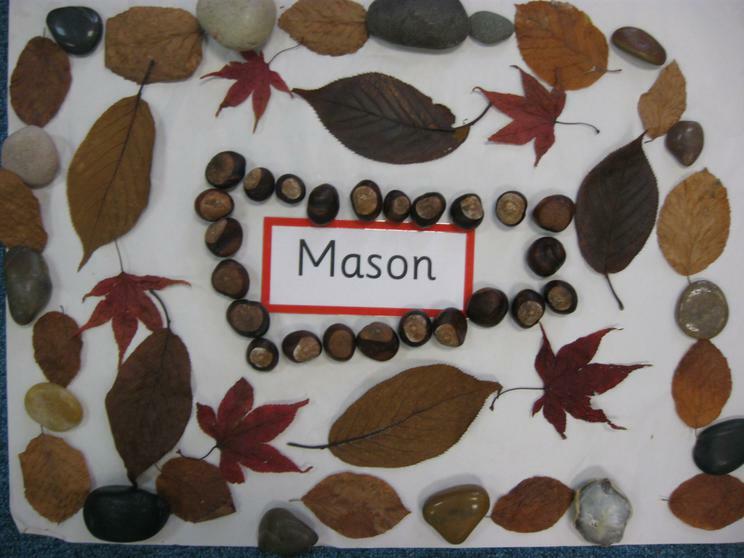 We will use them to re-tell he story of the first Christmas, when Jesus was born. 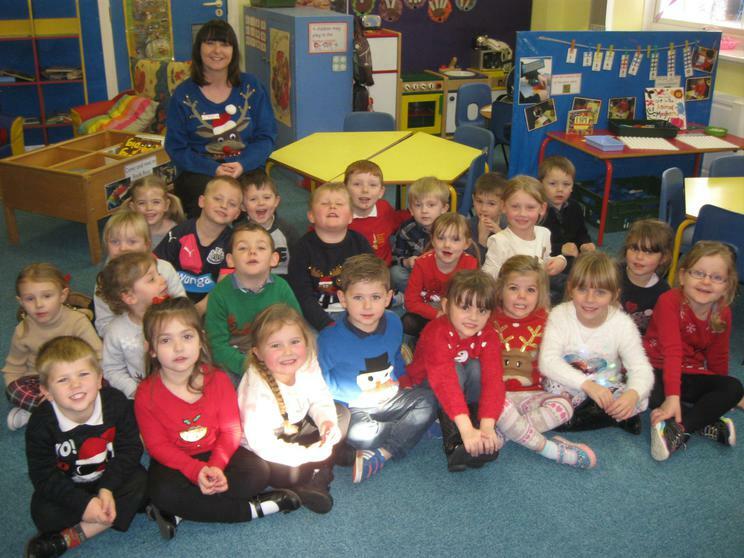 It's beginning to look a lot like Christmas - do you like our Christmas jumpers? 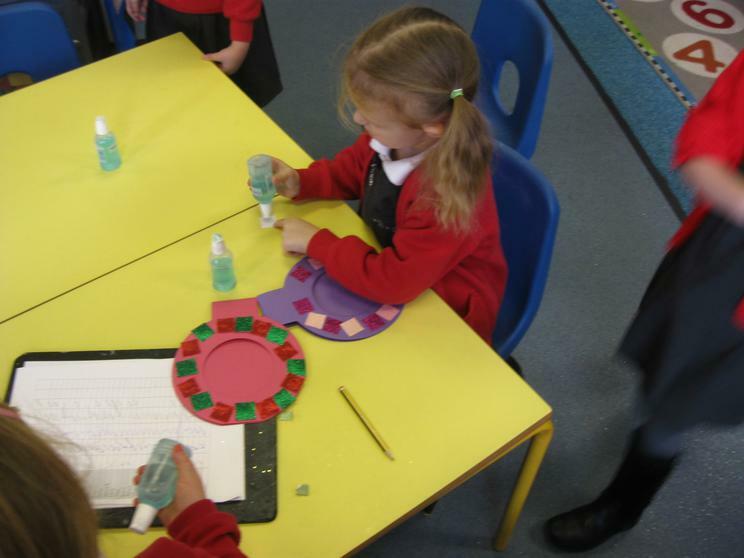 We are getting ready for our Christmas Fair too, with our enterprise products. 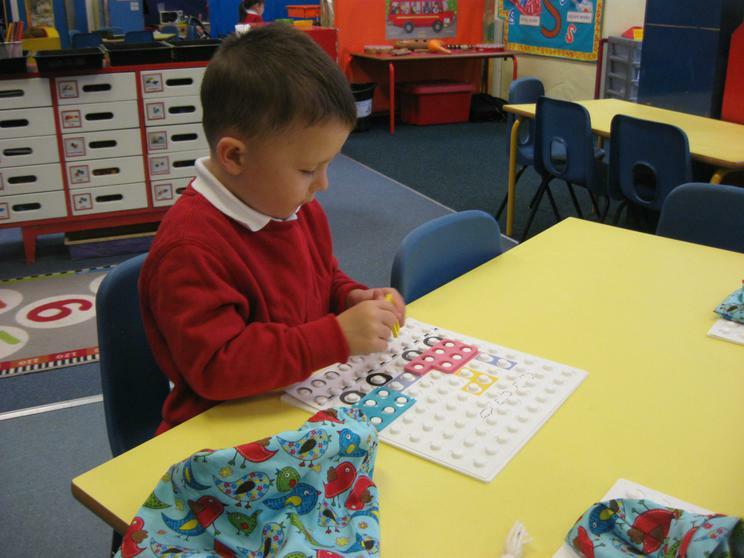 The Advent Calendars count how many more days until Christmas. 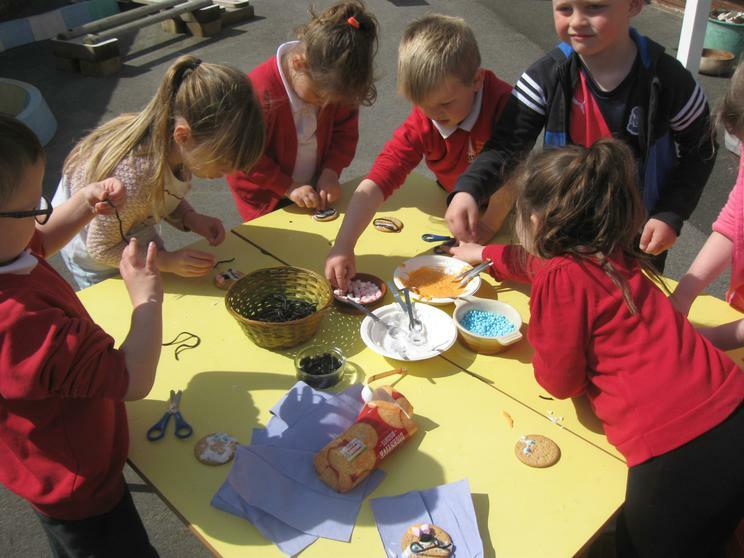 We have made them to sell at the fair, to help raise money for our school. 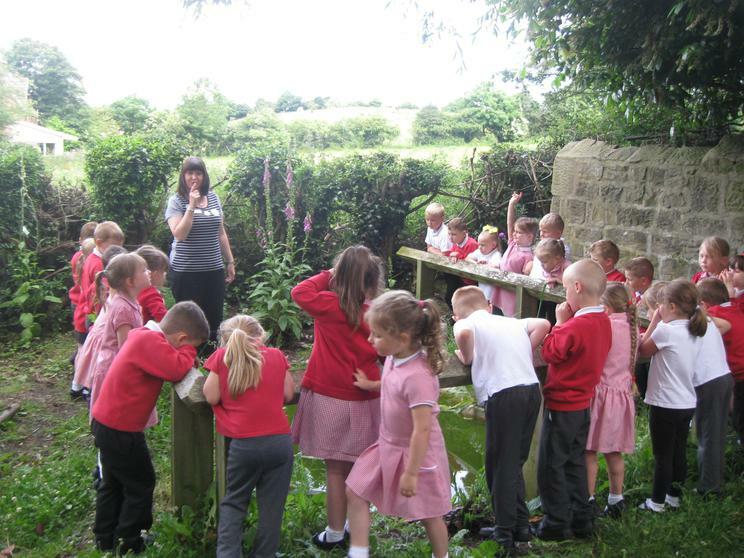 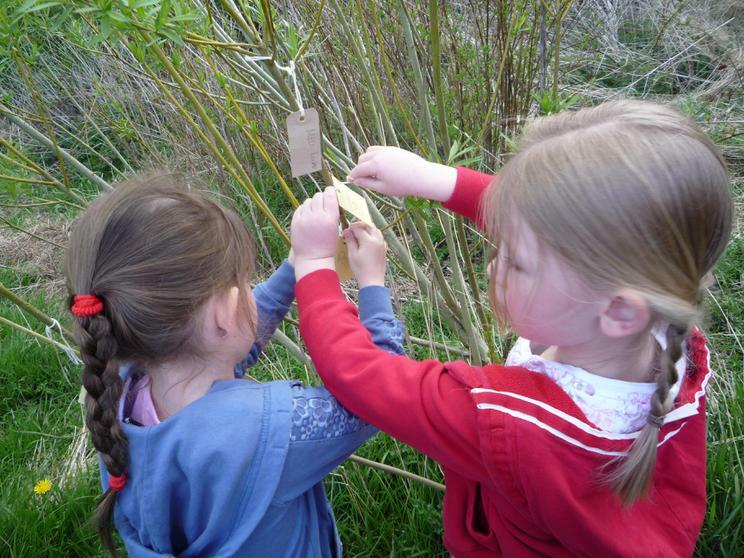 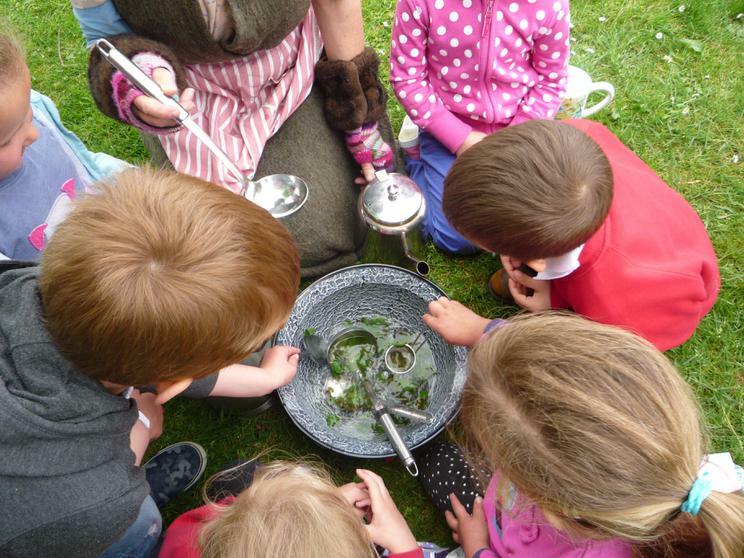 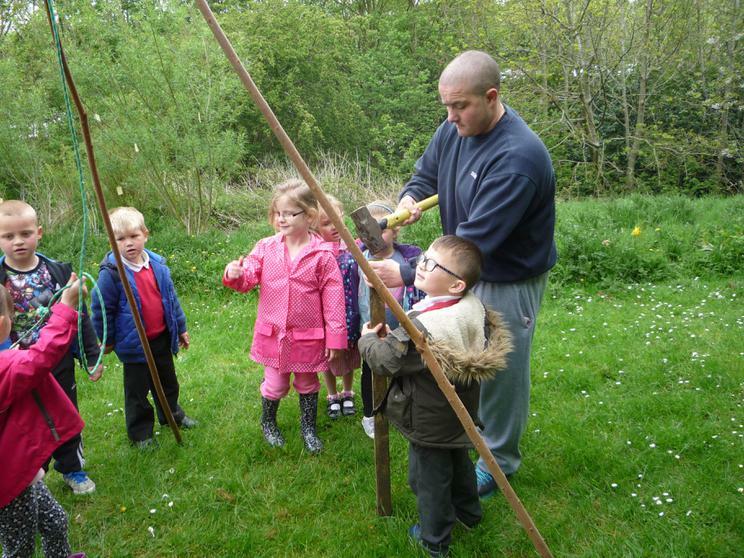 The Reception class visited Whitehouse farm. 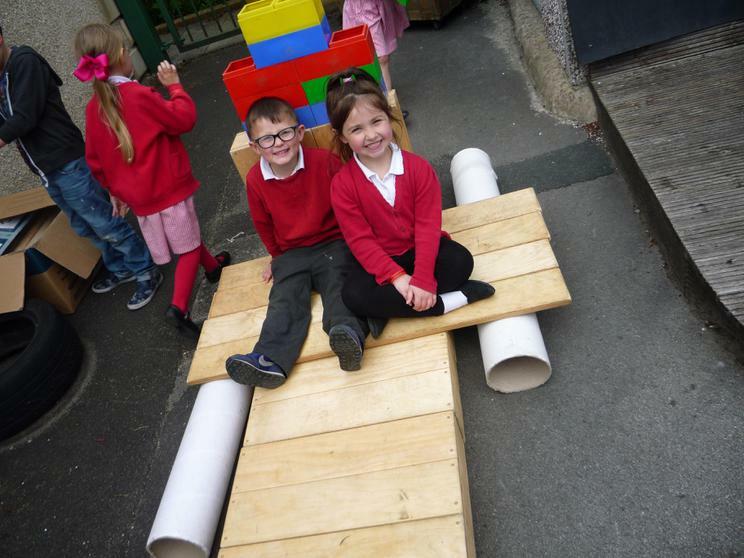 To begin with they had a tractor and trailer ride around the farm. 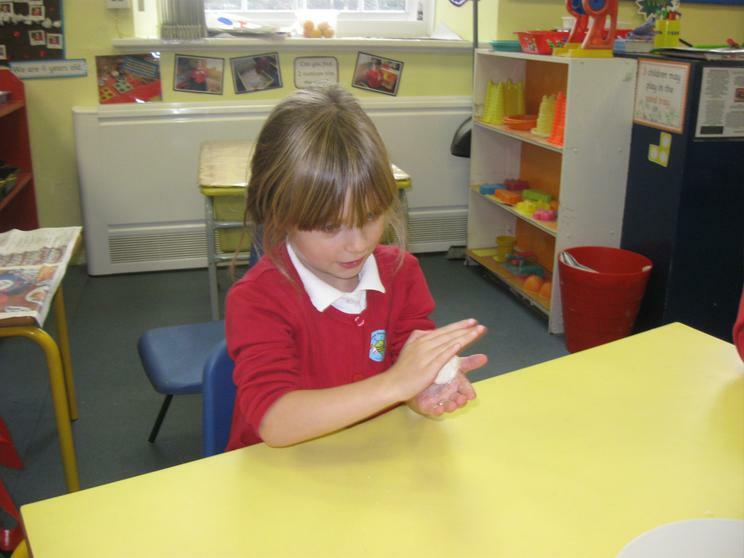 Next they stroked and held smaller animals and fed some large animals. 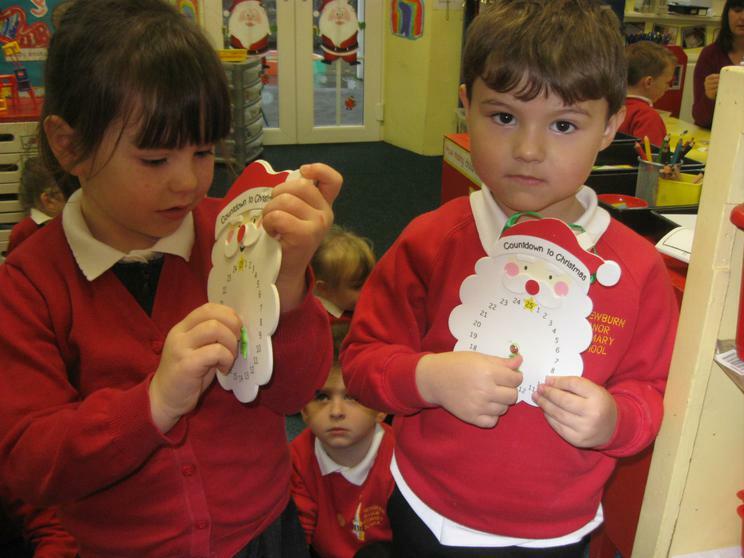 They also wrote and posted letters to Santa, and actually met him too. 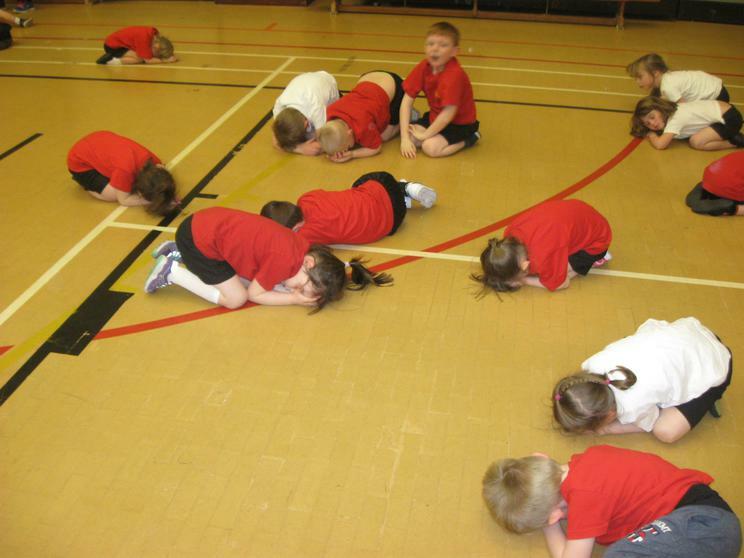 He was sound asleep at first so they had to wake him up. 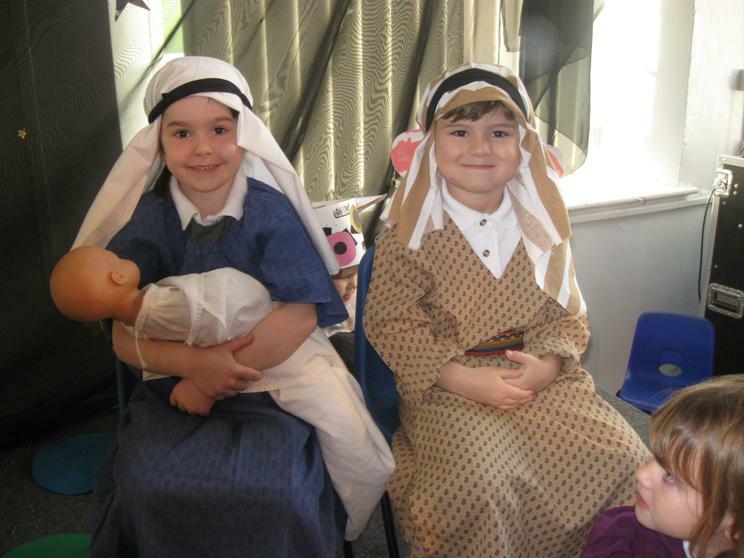 It was lovely to see 'Mary and Joseph' enter the stable, complete with a real donkey, for the Nativity. 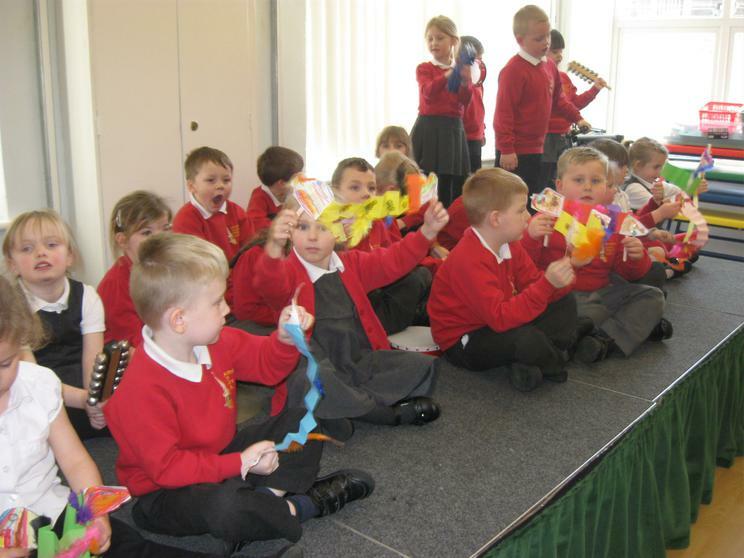 The children sang all three verses of 'Away in a Manger'. 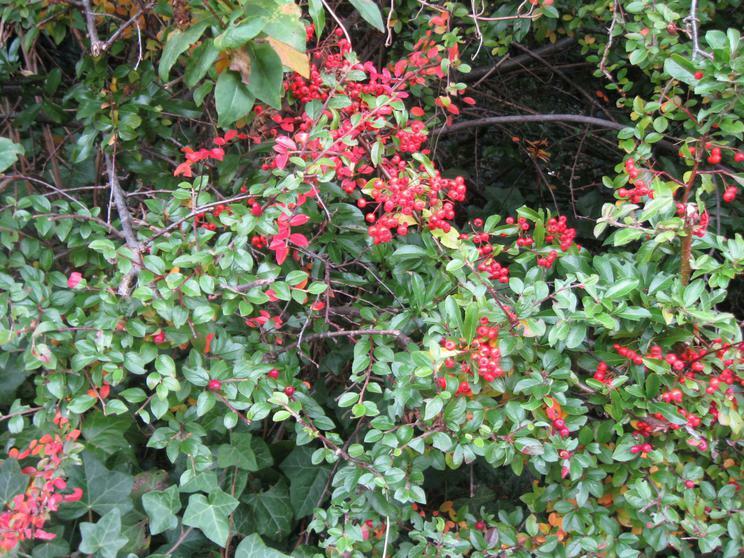 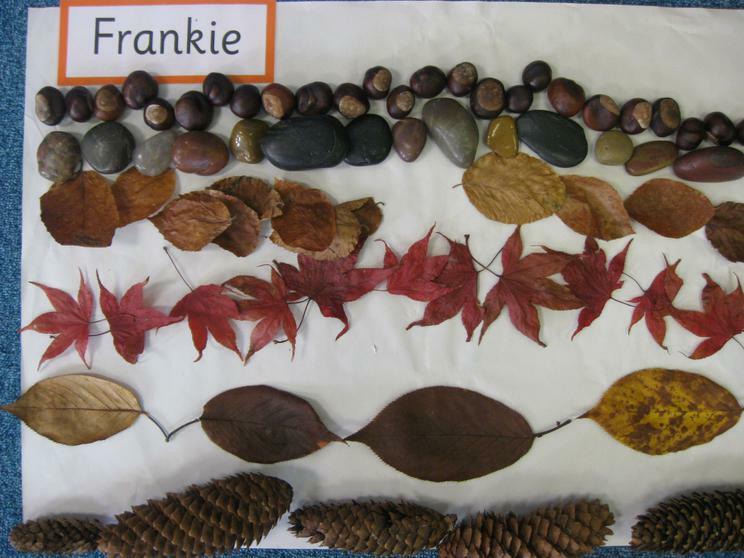 Look at the photos and see how many different animals you can spot and name. 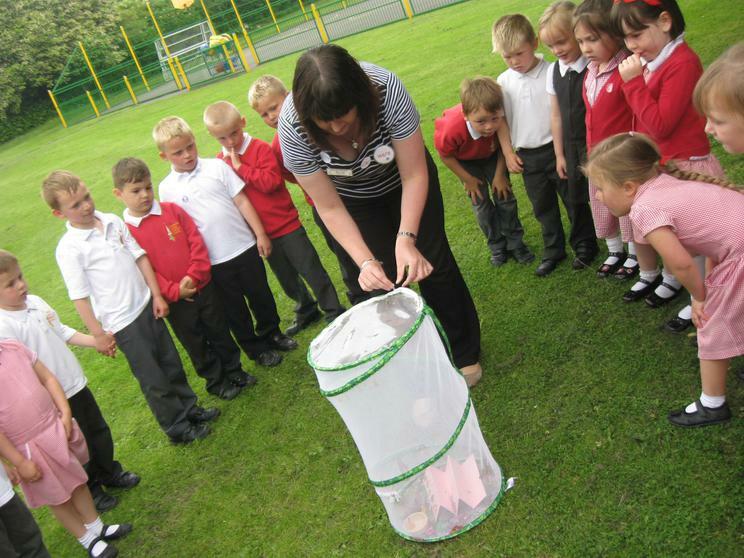 Can you see which creature Mrs Richardson held to try to over come a phobia? 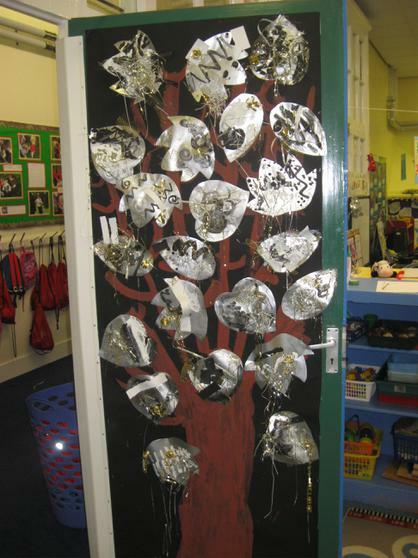 Look at our beautiful door display! 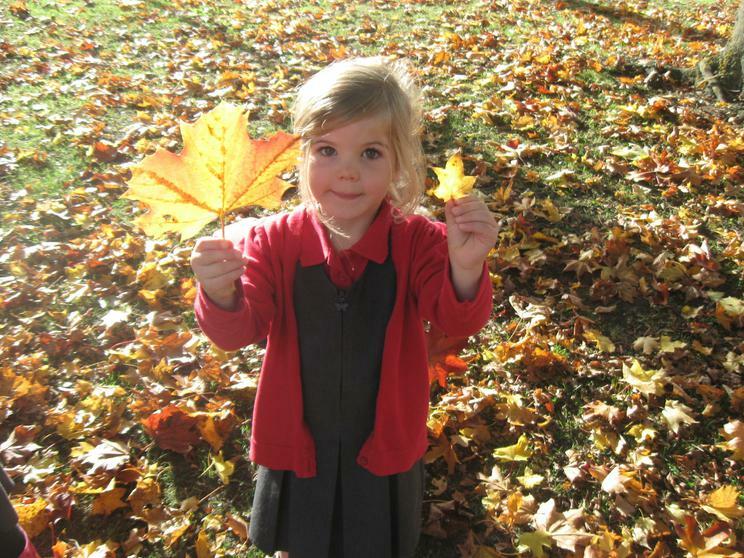 Harlie found a frosted leaf on her way to school one cold day. 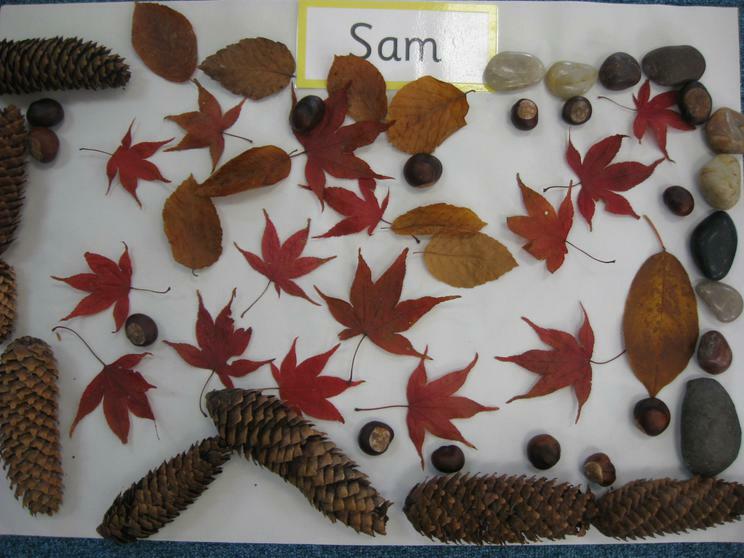 We looked at the sparkling ice crystals and made collage pictures of icy frosted winter leaves for our Christmas door and are proud of the finished display – all our own work! 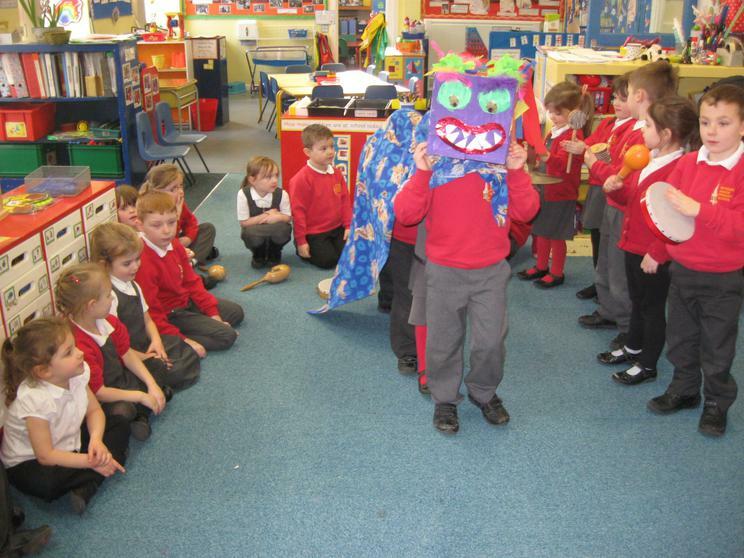 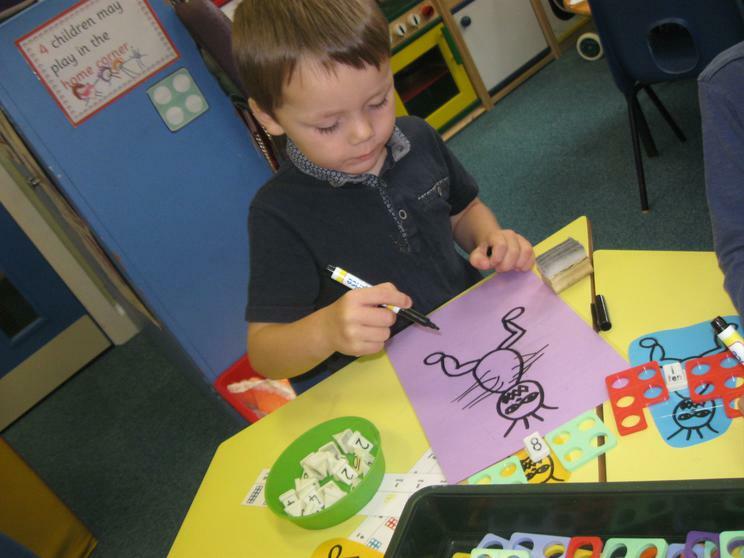 The children were fascinated by Ravanna, the monster in the Diwali story who had 10 arms on each side, so we decided to make our own monsters to investigate doubles in a fun way. 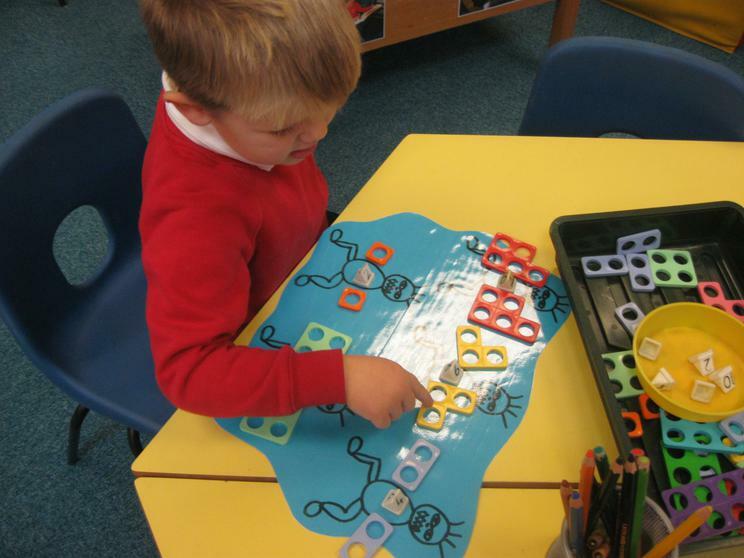 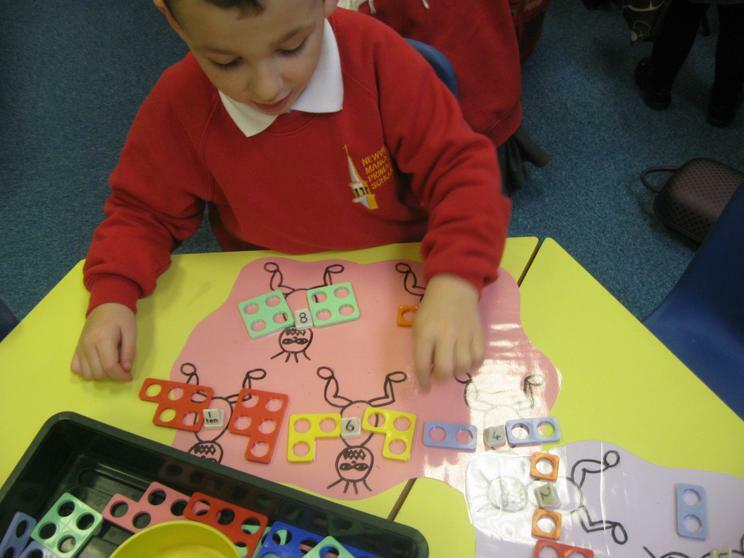 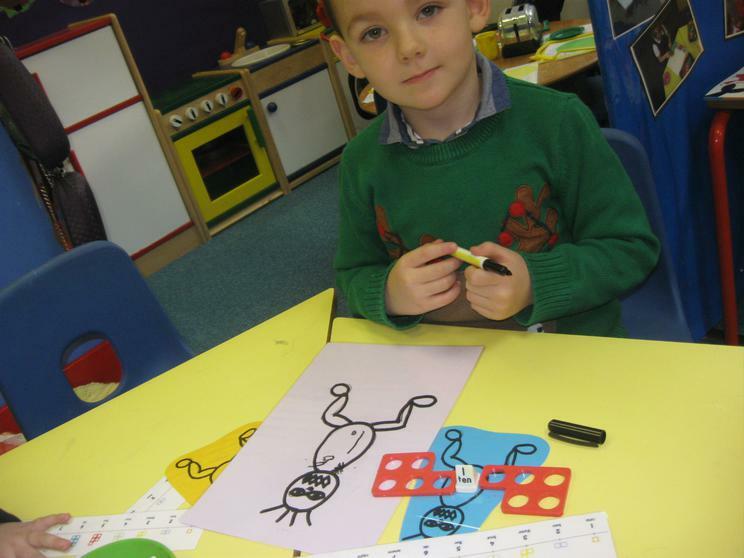 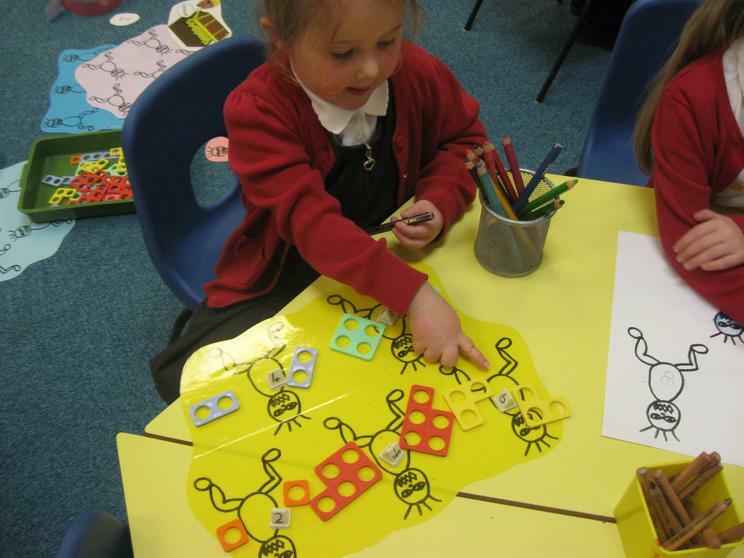 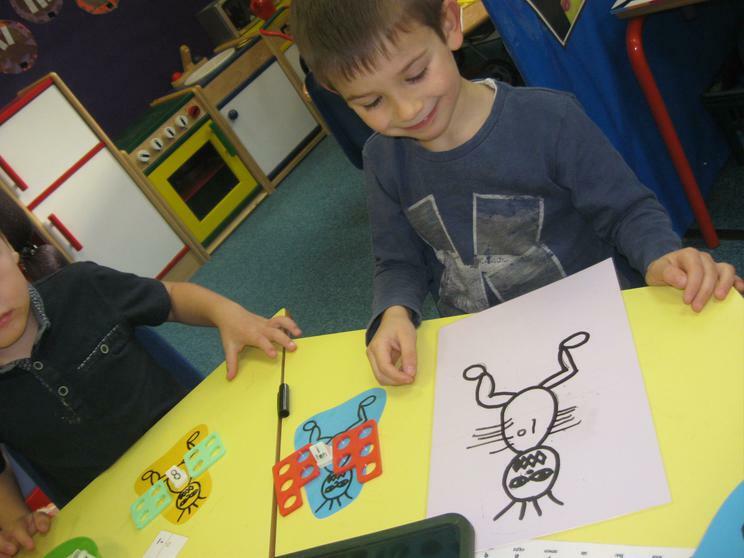 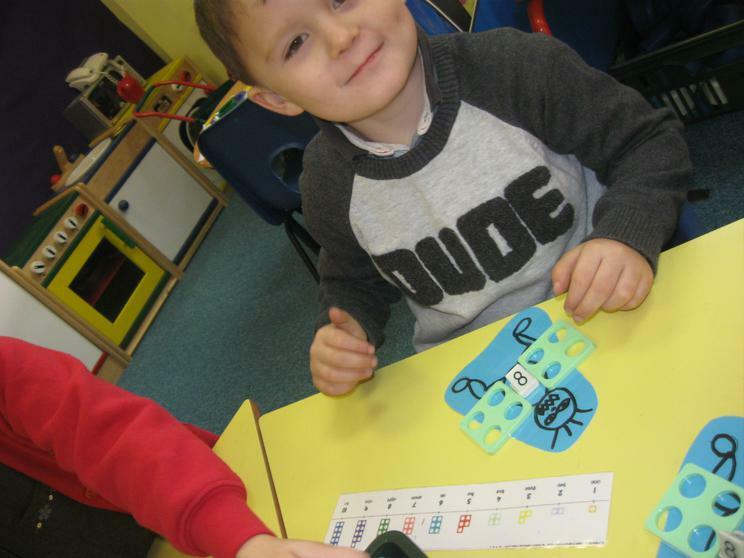 They made different doubles monsters, using the ever versatile numicon tiles, and found the totals. 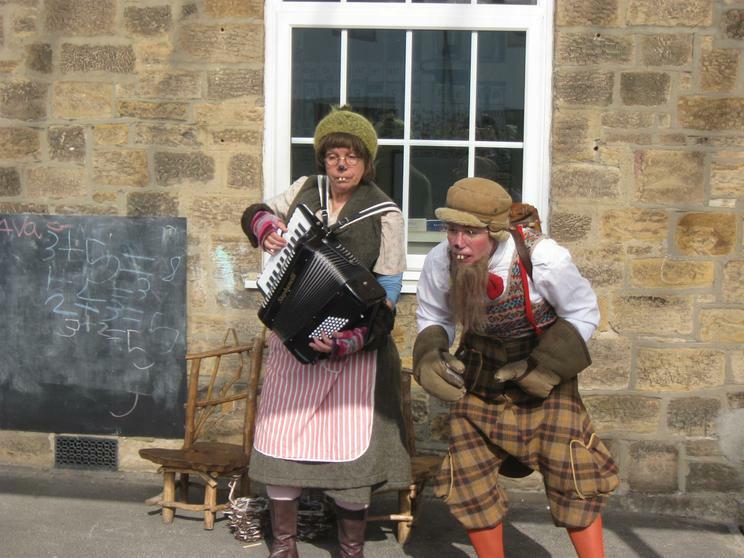 Some went on to do some early recording too. 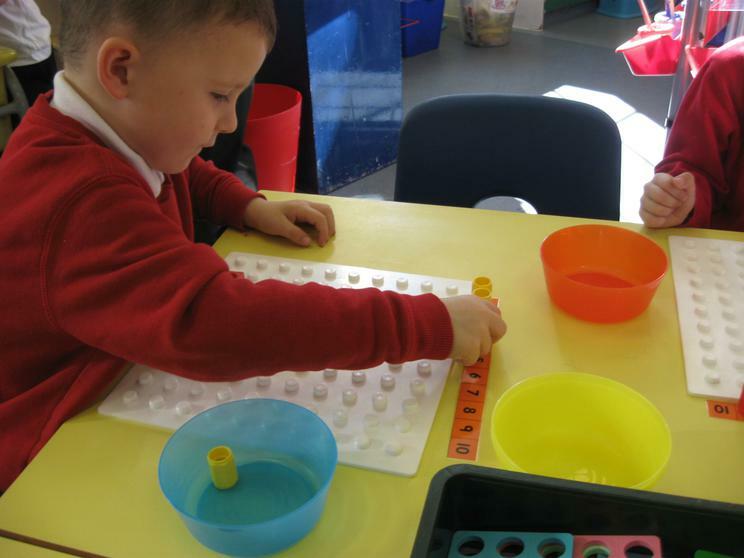 They continue to enjoy this activity during child initiated time, supporting number recognition and beginning to embed number facts. 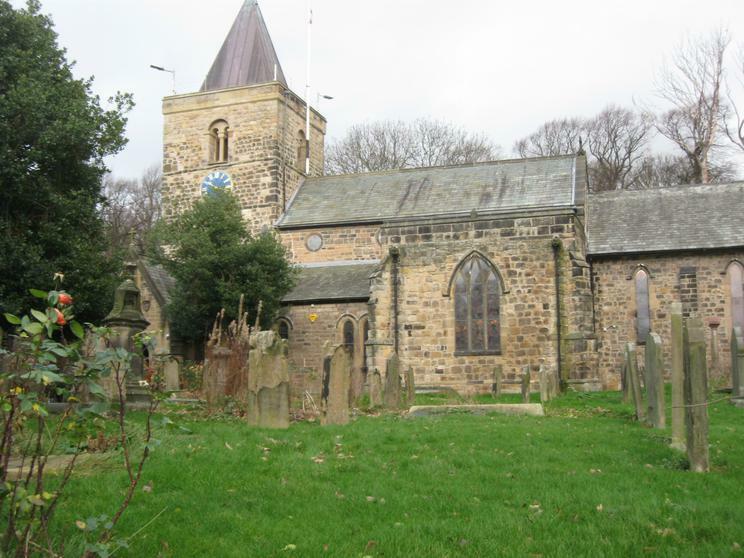 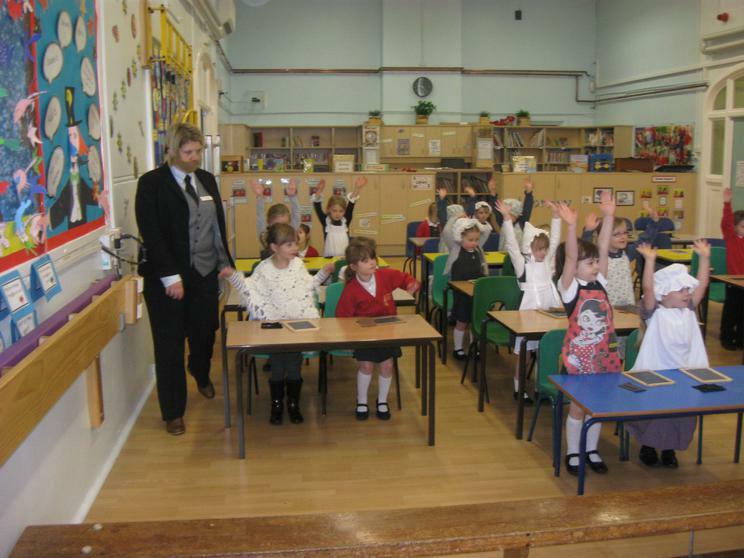 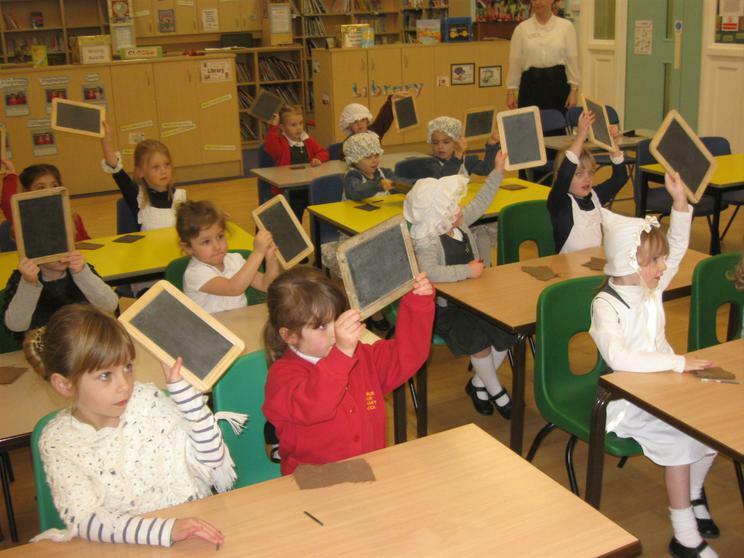 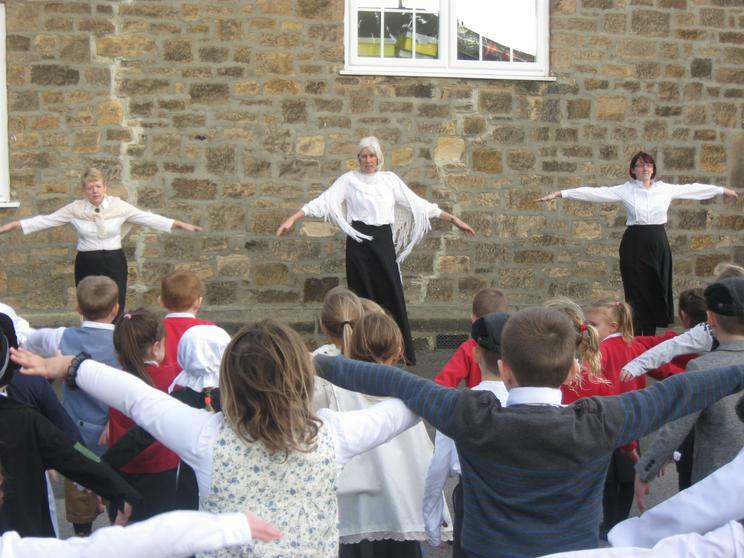 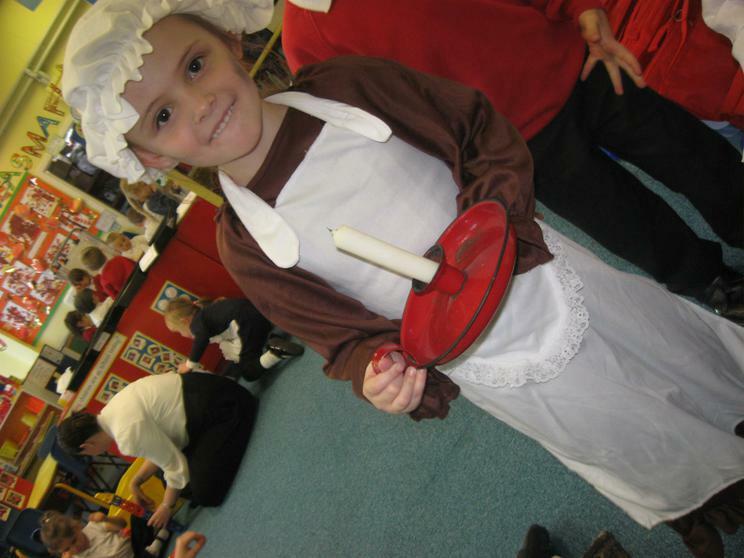 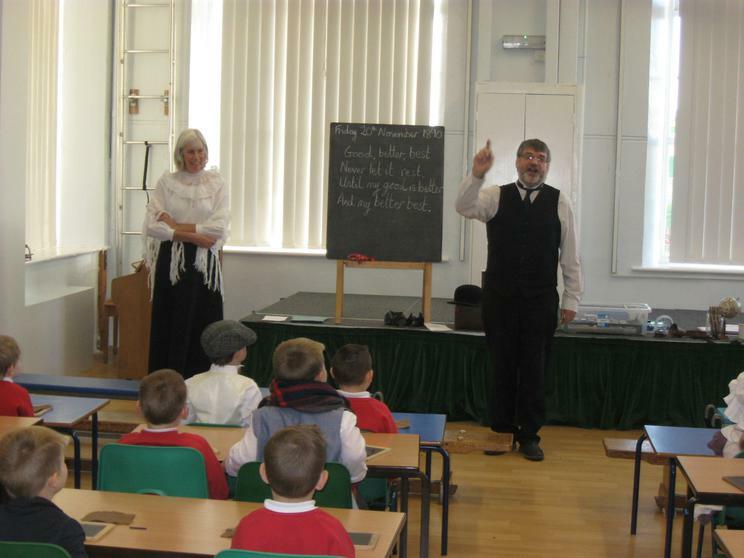 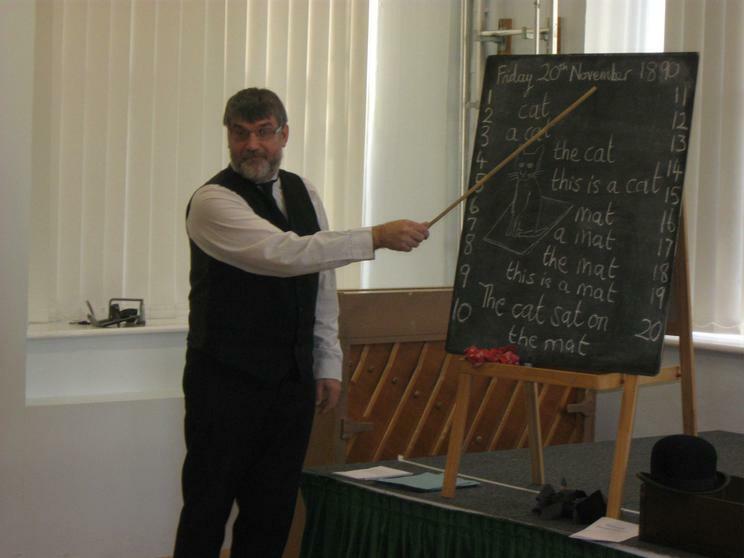 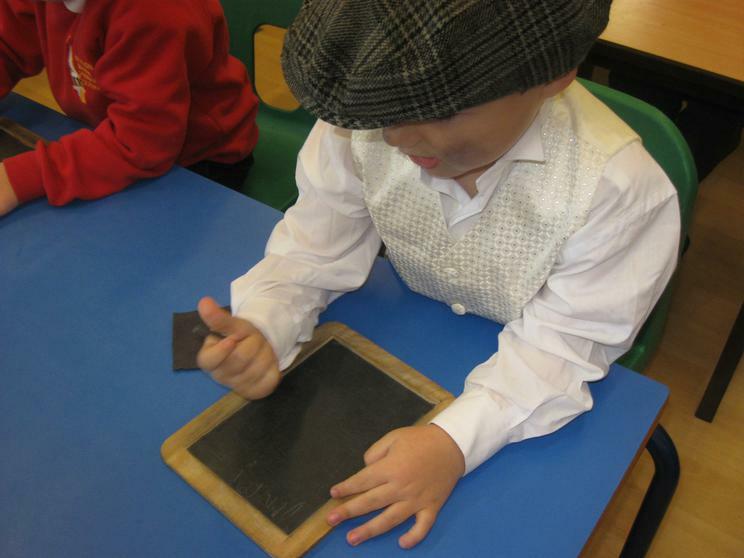 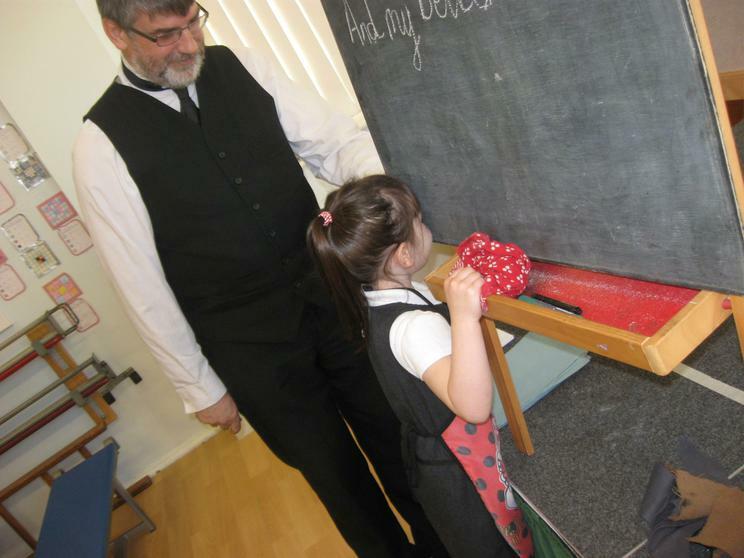 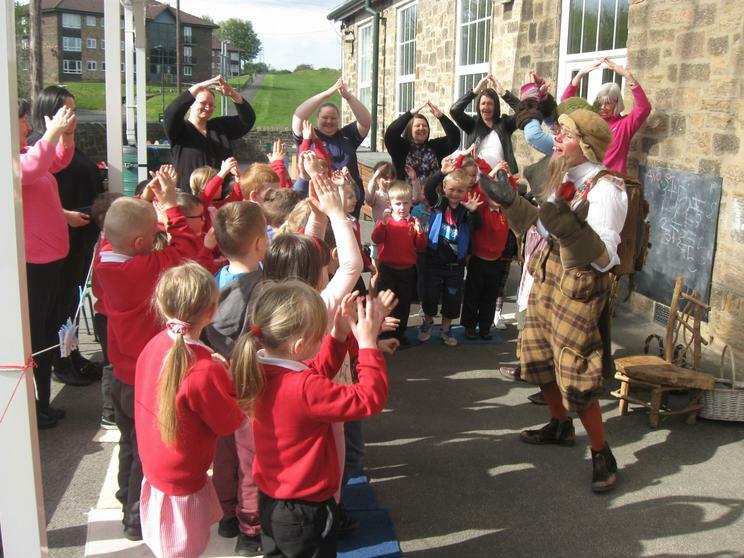 We found out what it would have been like to have come to Newburn Manor School when it was first opened, 125 years ago. 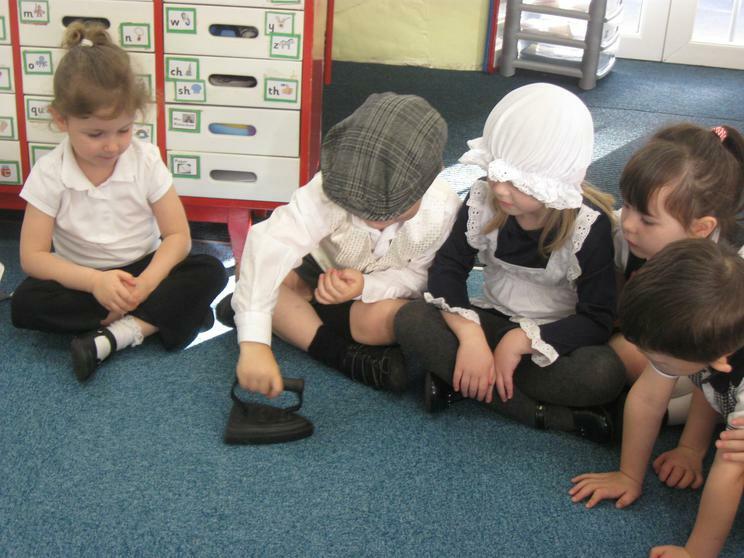 Back in the classroom we investigated artefacts from the Victorian age and tried to guess what these strange objects were used for. 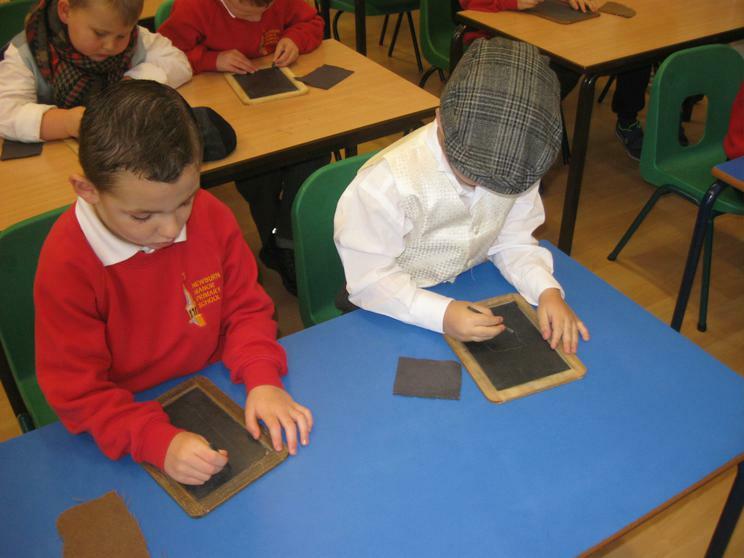 We think people had to work very hard in Victorian times; there are a lot of things we have now that weren't even invented then. 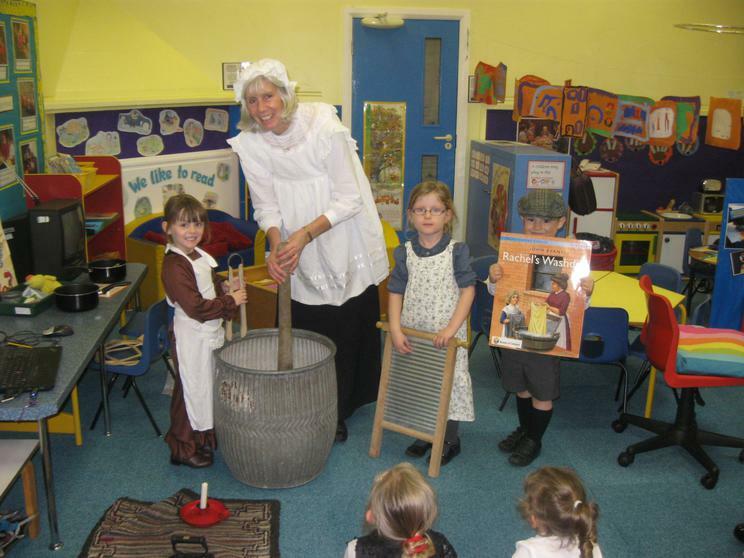 This was especially true when we read an information book about washing day. 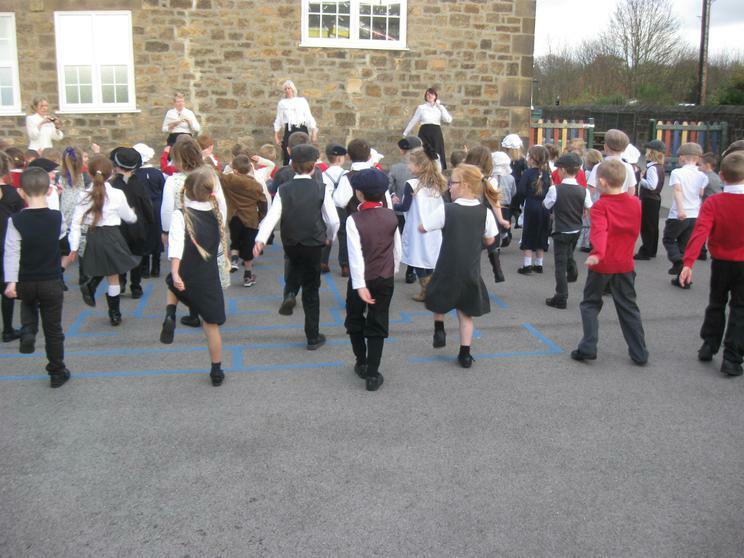 After lunch we did exercises outside, like Victorian PE, and marched around the playground. 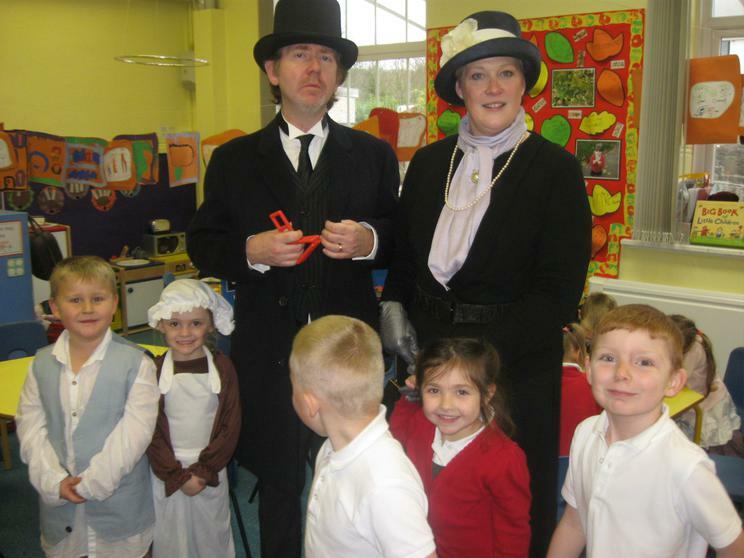 It was really nice to meet 'the Duke and Duchess of Northumberland' who paid our school a visit, as they opened it 125 years ago! 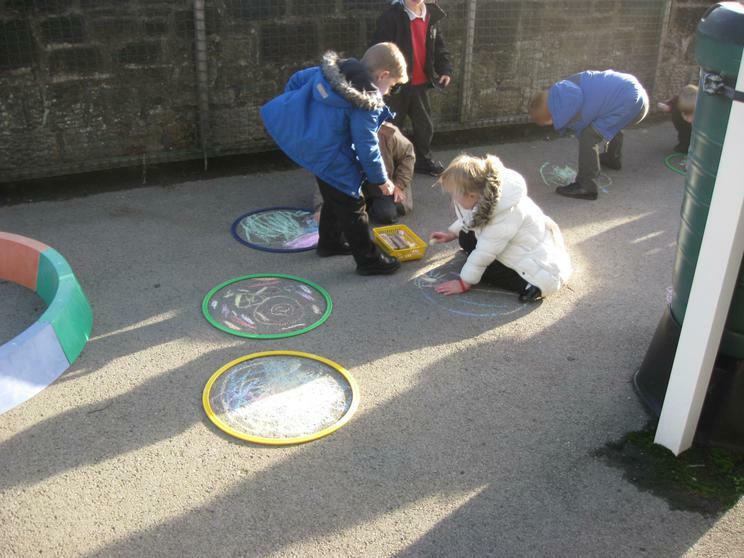 We have been learning about the Hindu celebration of Diwali and have created rangoli patterns, cards, diva lamps and special sweets called 'barfi'. 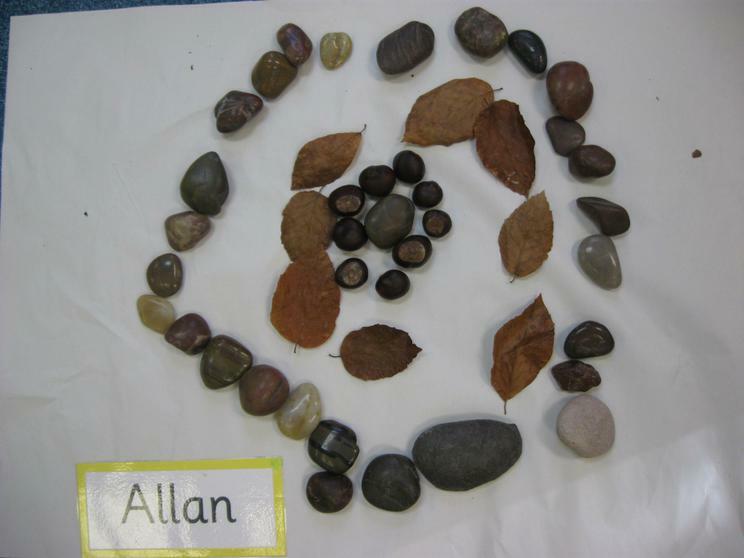 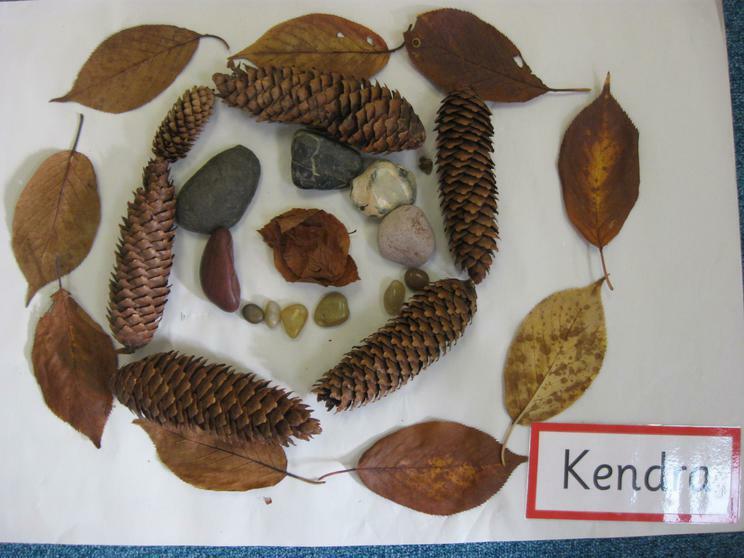 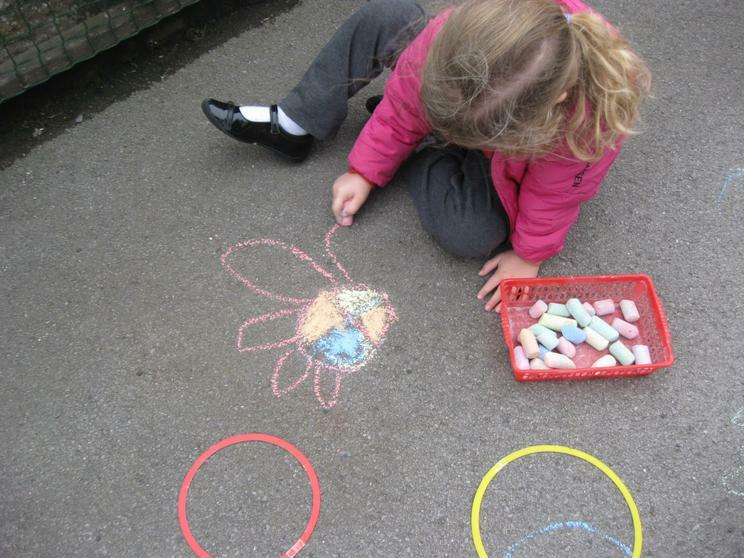 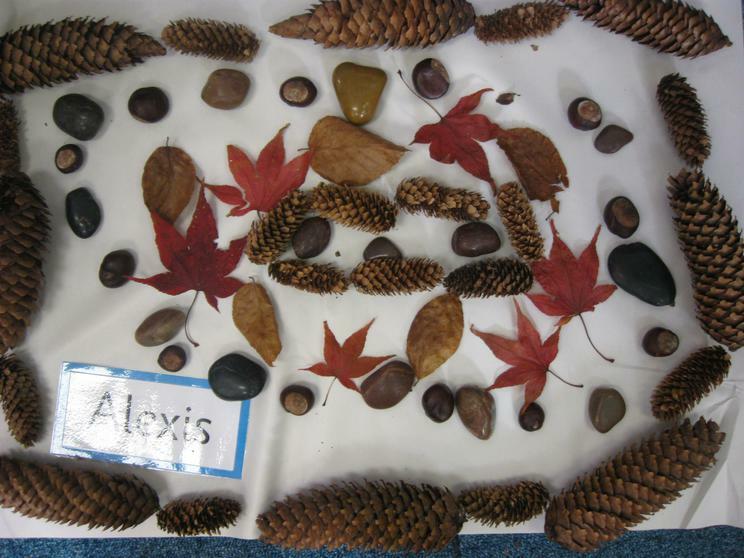 We used autumn leaves to make patterns in the style of Andy Goldsworthy. 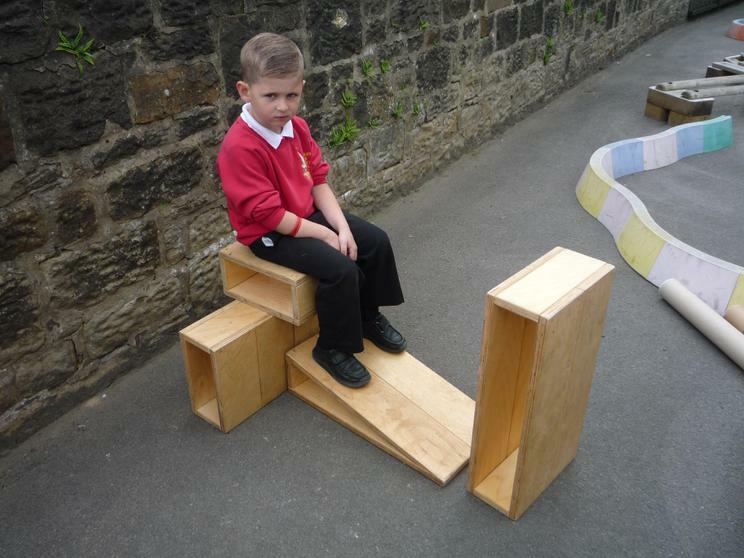 Here are a few examples of our finished work. 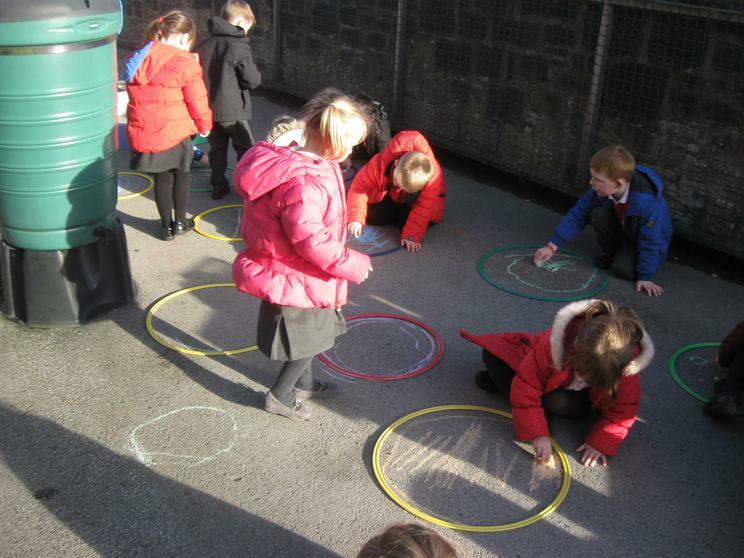 The Road Safety lady came to talk to us about keeping safe on the roads. 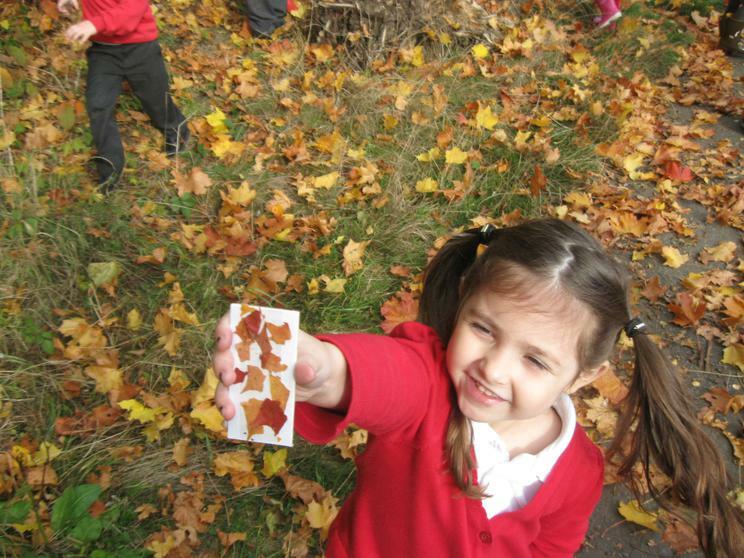 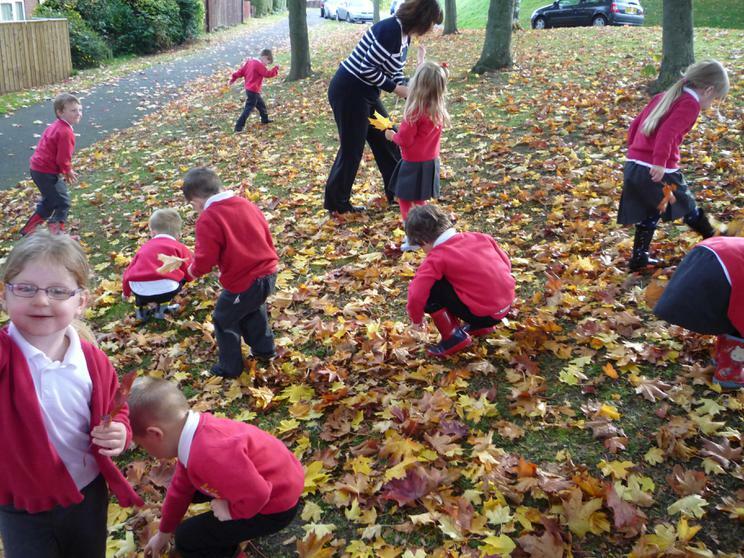 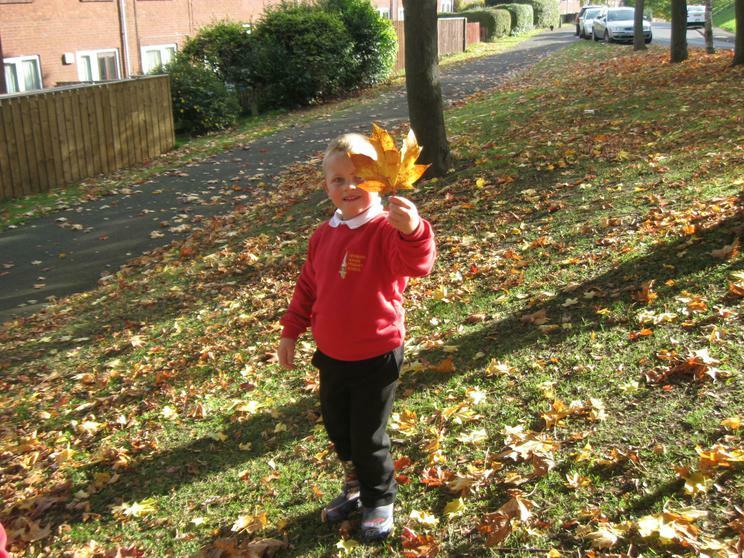 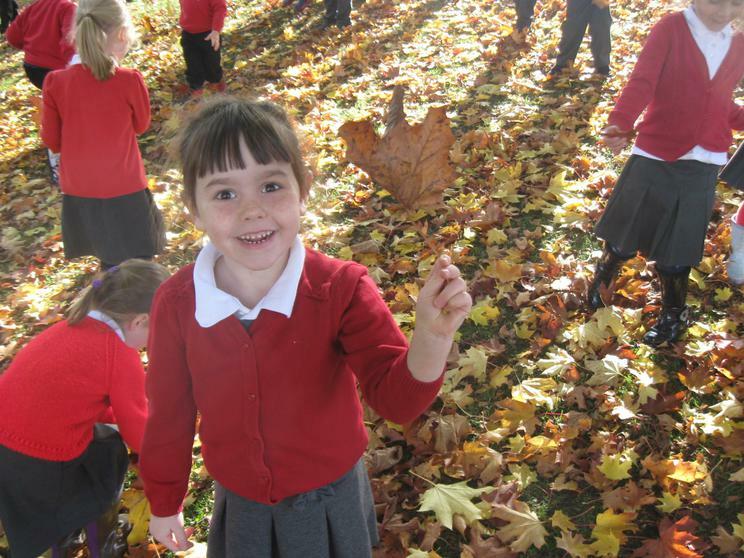 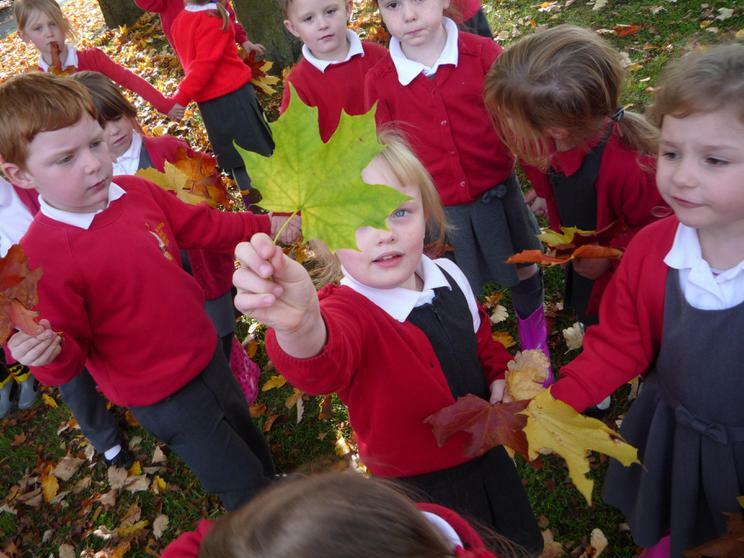 Well done to all who managed to collect leaves and write down their child's observations. 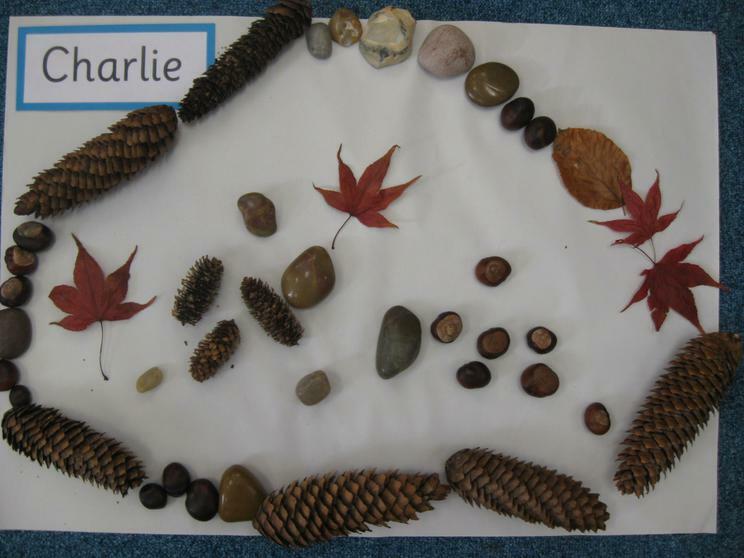 Super October half term homework - here are just a few of the examples, thank you. 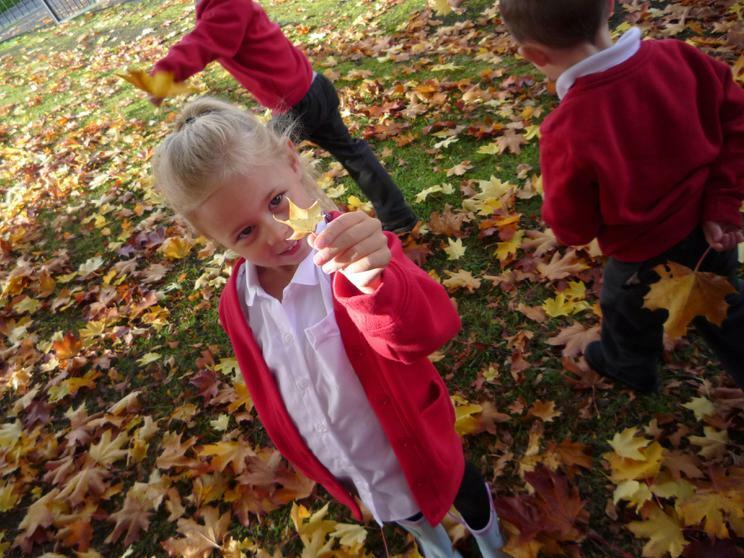 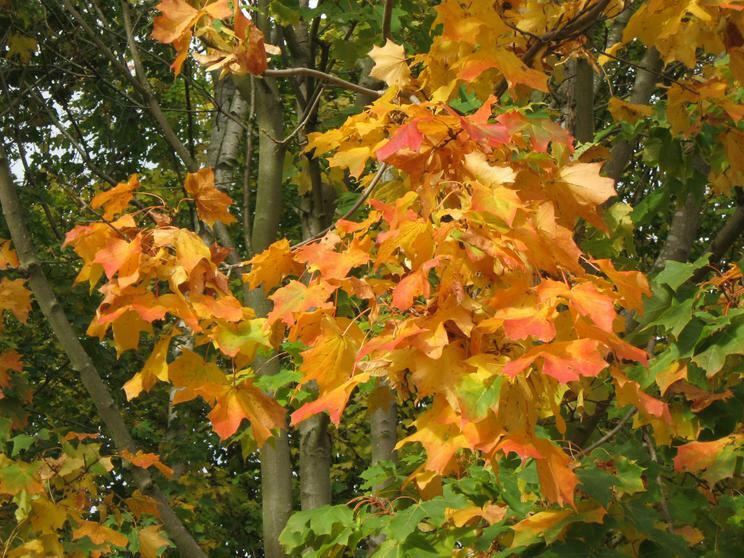 We have been noticing changes in the trees around our school, and some children have found interesting leaves to bring to school. 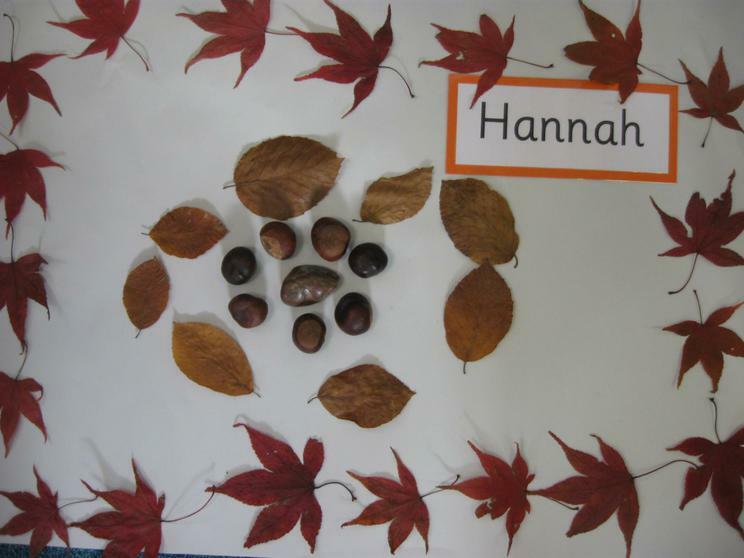 Mrs Richardson brought in some prickly horse chestnut shells, with shiny brown conkers hiding inside, and some acorns still in their special acorn cups - the squirrels must have missed those ones! 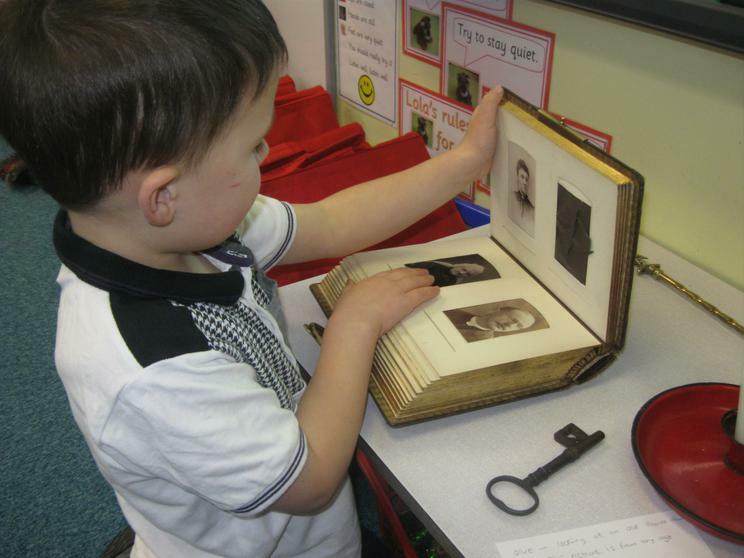 Look at the photographs to see some of the things we saw and did. 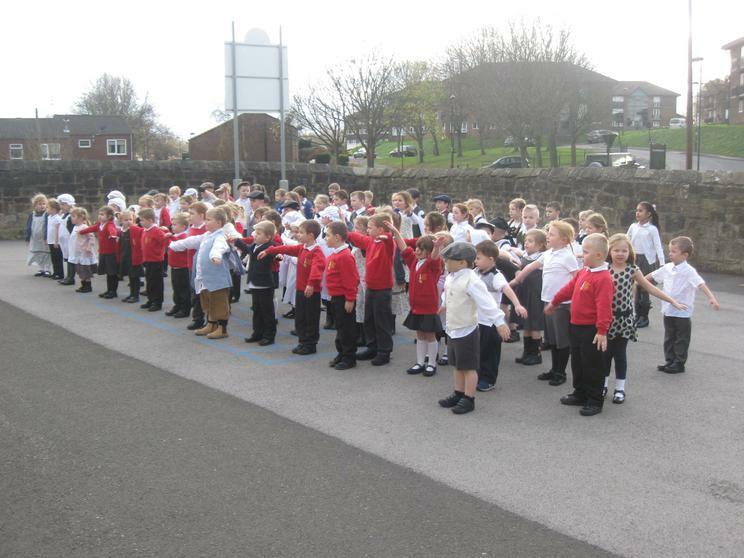 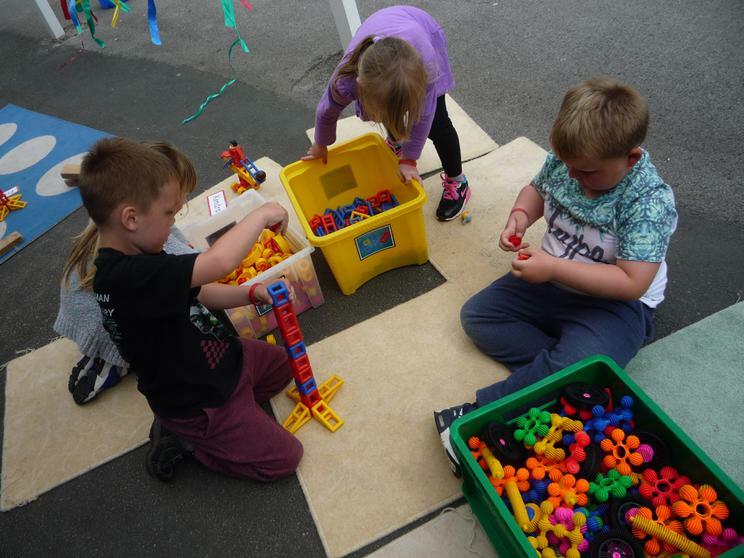 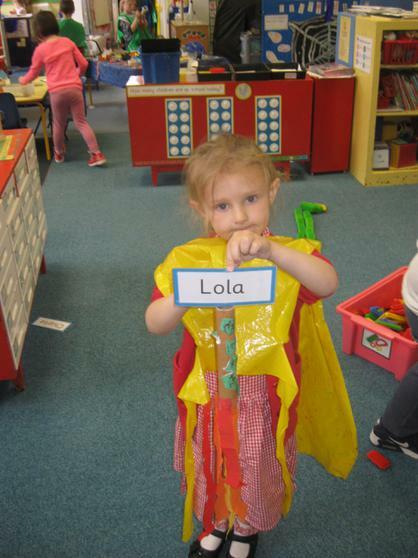 We have come from quite a few different Nursery classes but now we are all part of the Reception class, and belong to Newburn Manor Primary School. 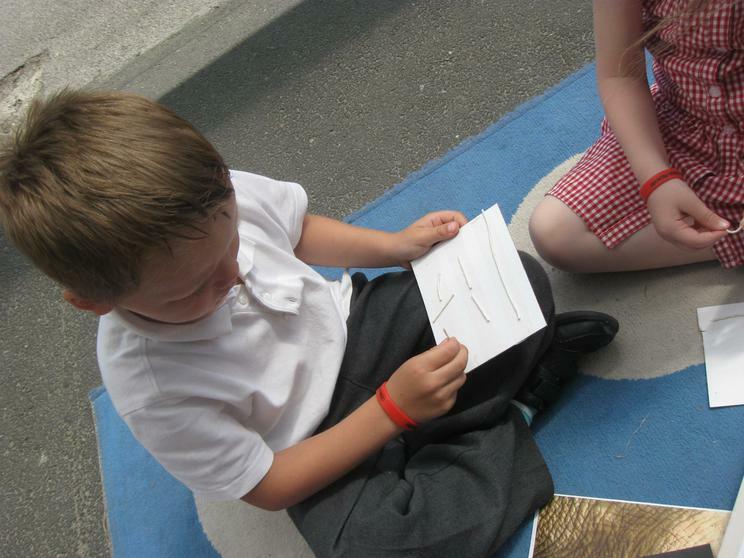 We have learnt each others names and made lots of new friends. 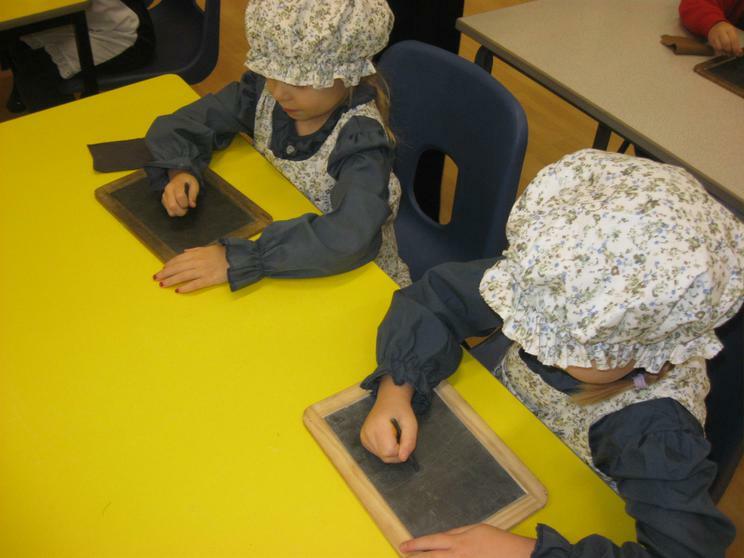 We have been on 'tours' of the school with Miss Luke, and peeped into some of the classrooms where the older children work. 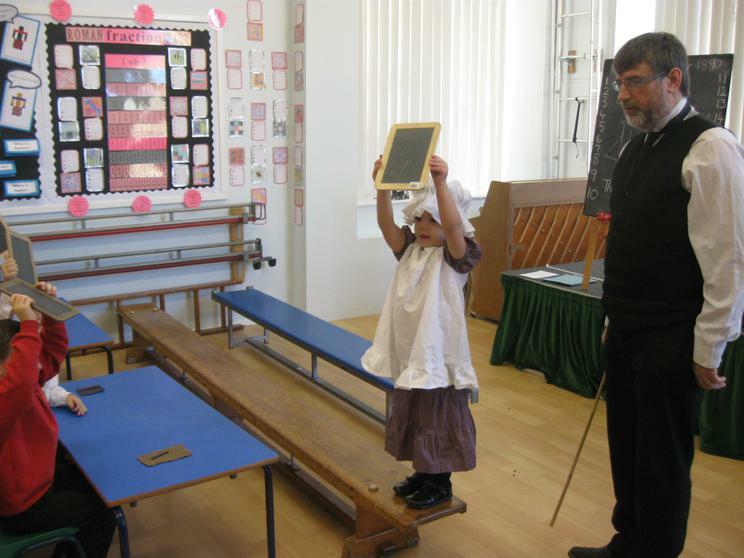 The classrooms look very different from ours. 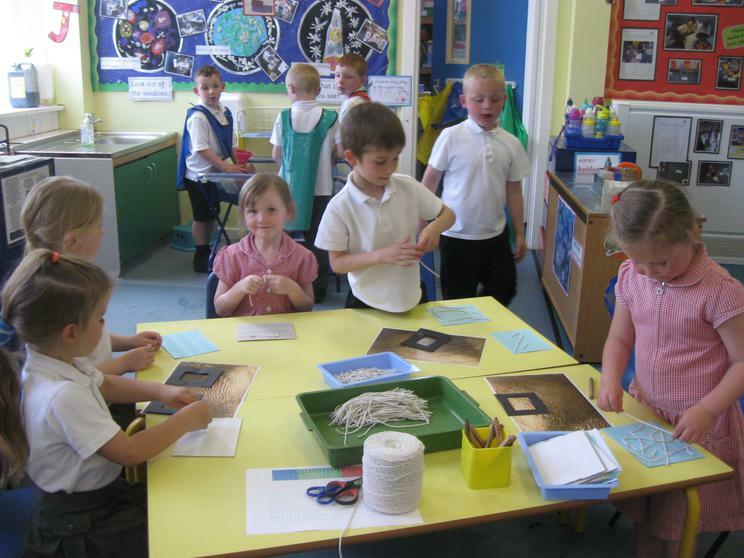 We will soon be joining family groups to meet, and make friends with, children form all age groups in our school. 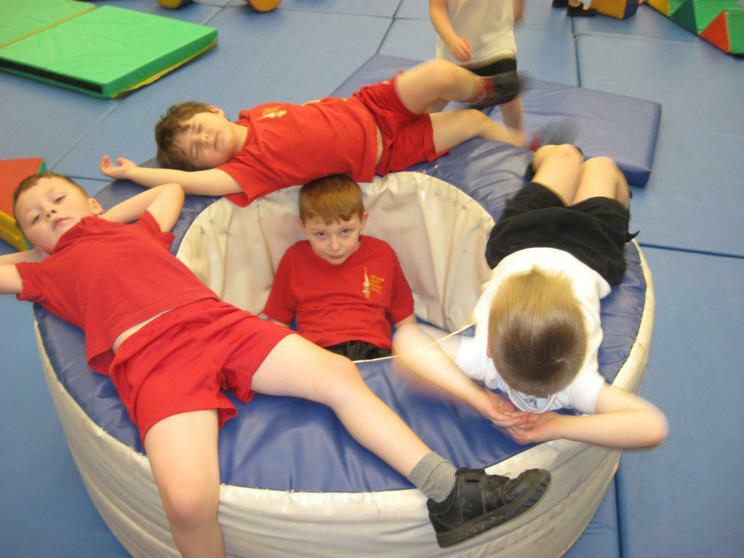 Which grown ups have you met? 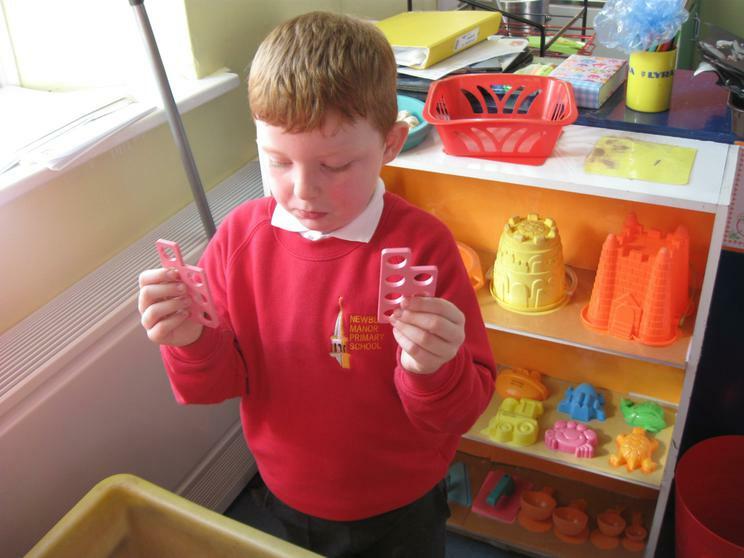 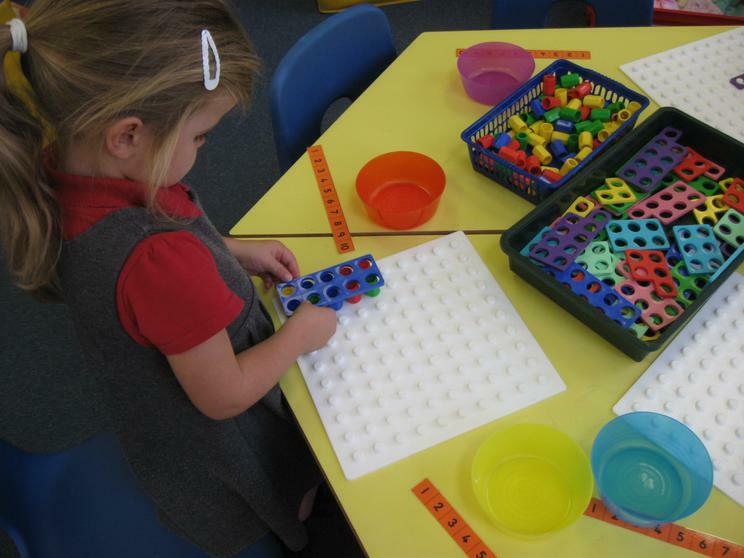 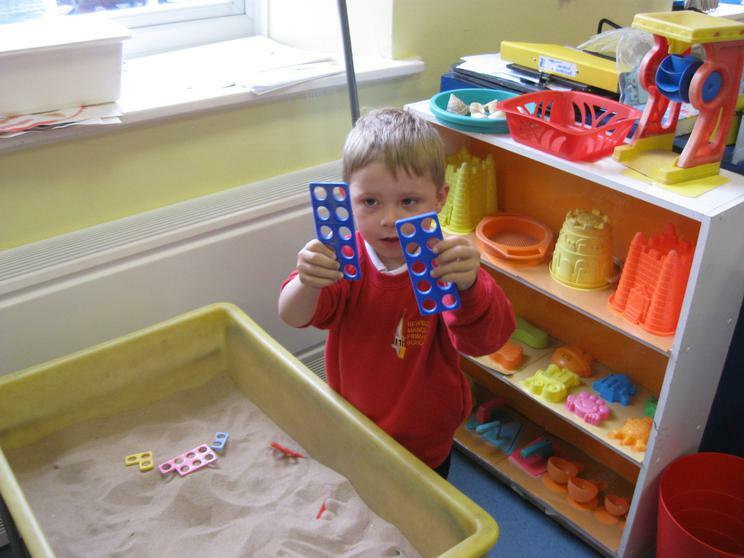 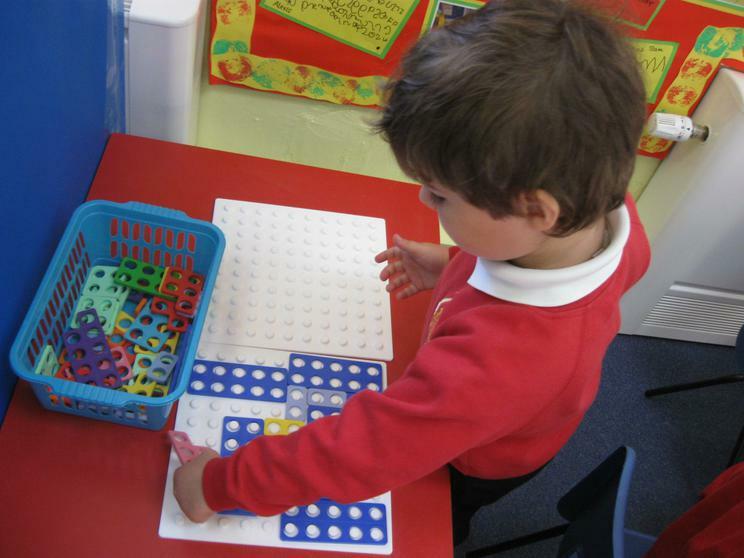 We have been playing with Numicon to support our number work. 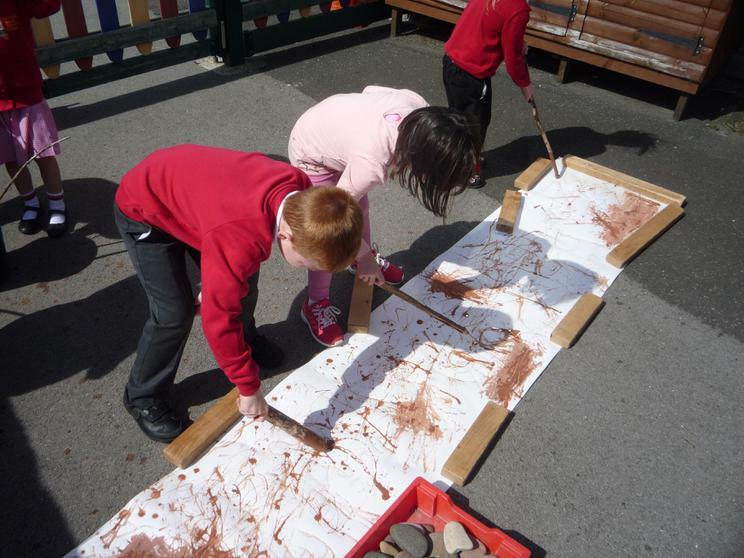 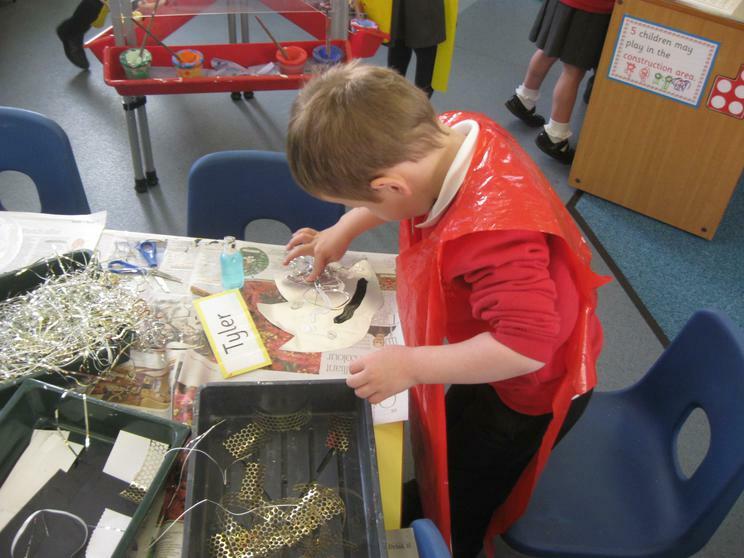 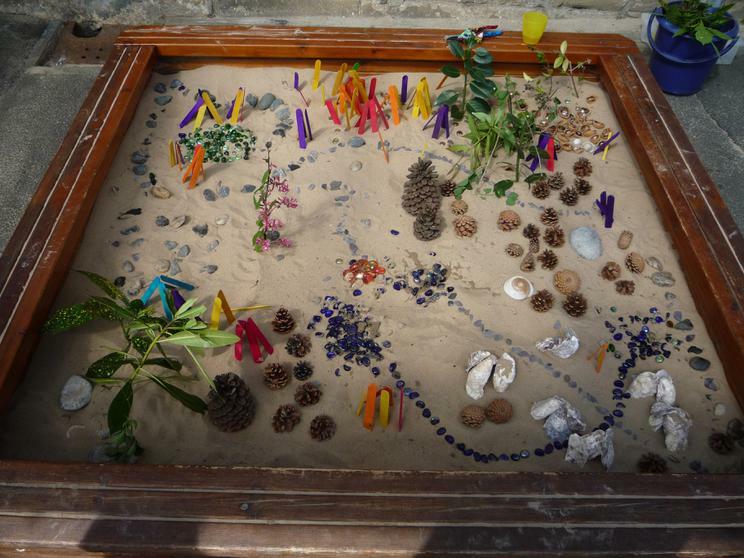 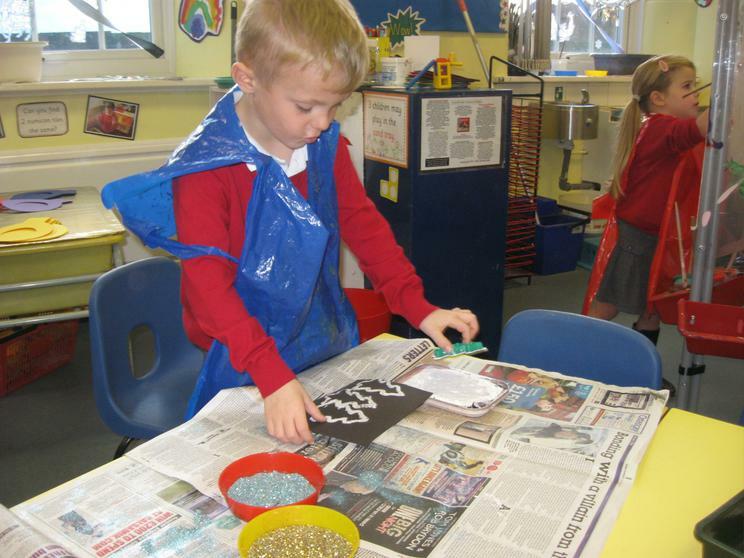 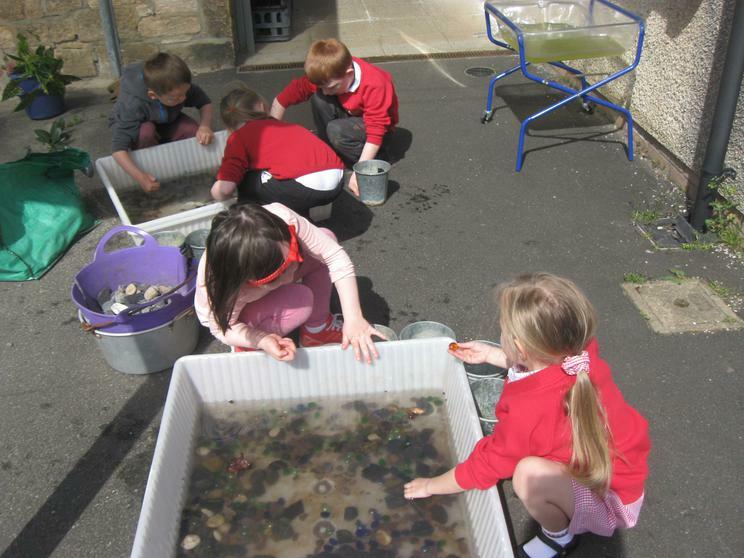 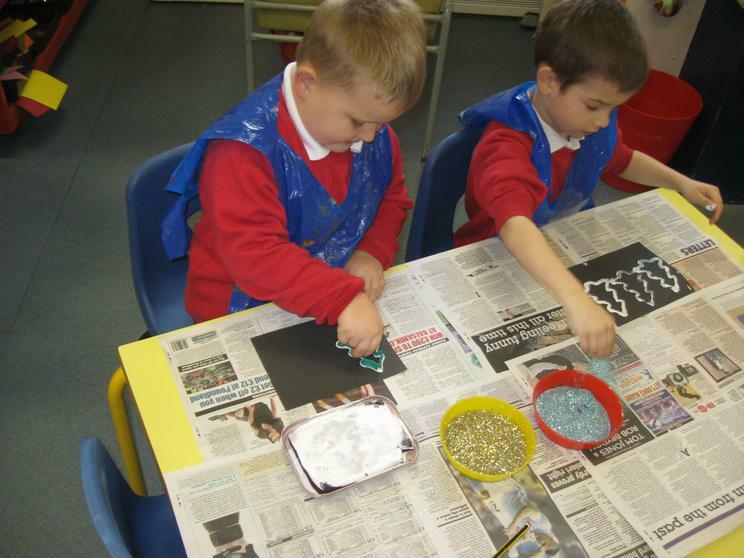 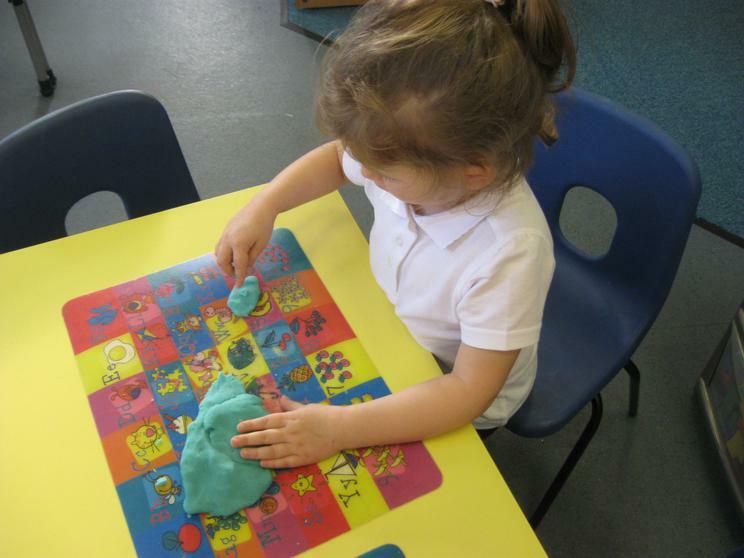 We have played with the tiles in the water, sand and playdough. 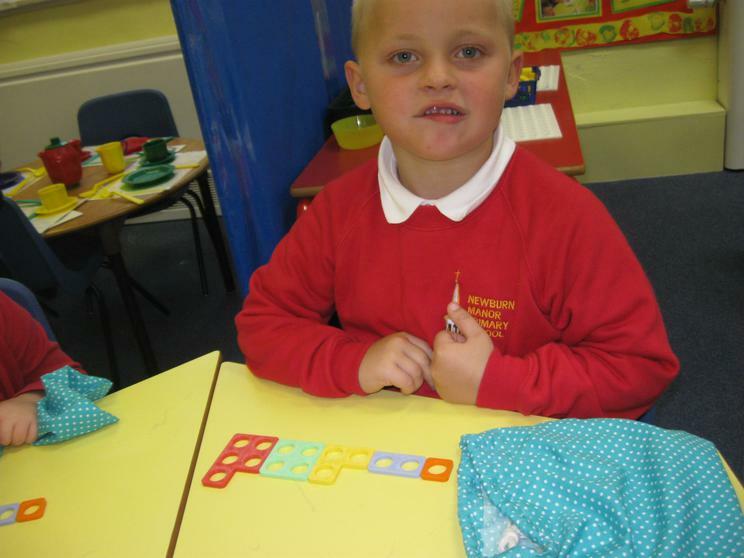 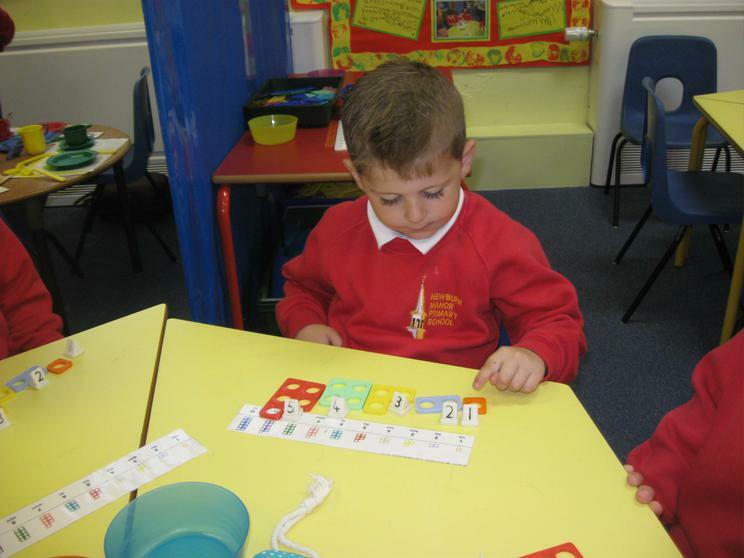 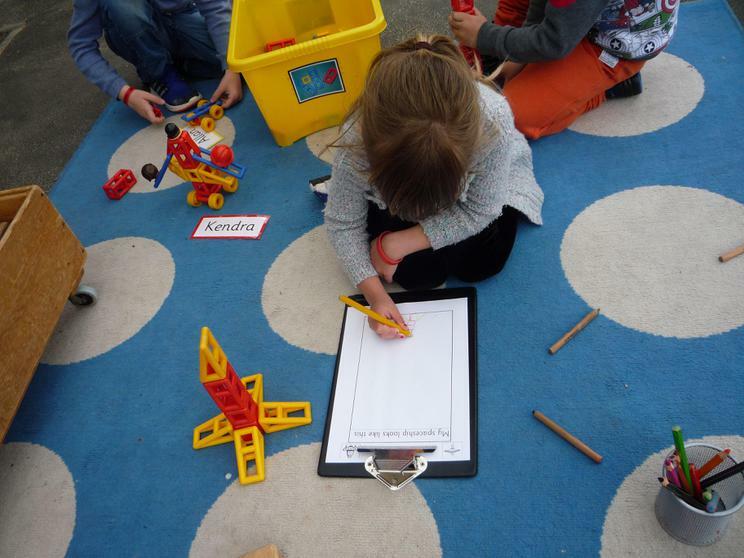 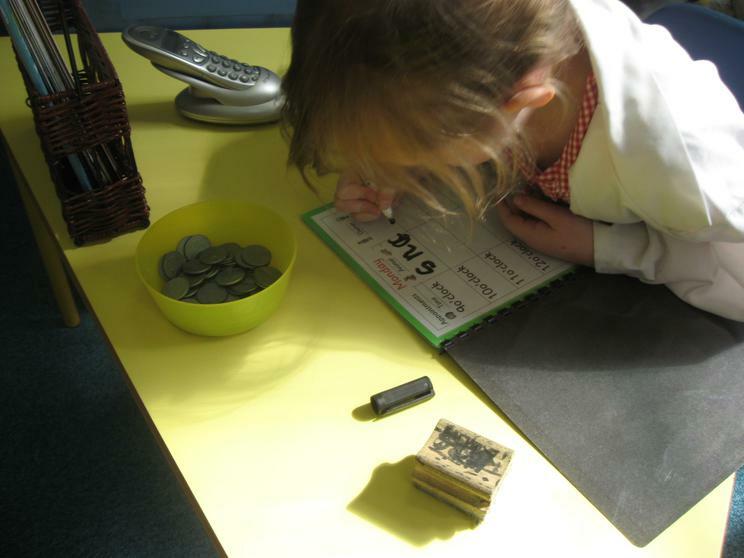 We are finding out about their different colours and sizes and we are now discovering they have different values. 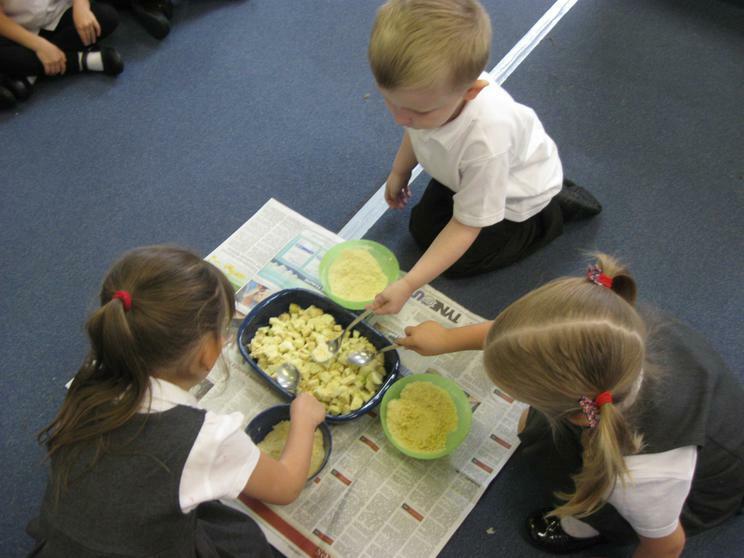 We made a delicious apple crumble at school. 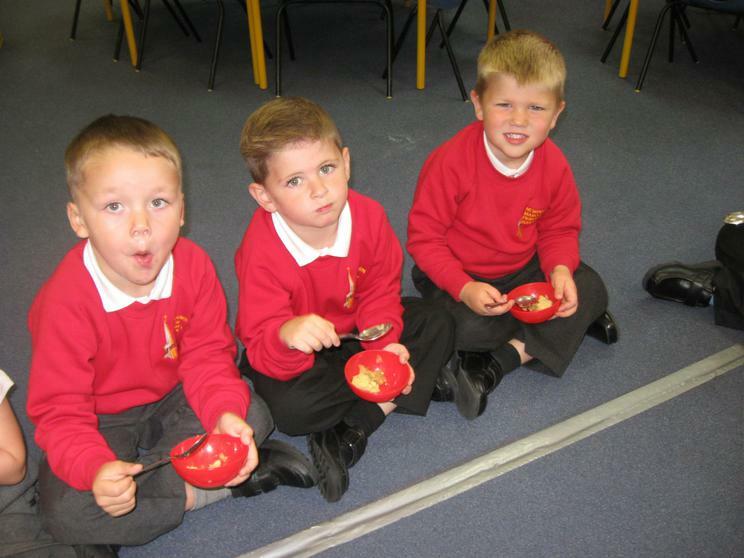 Mrs Richardson collected some apples that had fallen off her apple tree. 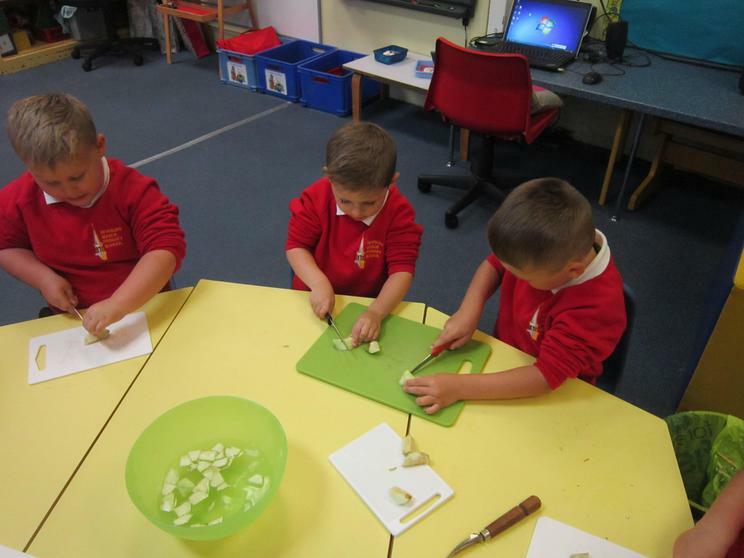 Miss Luke peeled them then we carefully chopped them up with sharp knives. 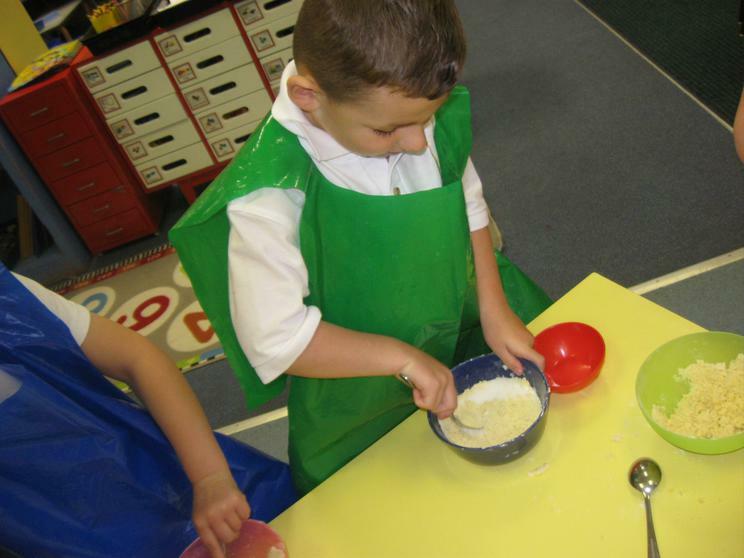 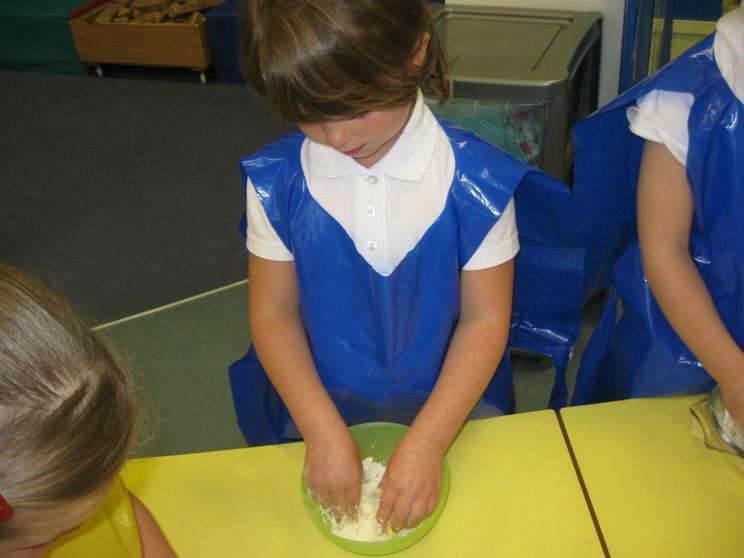 While we did that other children were rubbing together the flour and butter, then mixing in the sugar to make the crunchy crumble topping. 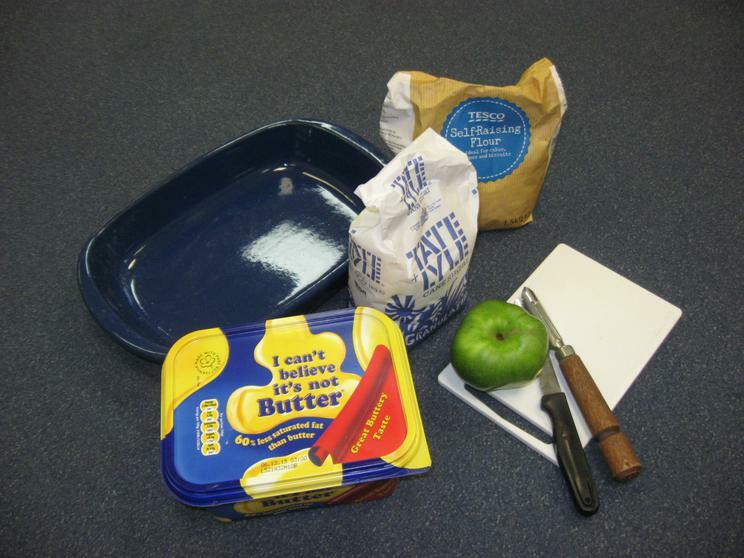 We went to the staff room to put the crumble in the oven. 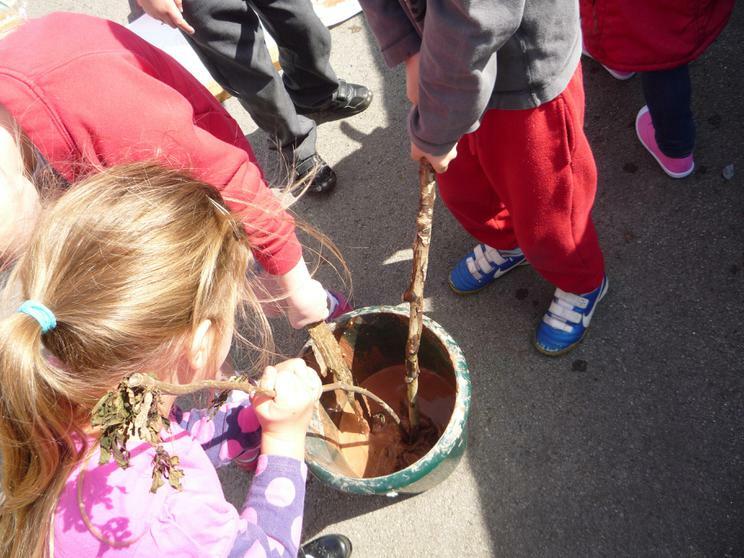 When it was cooked, and warm and golden we took it out ... and ate it! 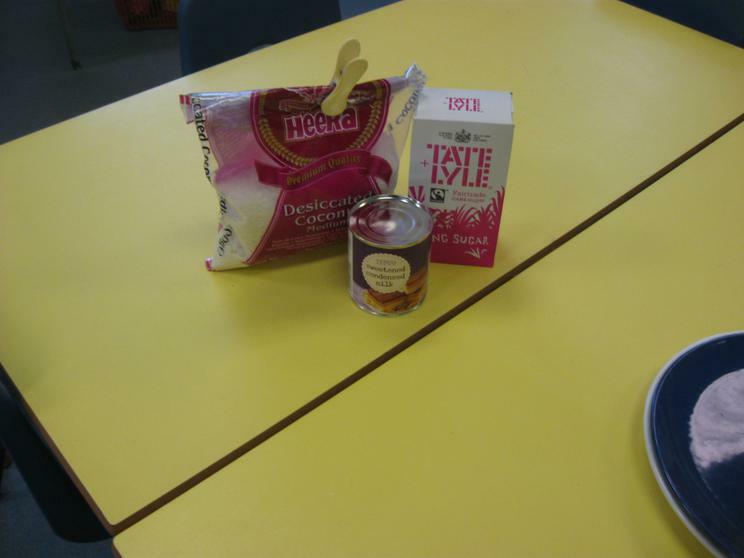 Mmmmmm, it smelt and tasted good - so good that Mrs McFadyen came along and asked us to write out a recipe so she could make some. 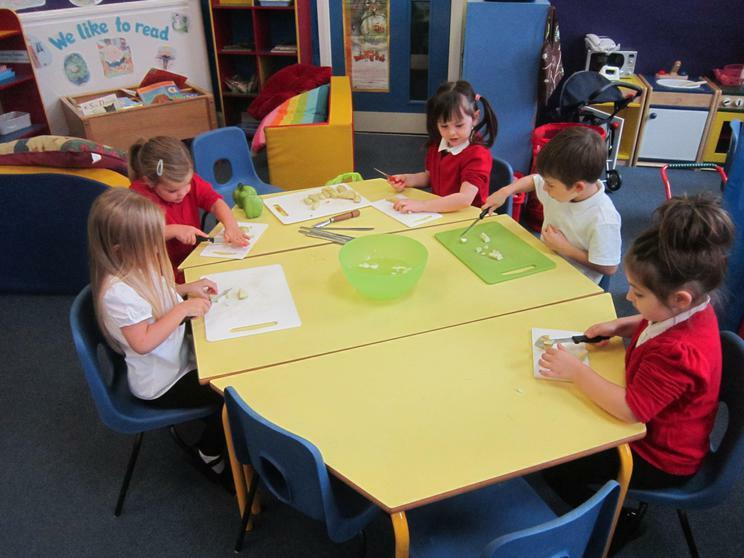 So the next day we did our own recipe writing - all displayed in the classroom if you would like to come and look. 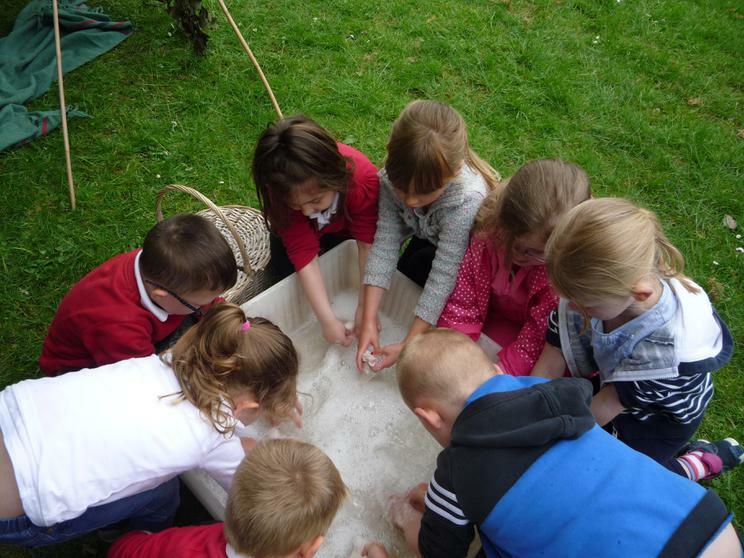 We went to meet the chickens! 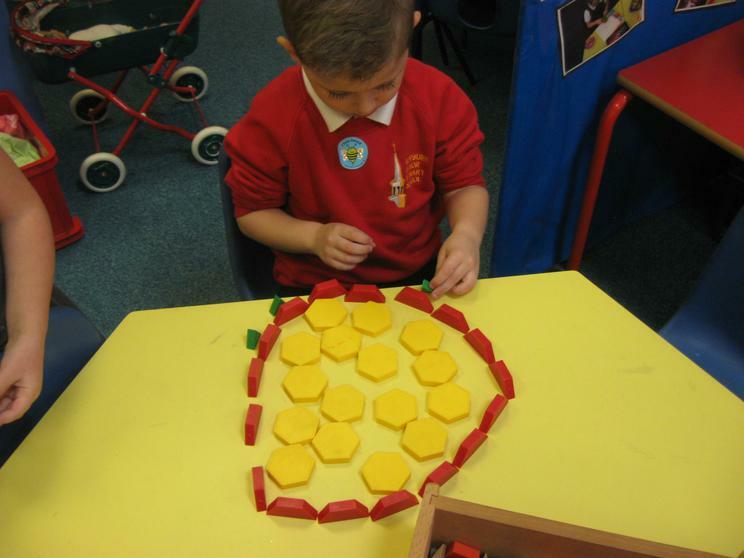 We fed them and looked inside the hen house to see how many eggs had been laid.